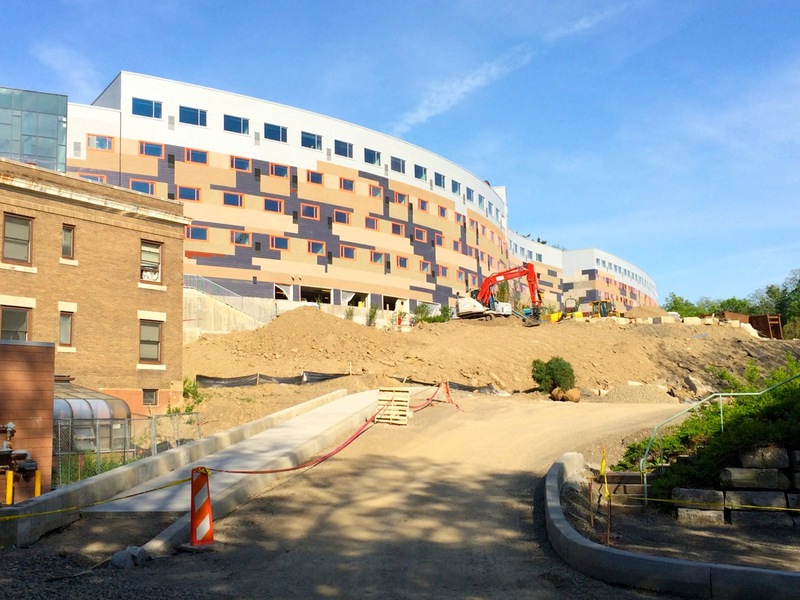 So admittedly, I post a lot of photos of this project, but it’s quite a spectacle now that the site is relatively opened-up. 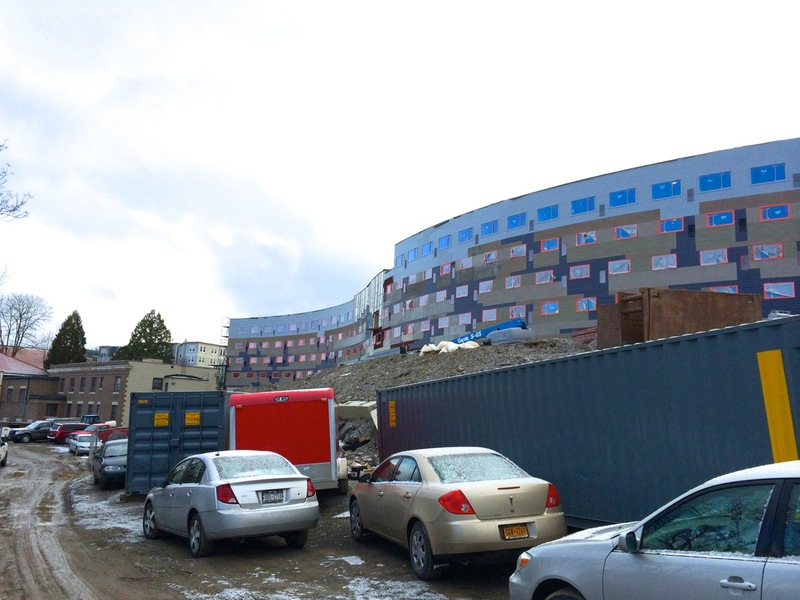 It looks like Welliver has completed their major portion of the work contract for Novarr-Mackesey, and crews for interior finish work and cleaning have moved on site to have the apartments ready for incoming occupants; on the left (west) side, Building 5 contains 167 units and Building 6 (east) contains 71 units. 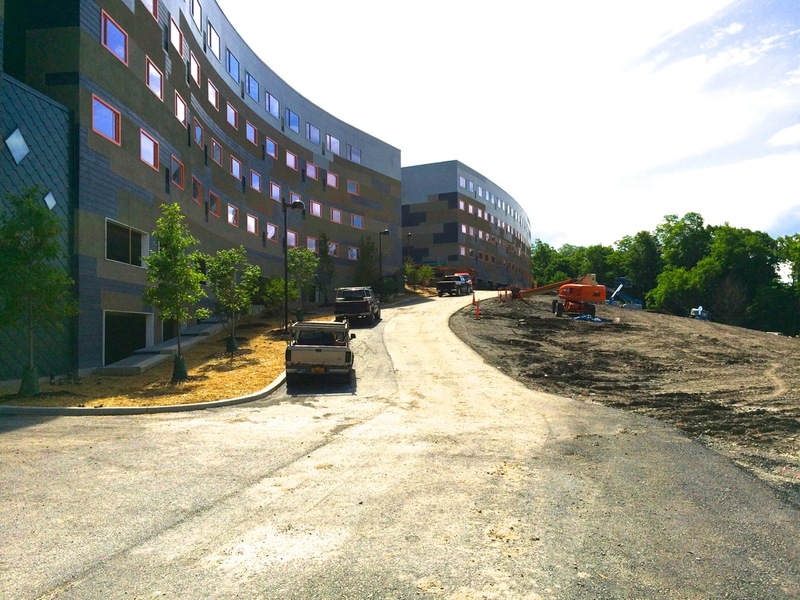 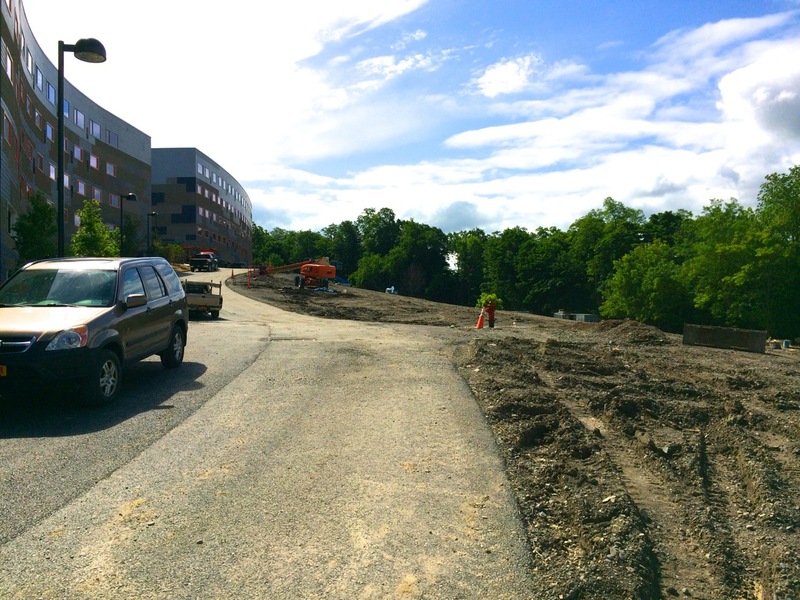 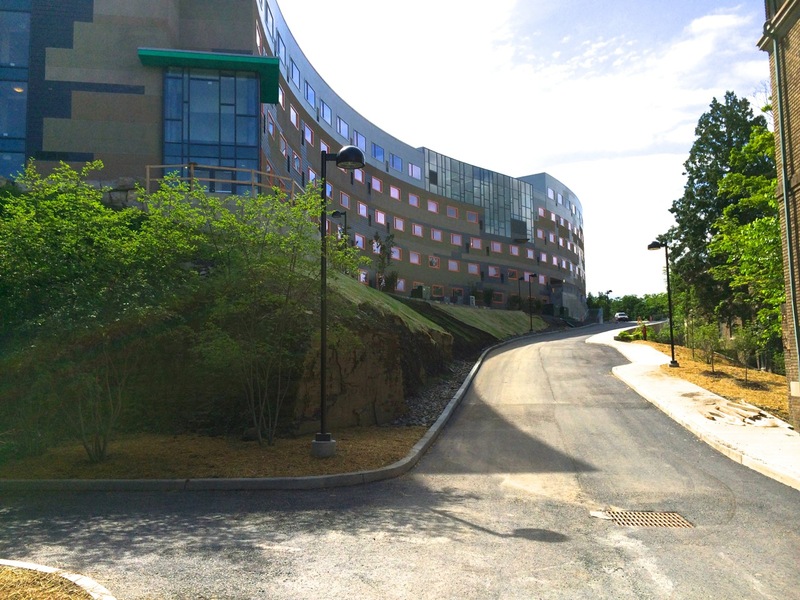 Landscaping work has been progressing around the building edges, and the new drive lanes south of Buildings 5 & 6 have been paved and curbed. 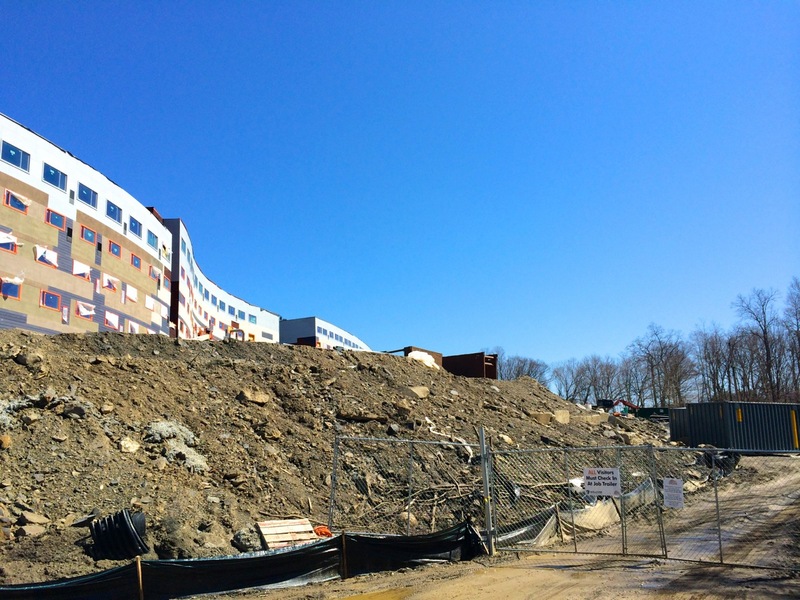 There will probably be some sort of barrier or fence constructed along the south slope for excavation work for the final structure, Building 7, which will be the largest, likely to come-in at 247 units. 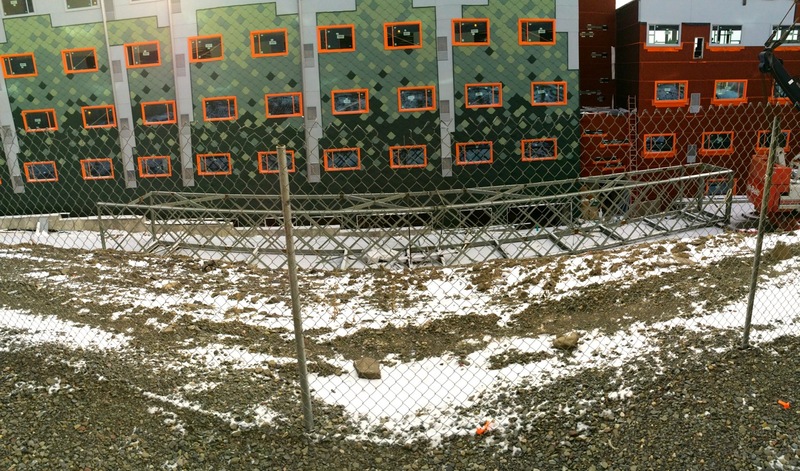 I’m not sure of a start date, but my guess would be sometime late Fall. 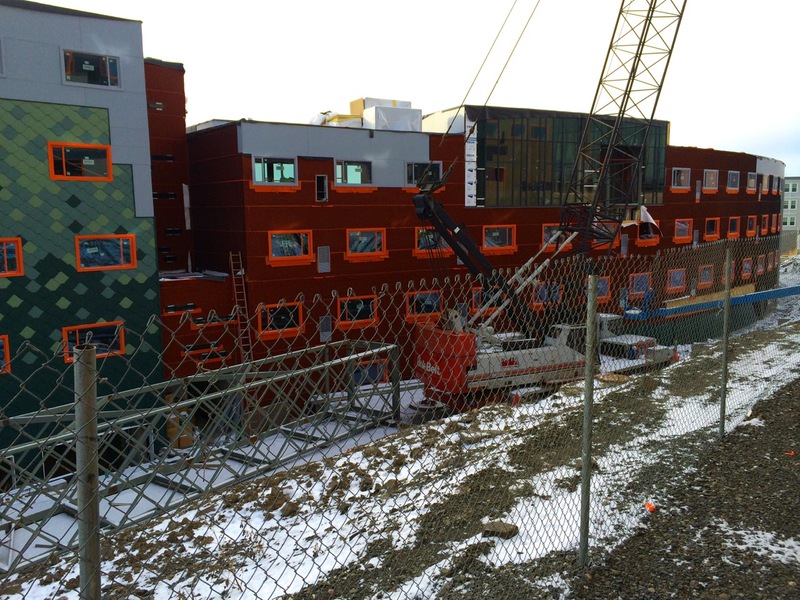 Updated photos here for Novarr-Mackesey‘s Collegetown Terrace Buildings 5 & 6 built by Welliver along the south slope of State Street. 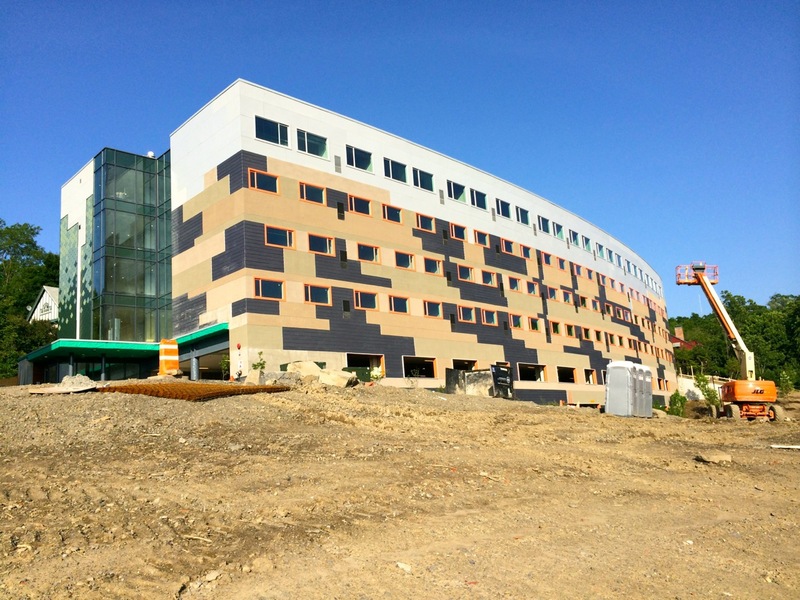 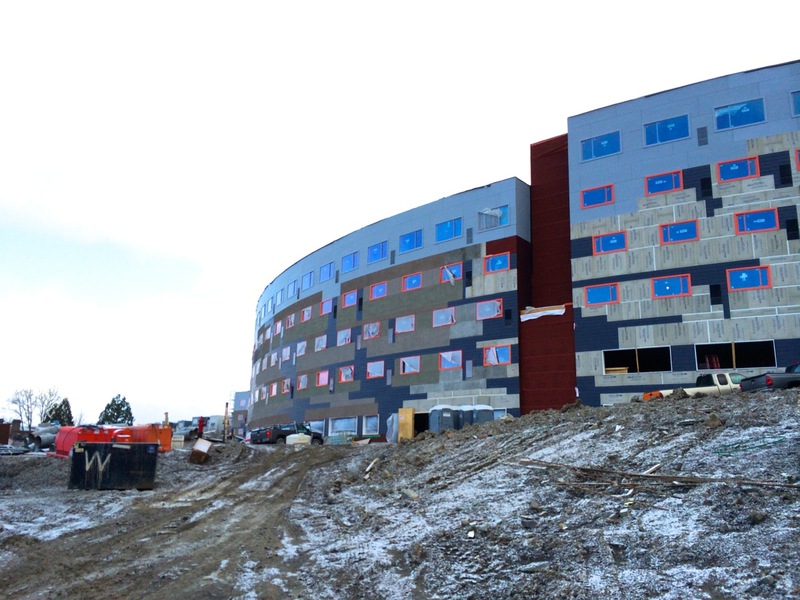 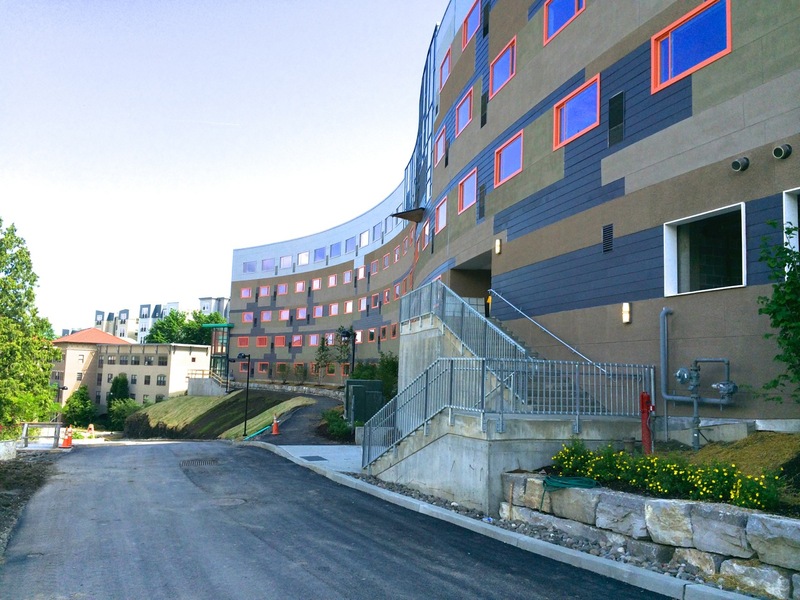 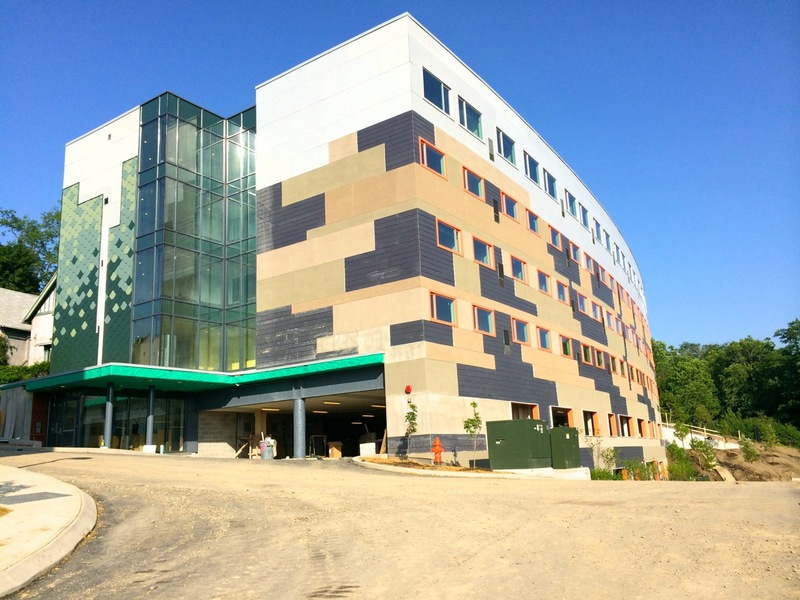 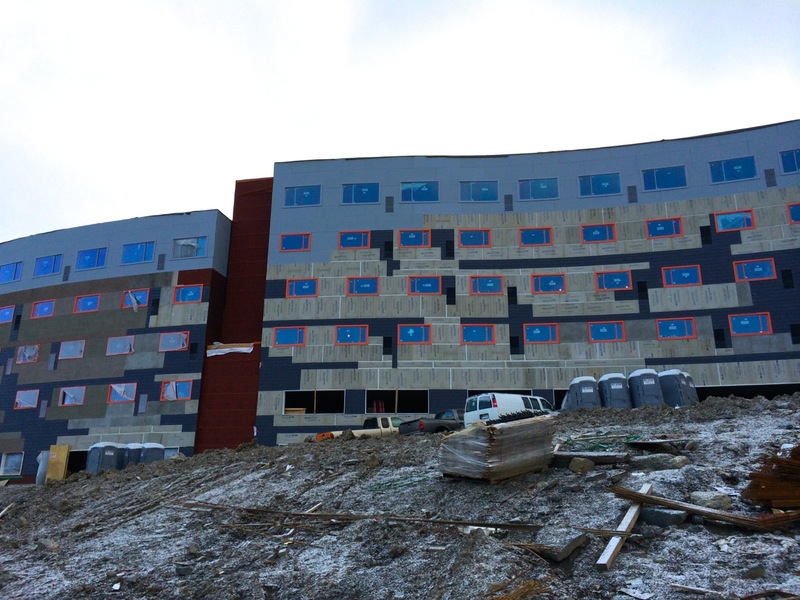 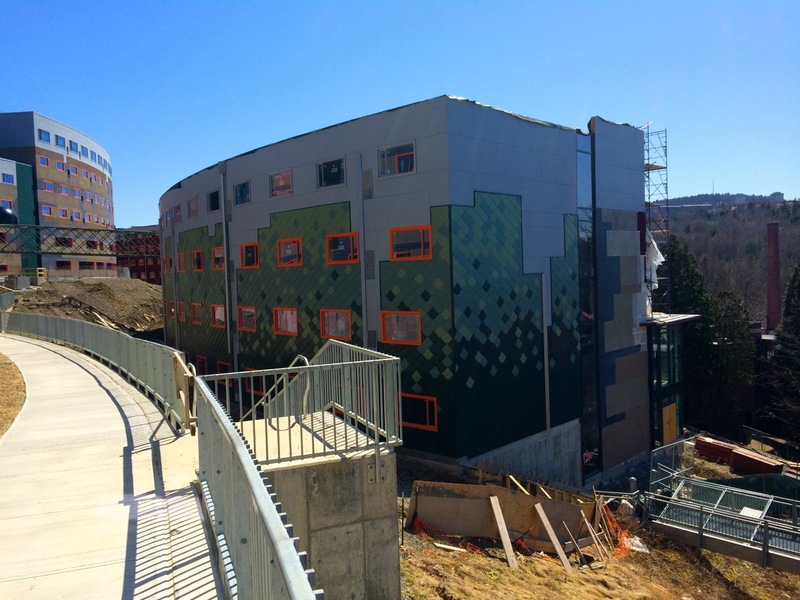 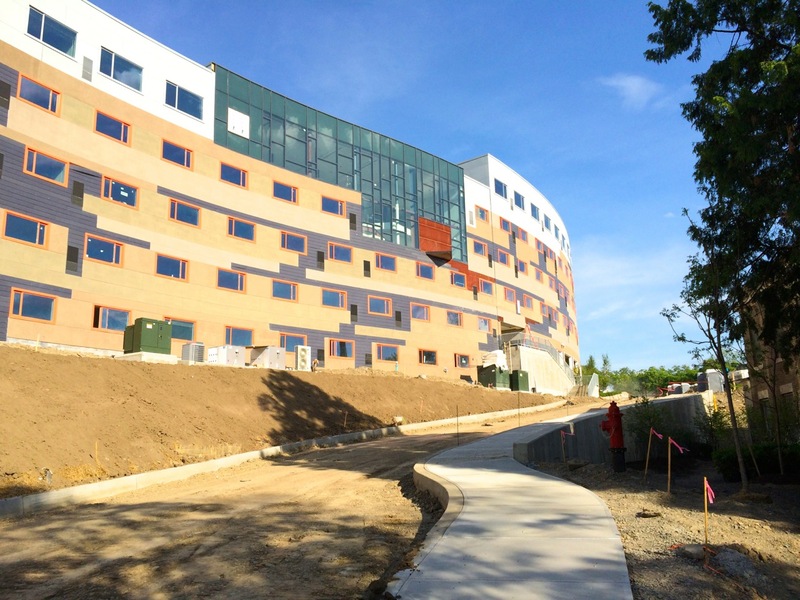 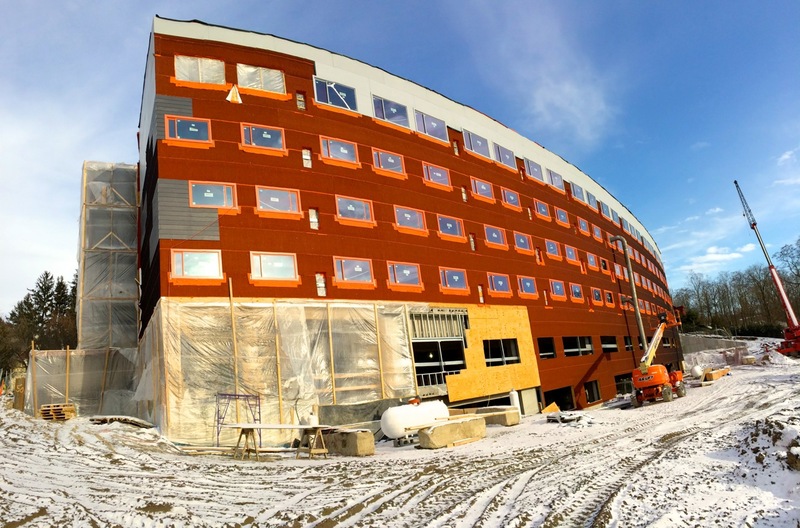 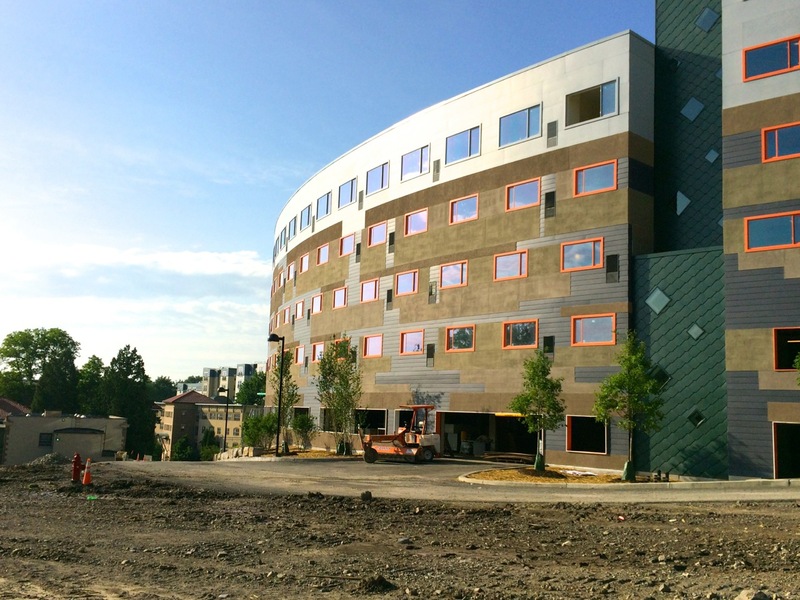 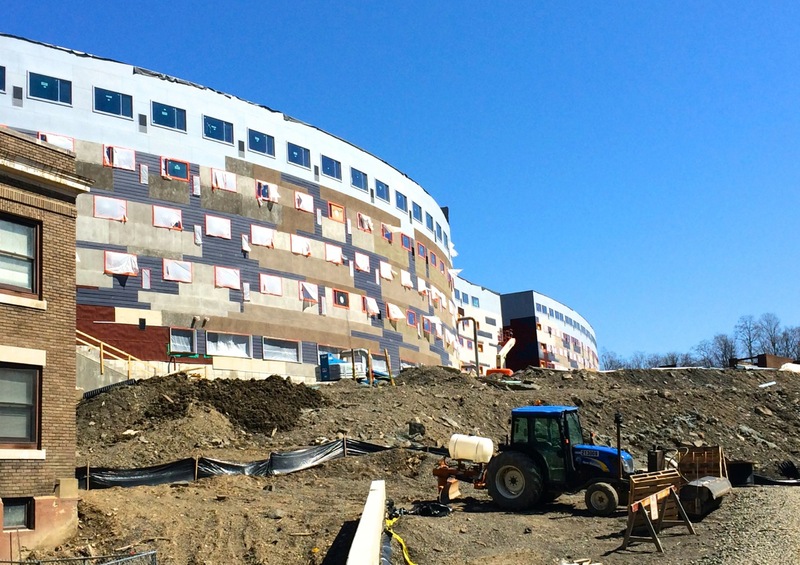 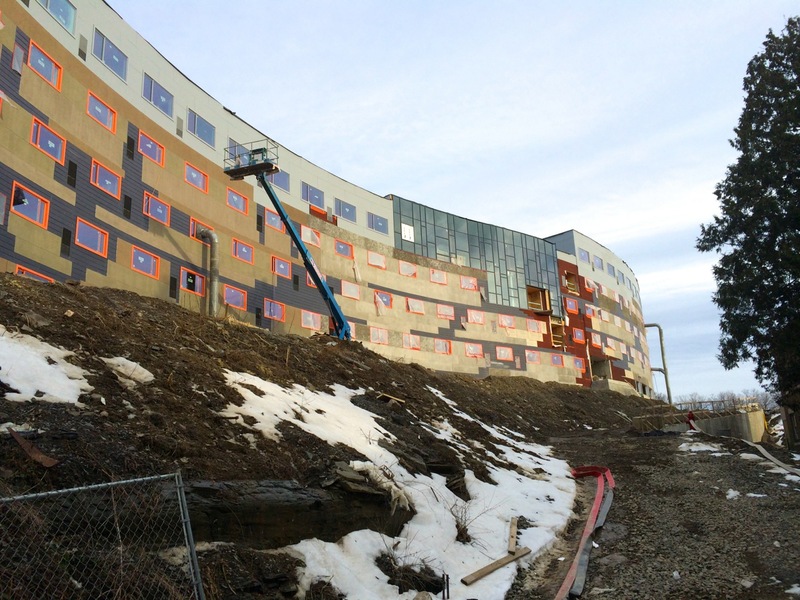 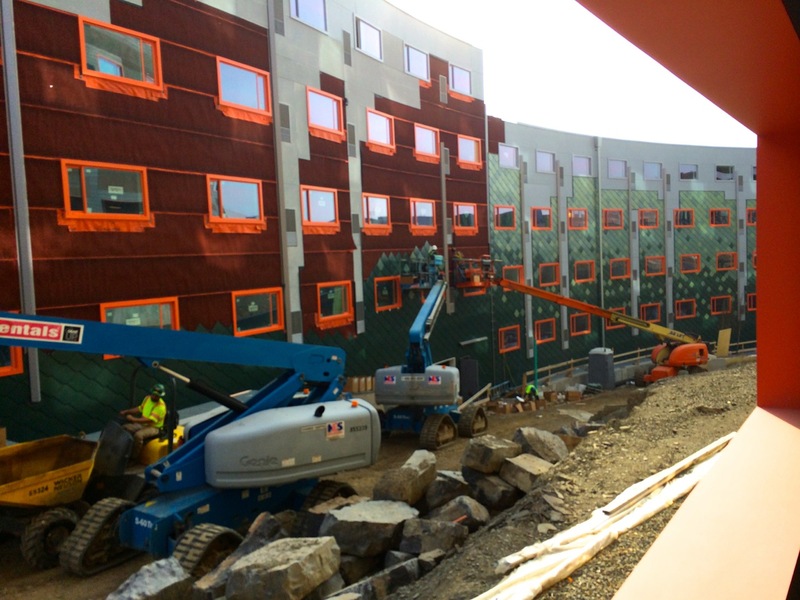 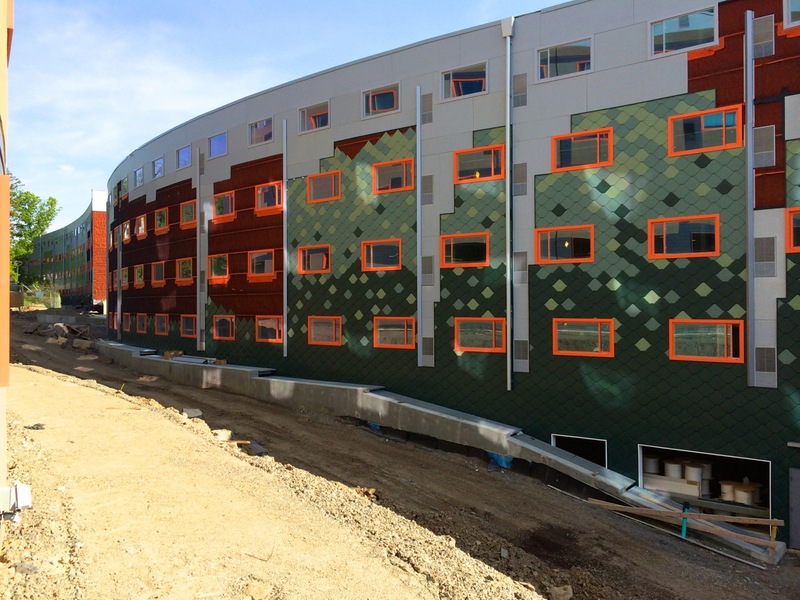 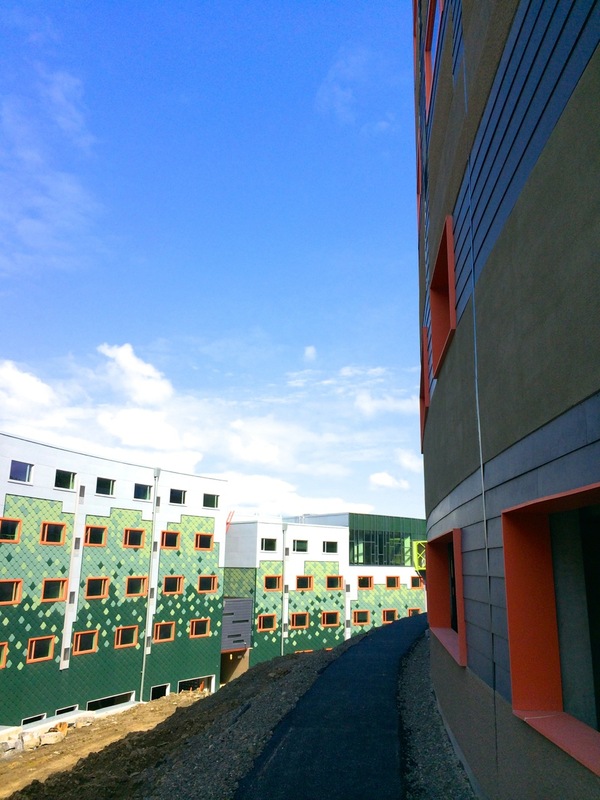 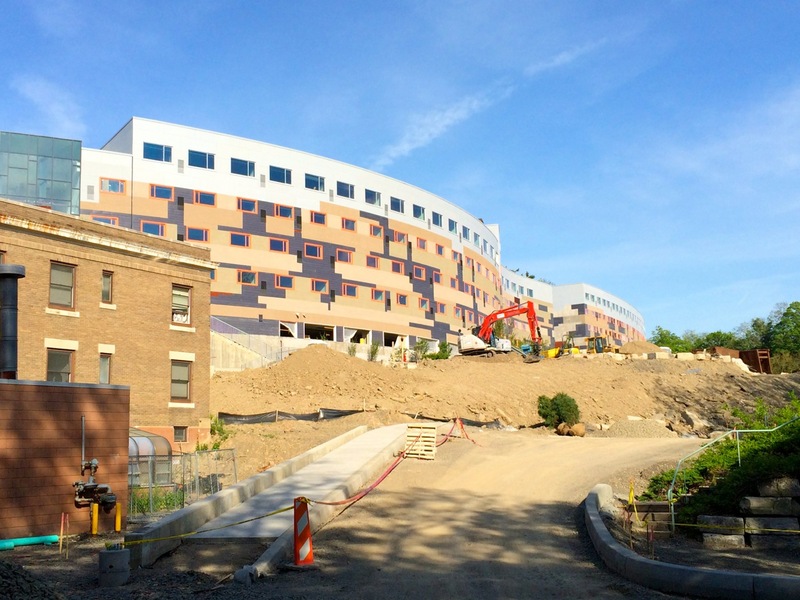 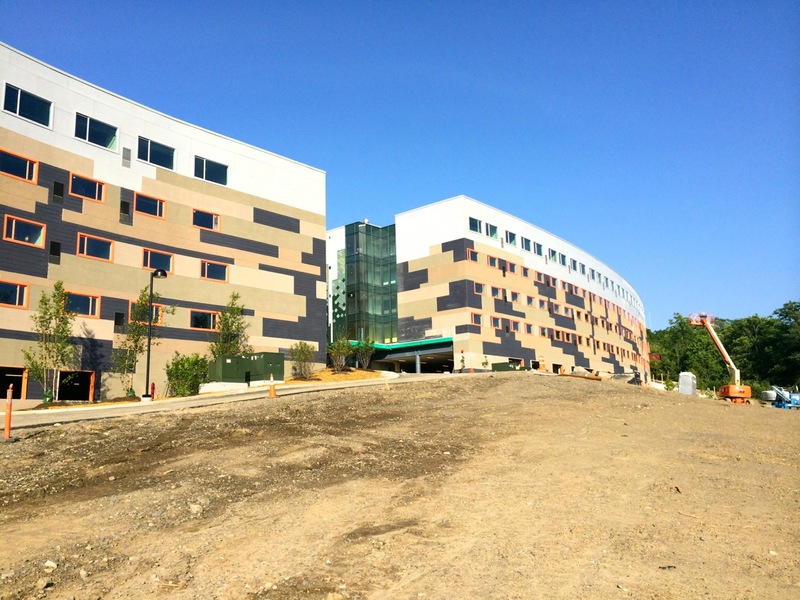 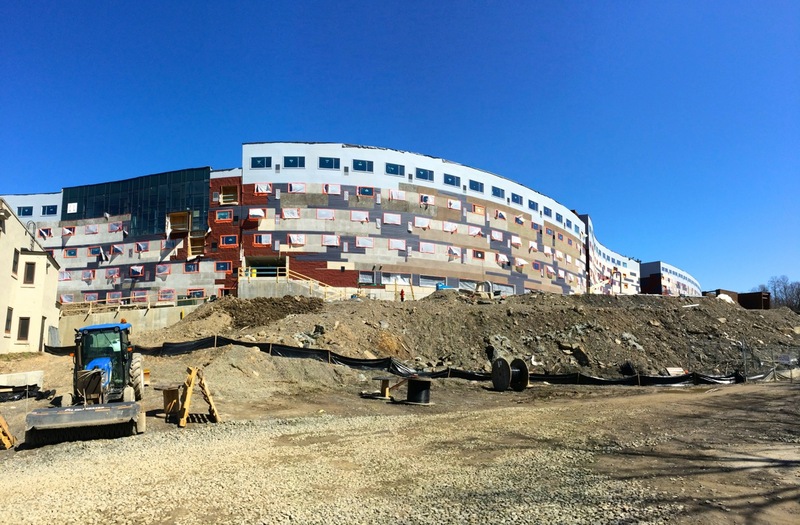 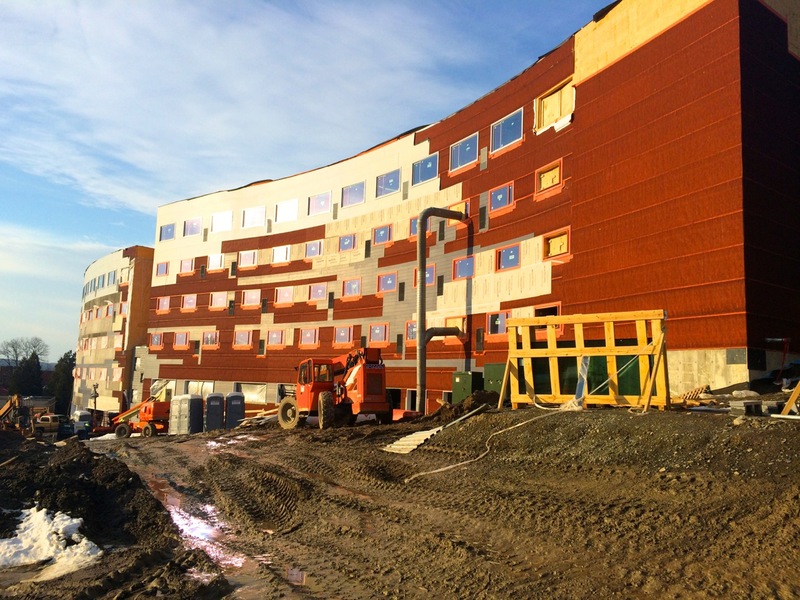 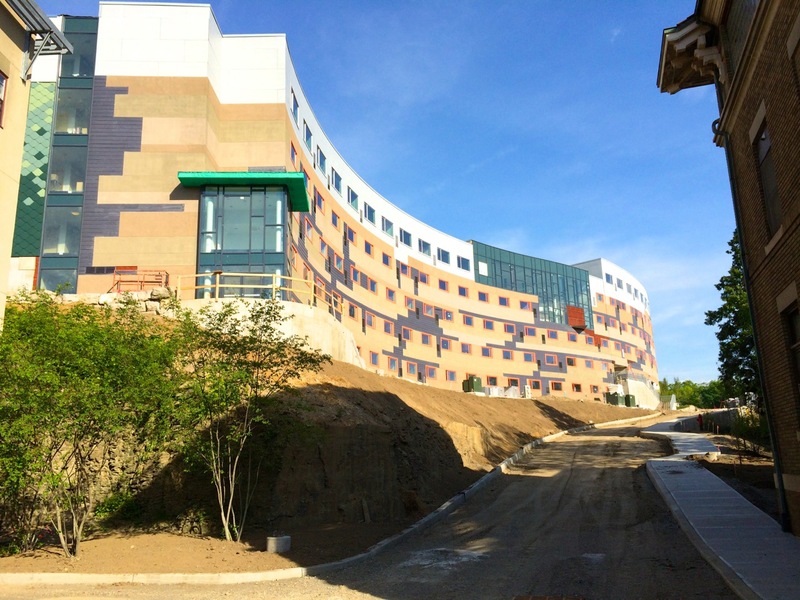 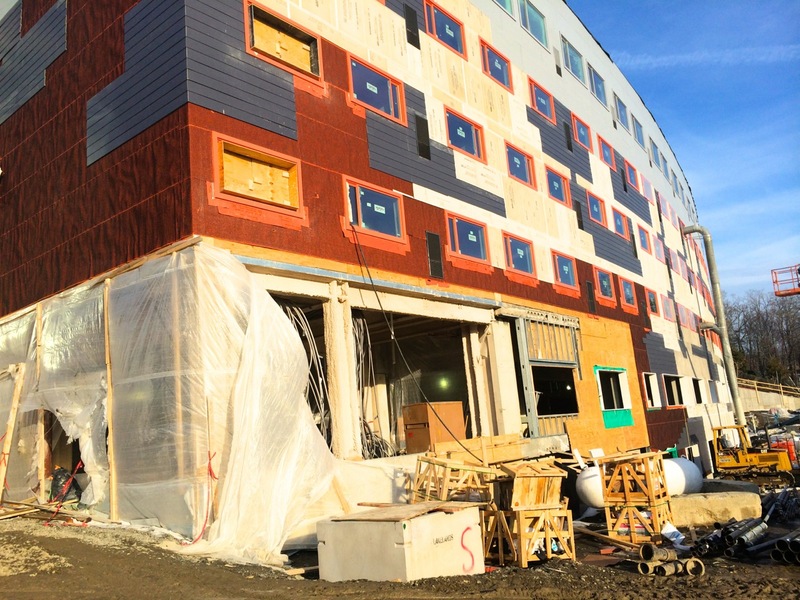 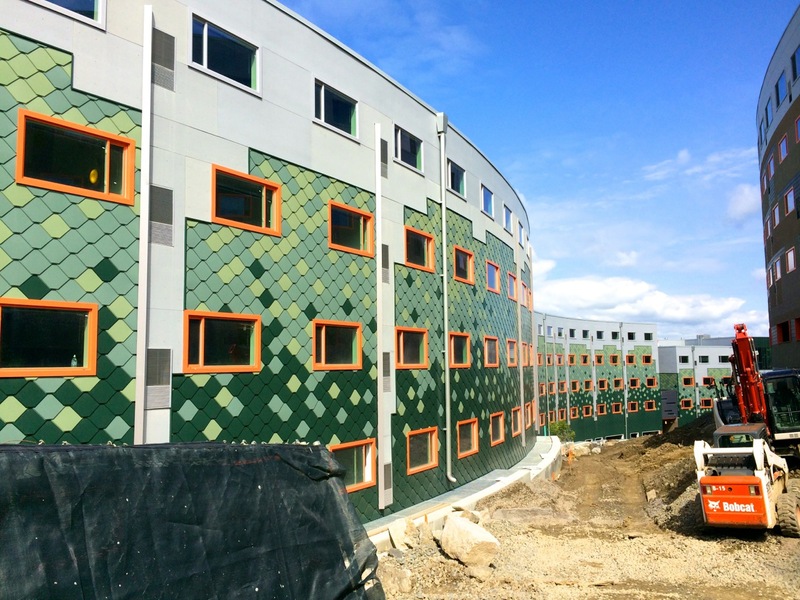 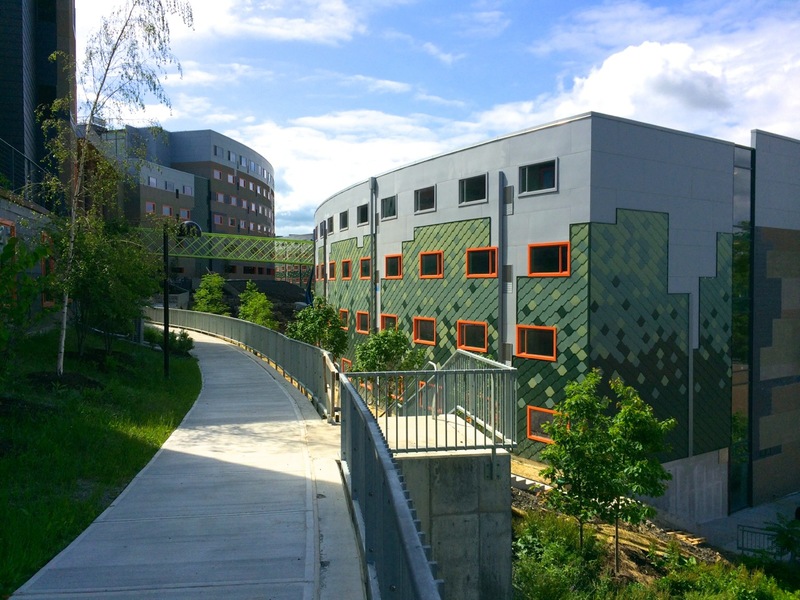 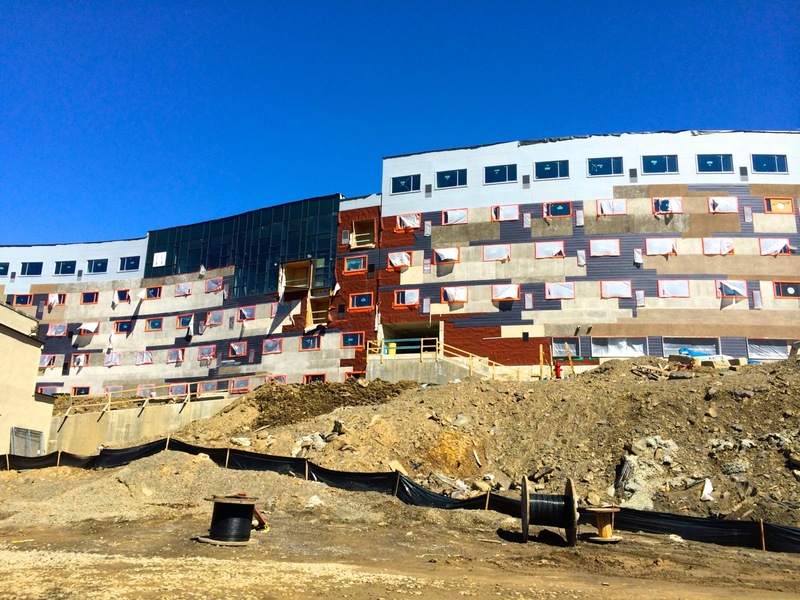 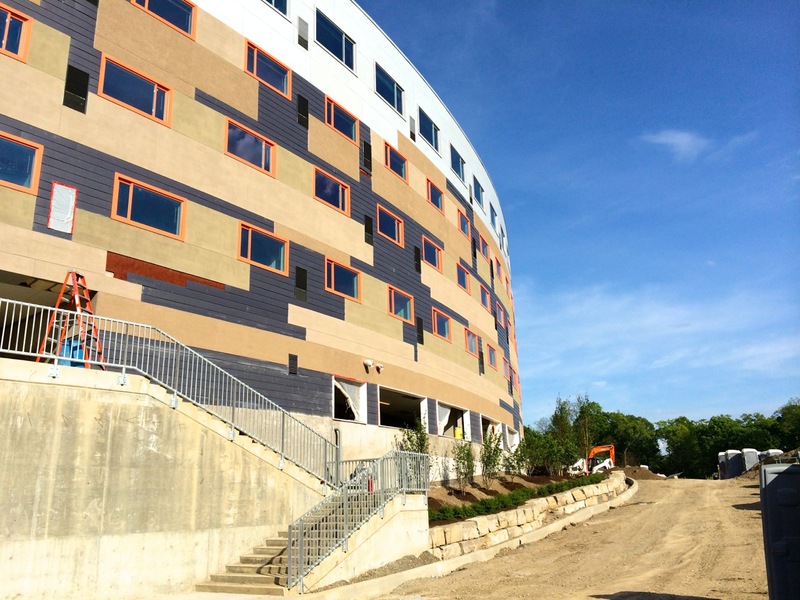 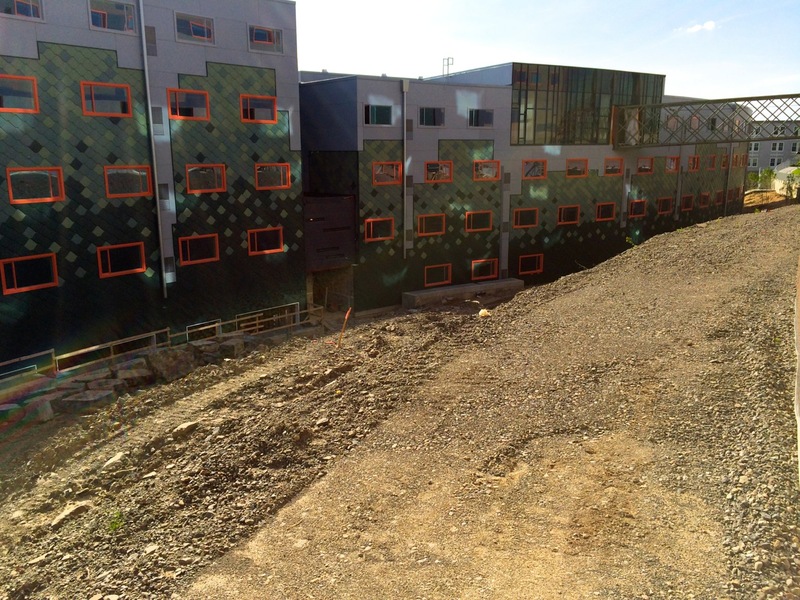 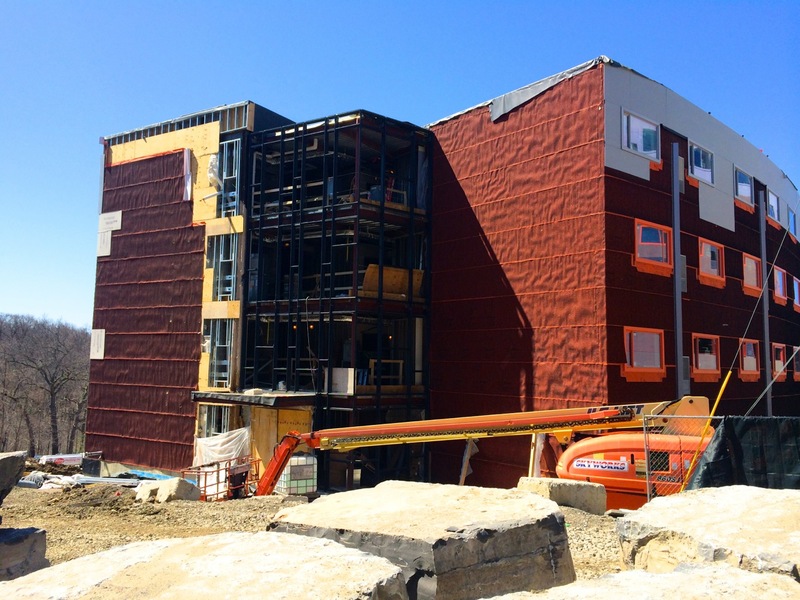 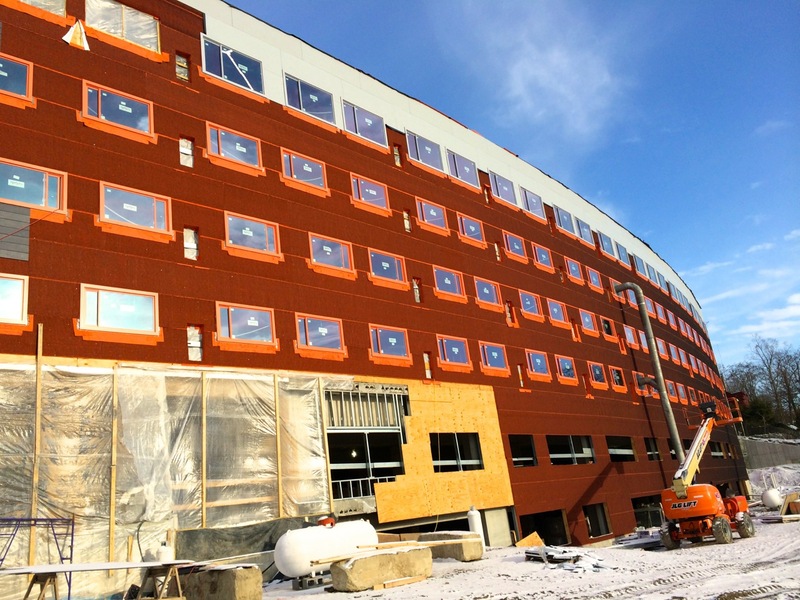 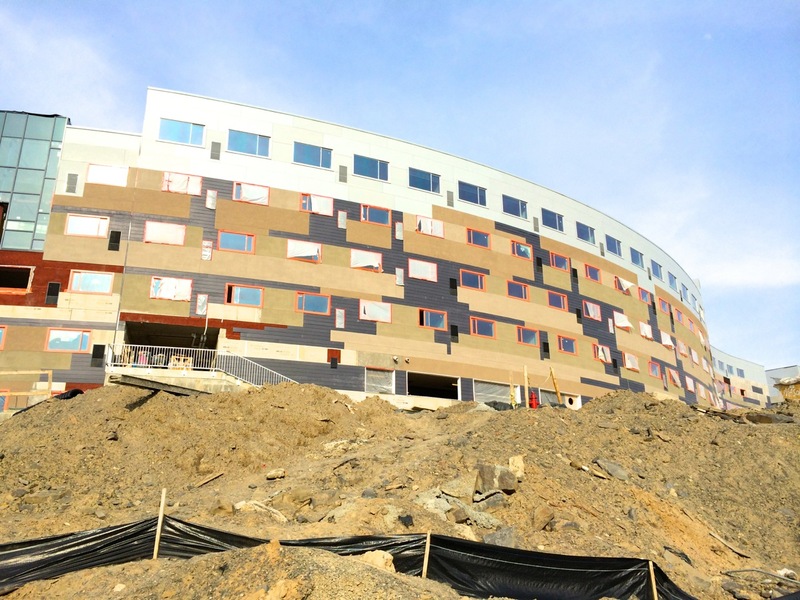 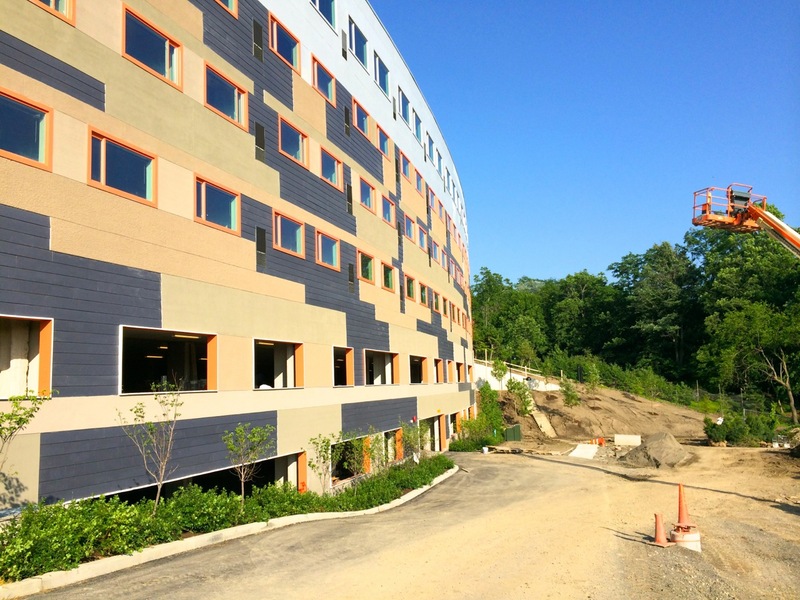 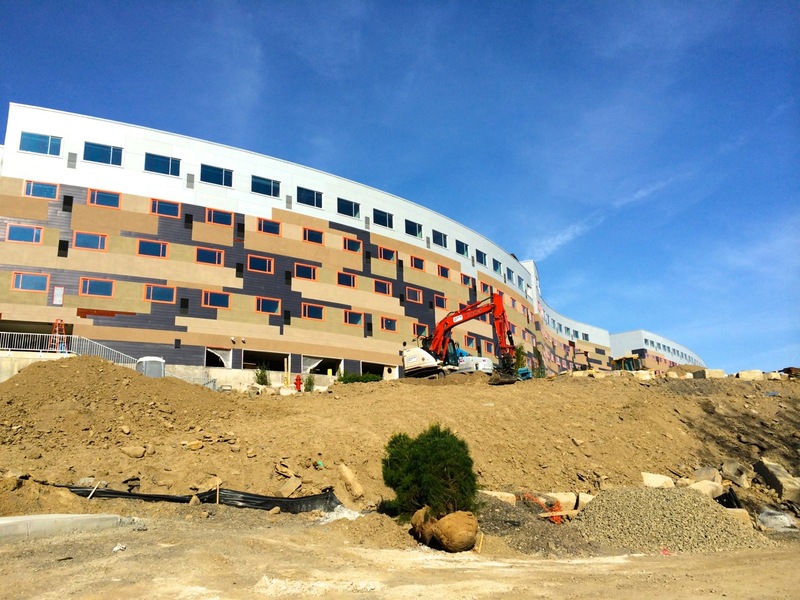 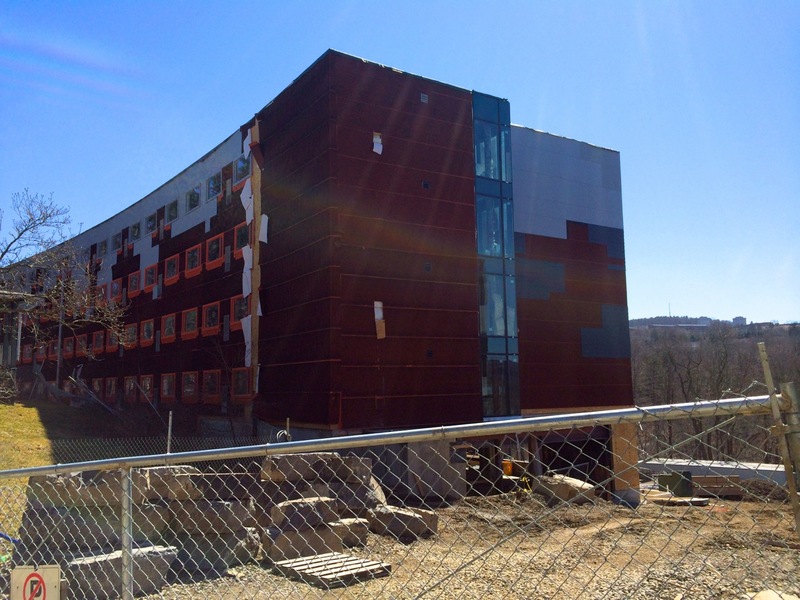 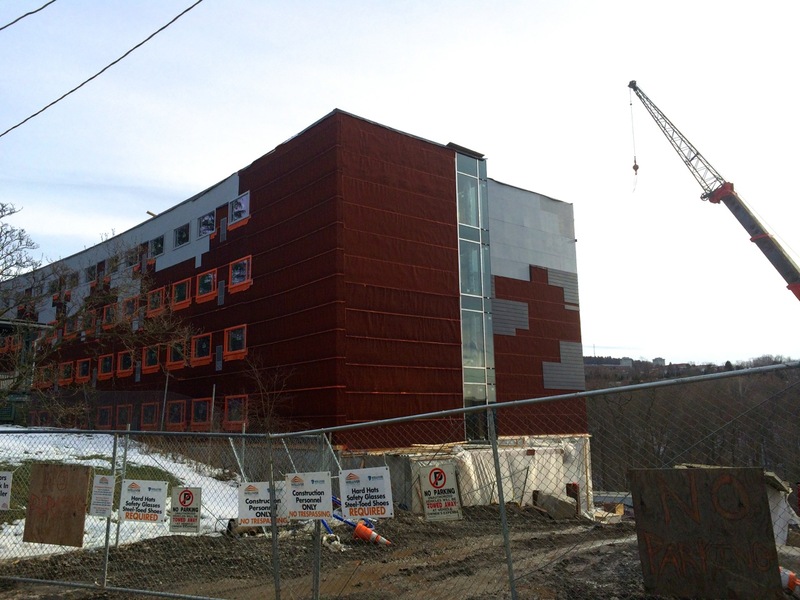 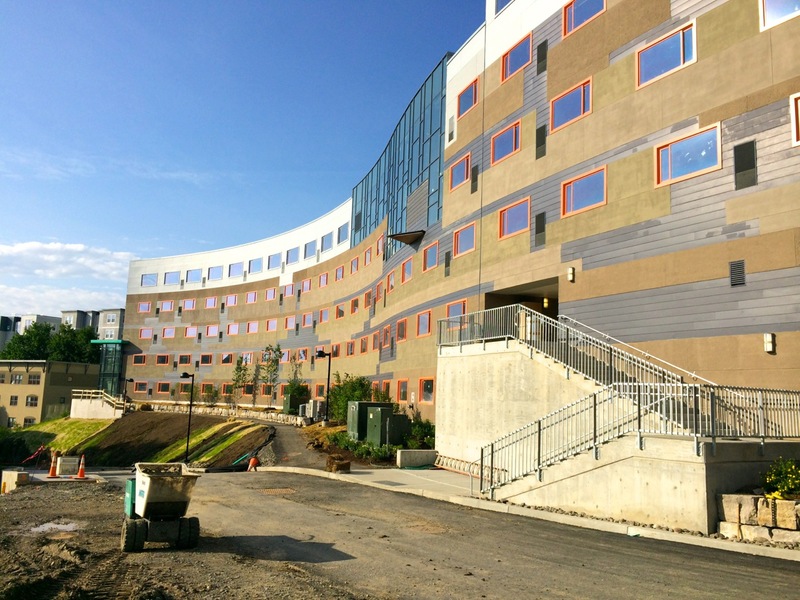 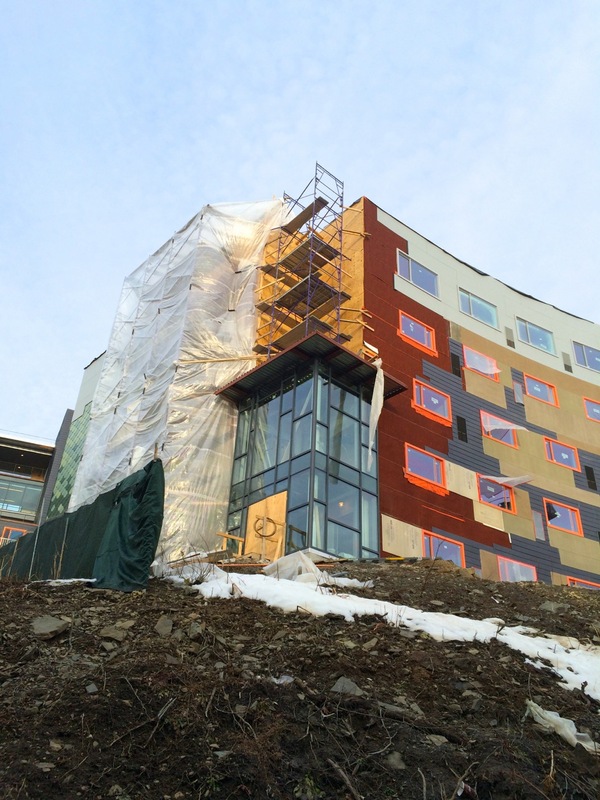 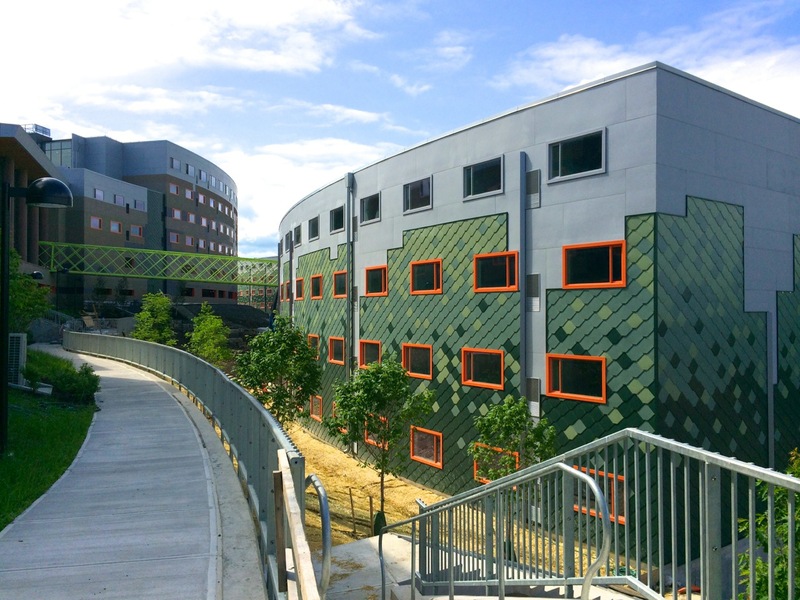 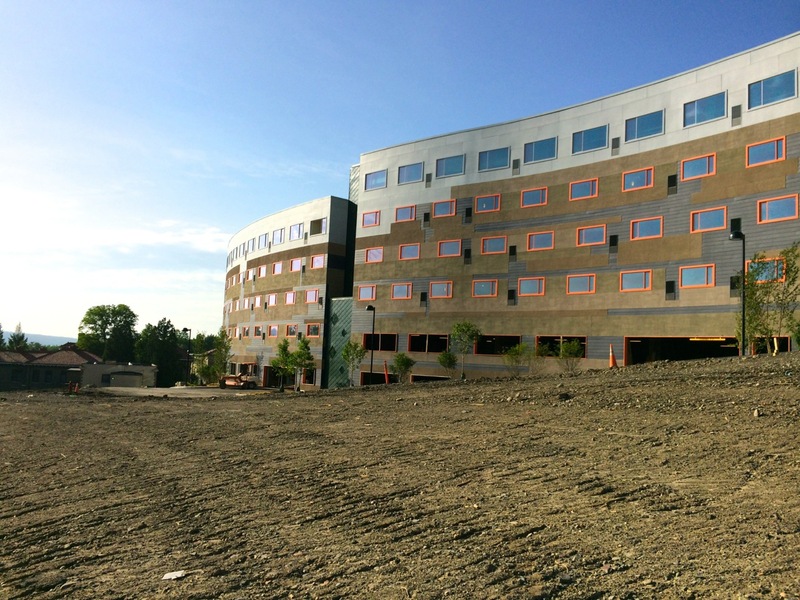 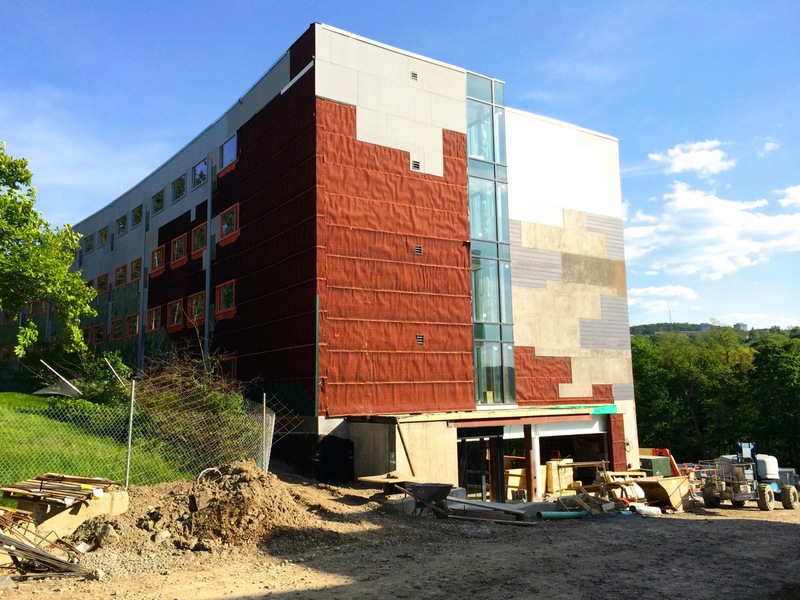 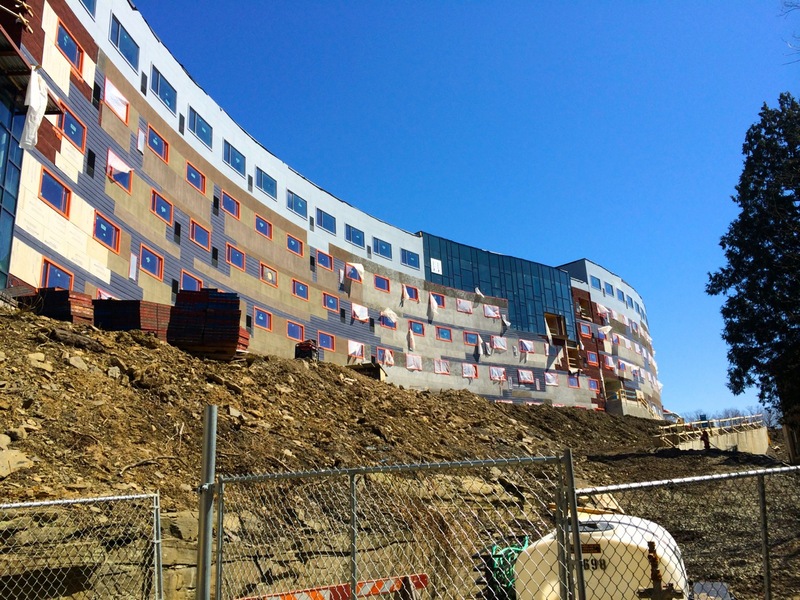 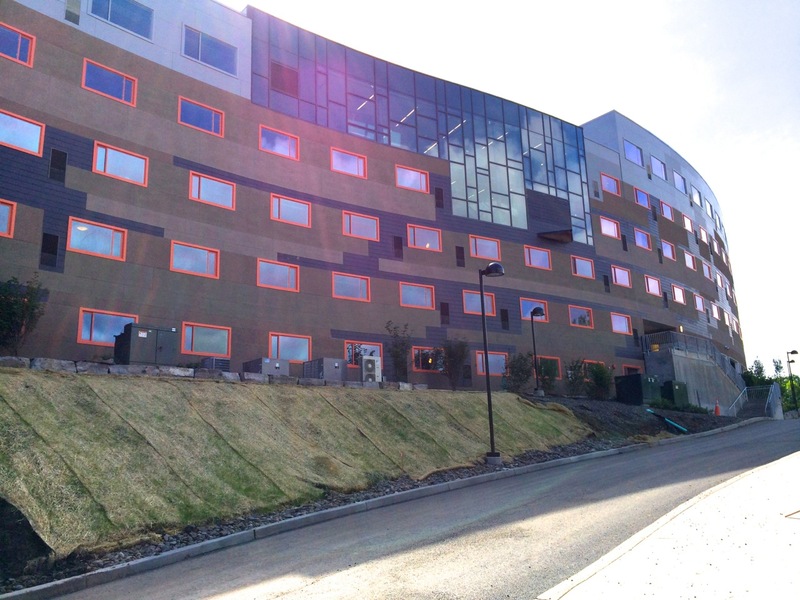 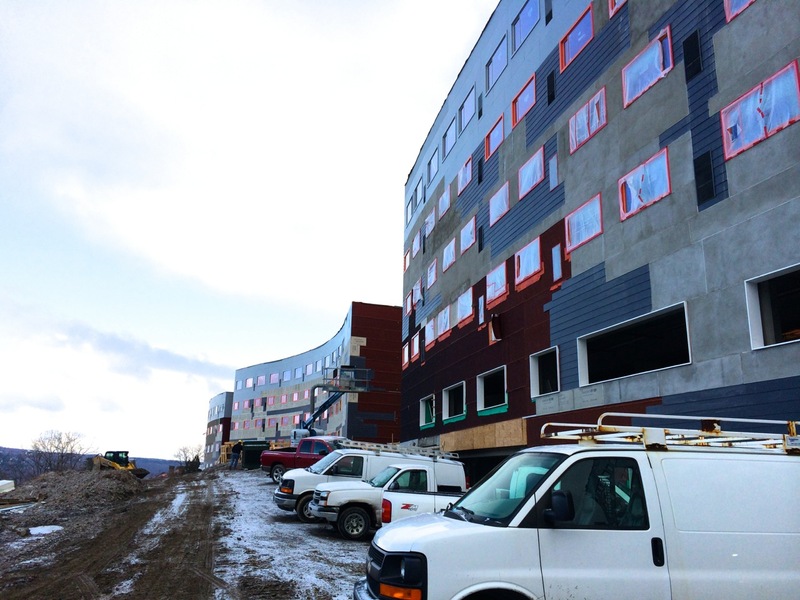 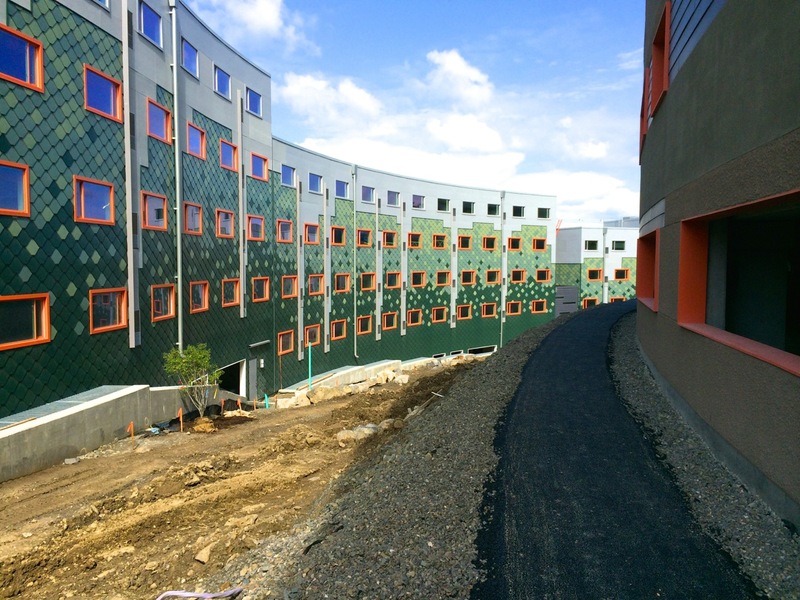 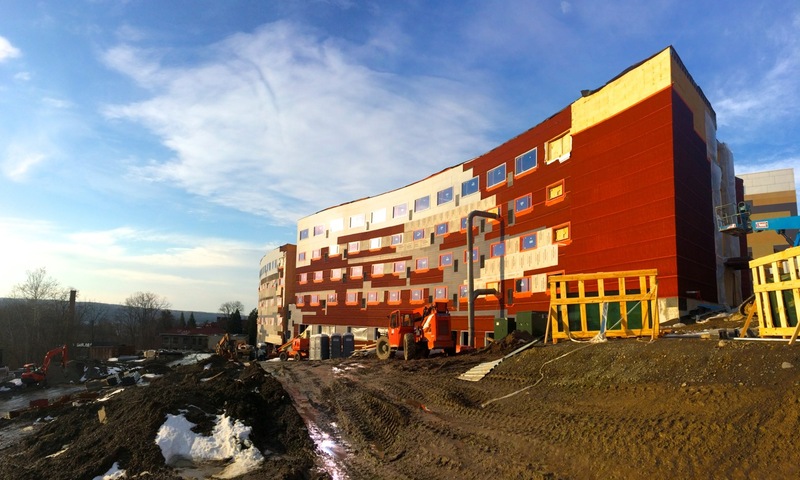 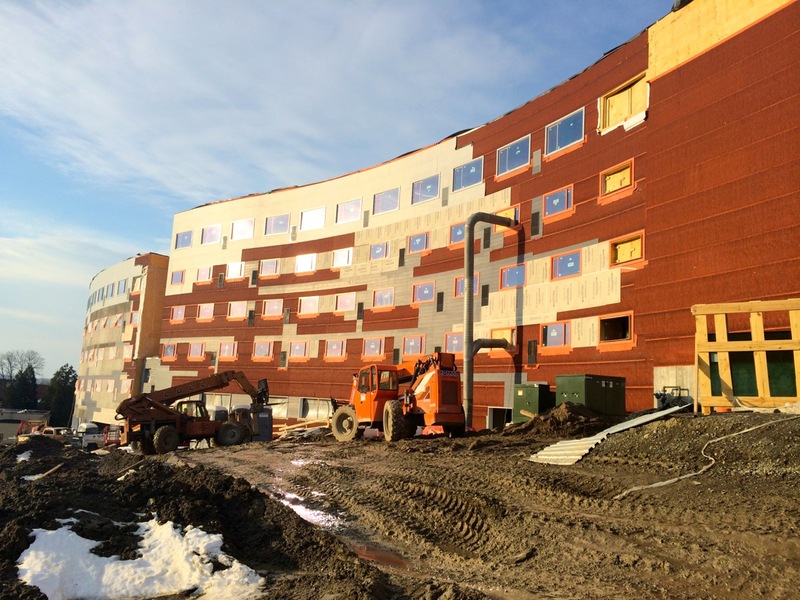 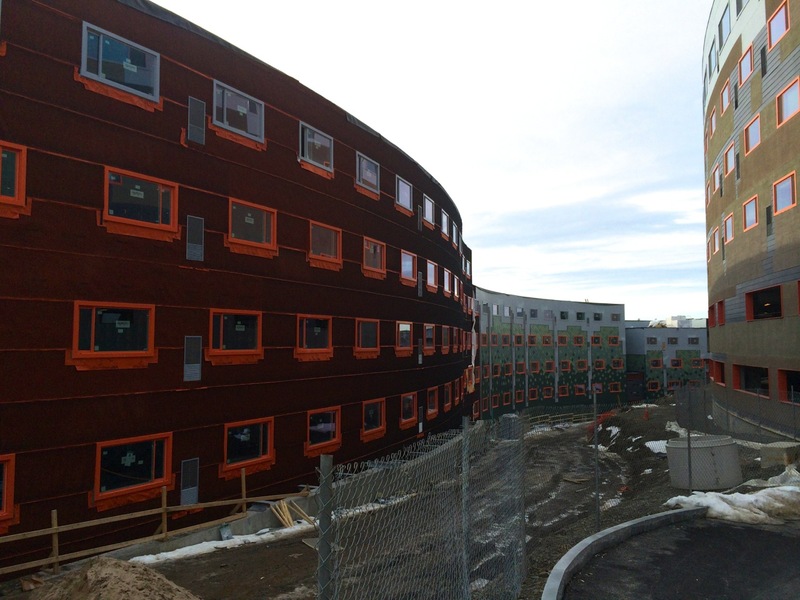 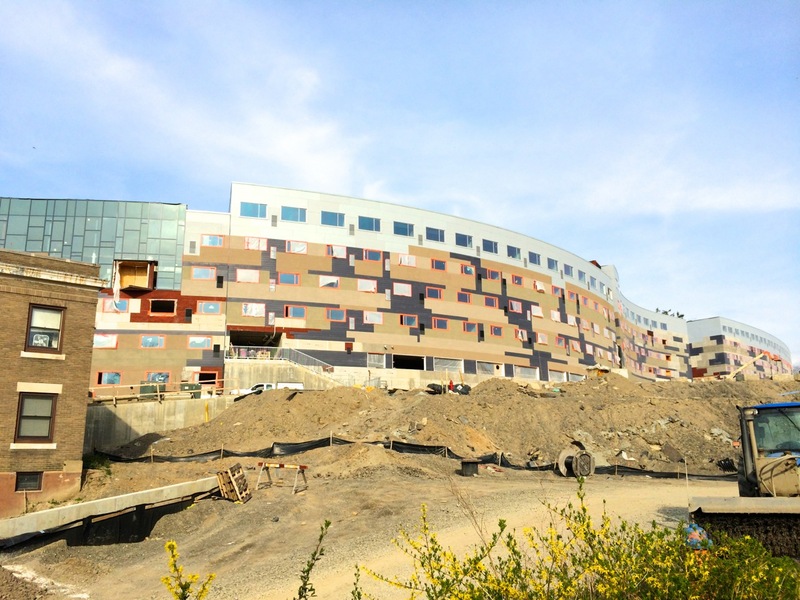 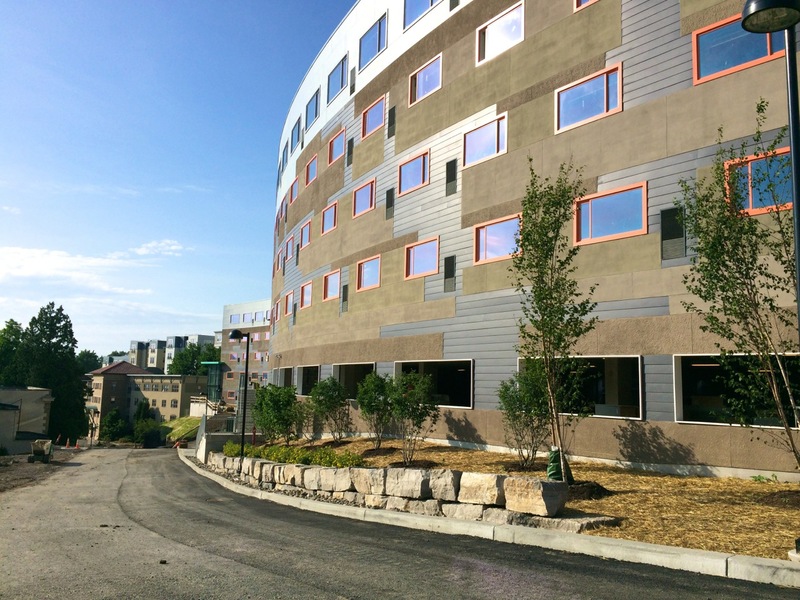 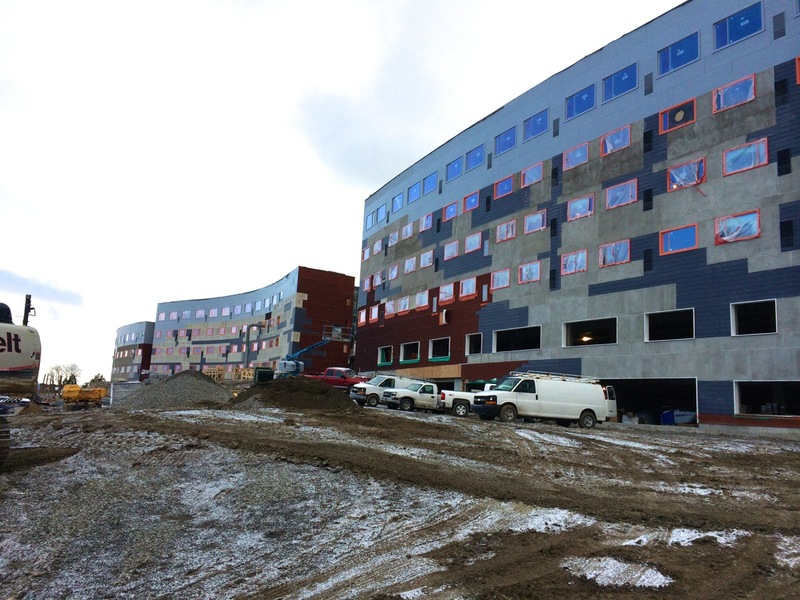 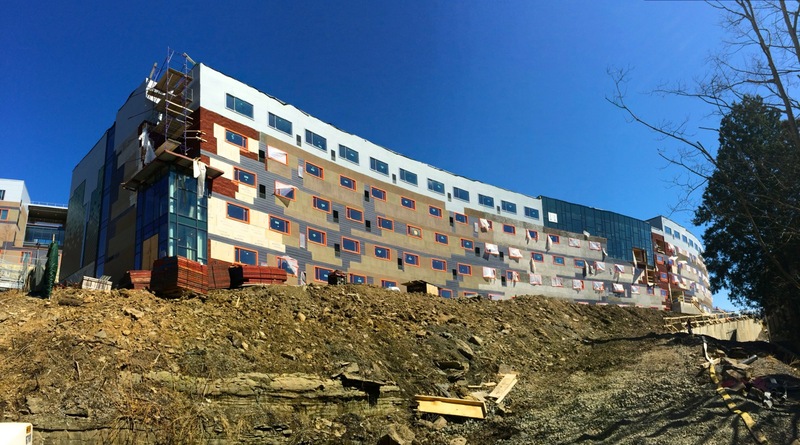 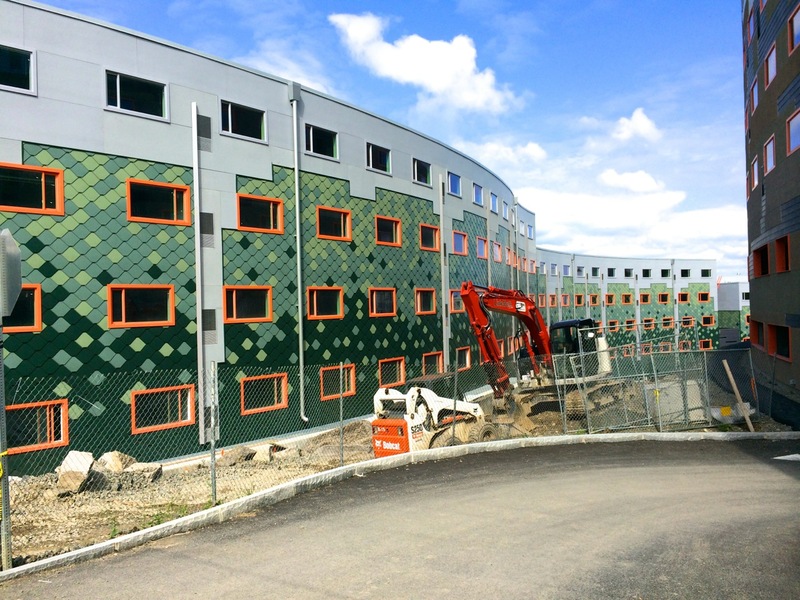 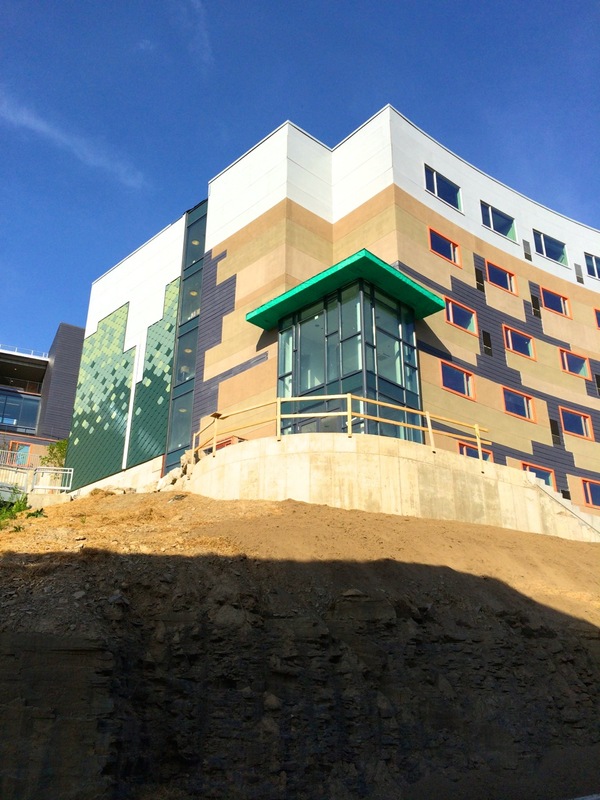 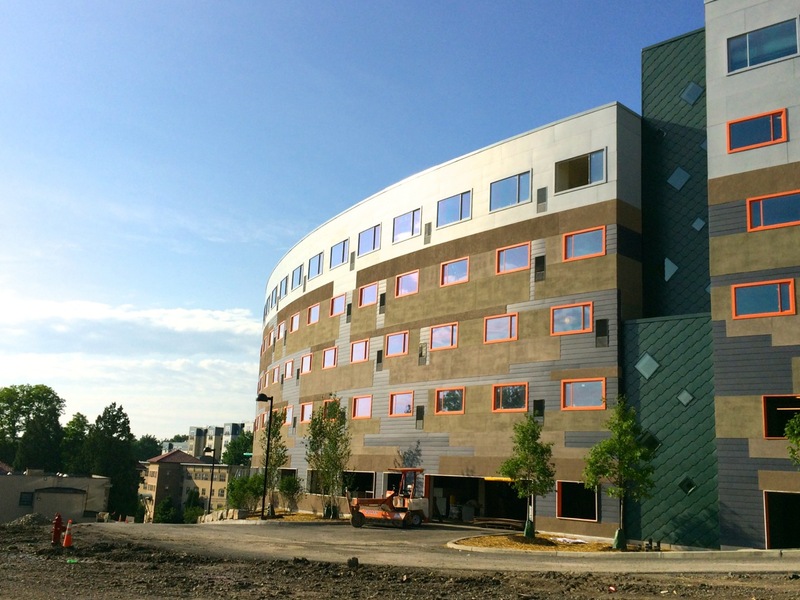 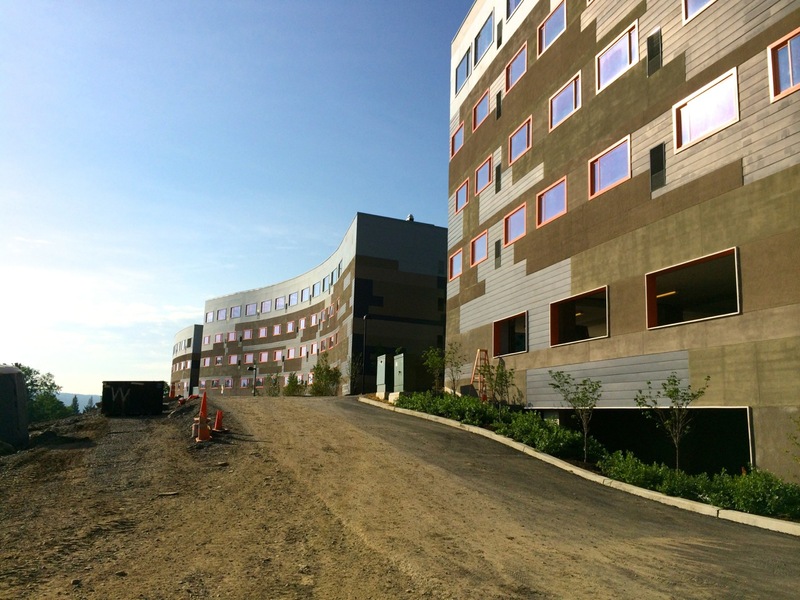 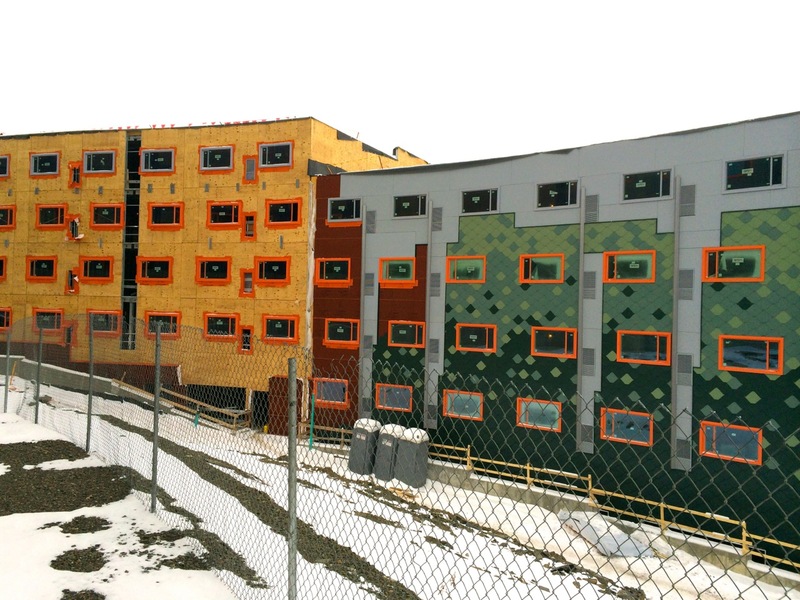 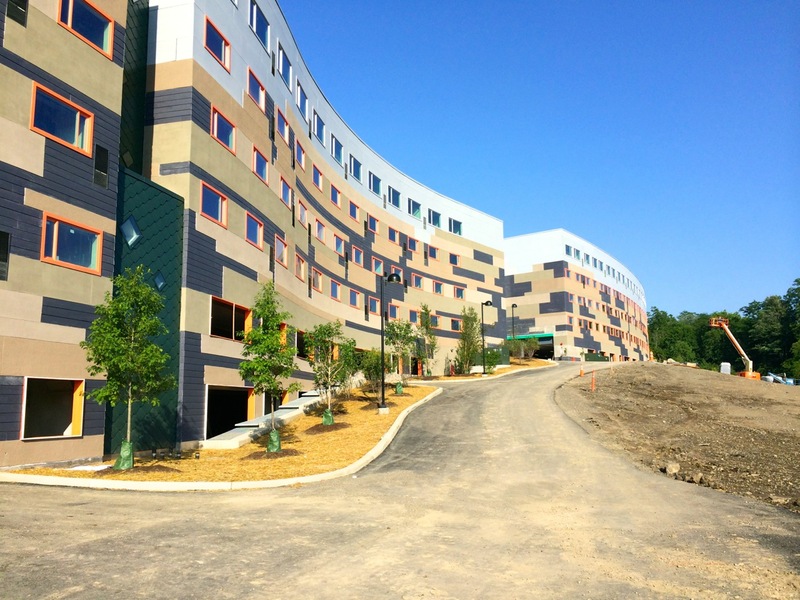 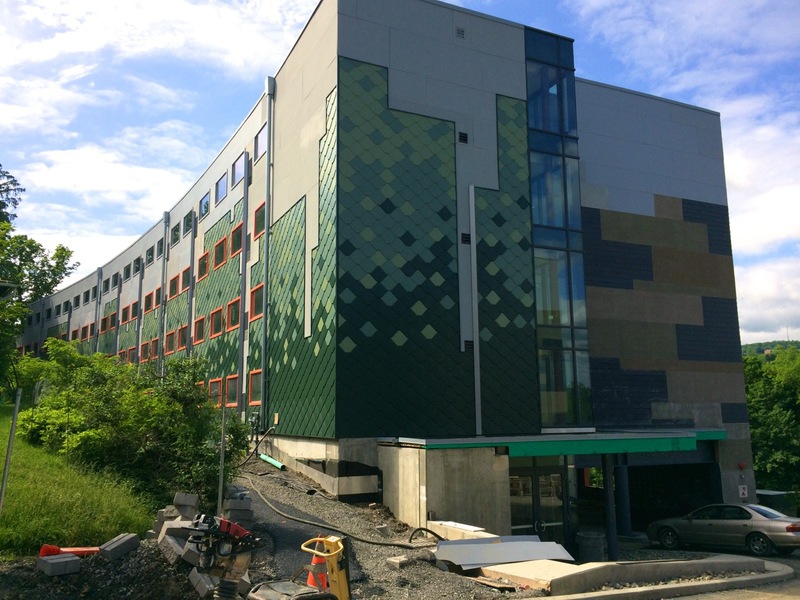 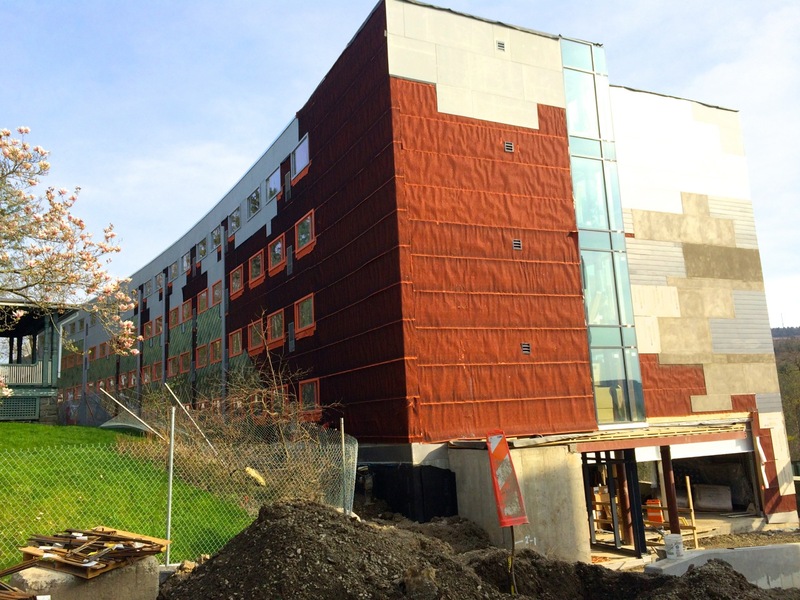 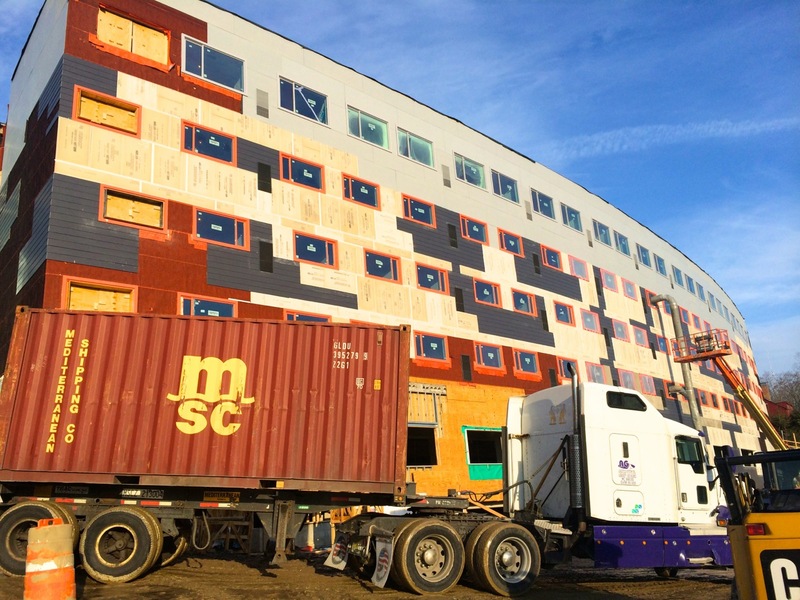 Buildings 5 & 6 will be finishing-up for occupancy later this summer, and the facades are 100% done now- the scales along the northern sides are complete, and the stucco/fiber cement panel combinations on the south sides were completed weeks ago. 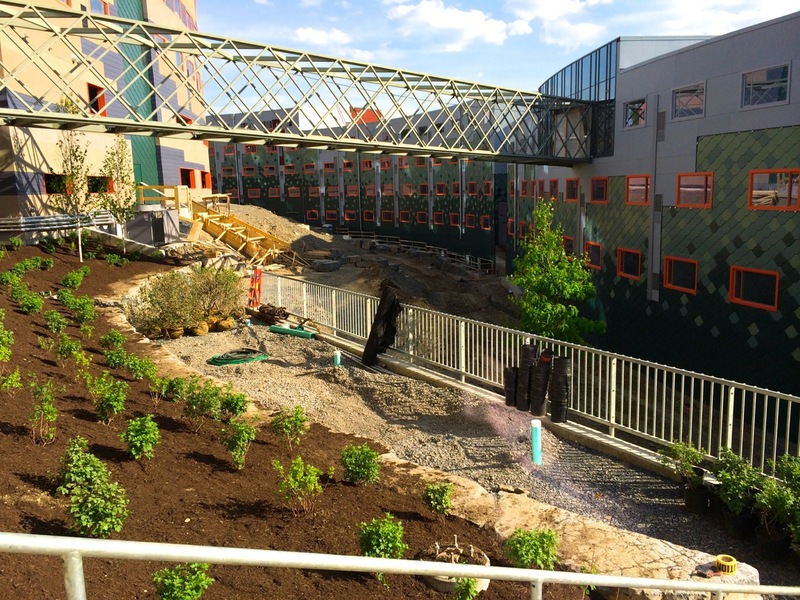 The metal pedestrian walkway connecting Building 5’s glass-walled common space to Building 3.4’s entry pavilion has been painted bright green, and there’s now an asphalt walkway between both buildings, as the concrete stairways and metal railings are finishing-up. 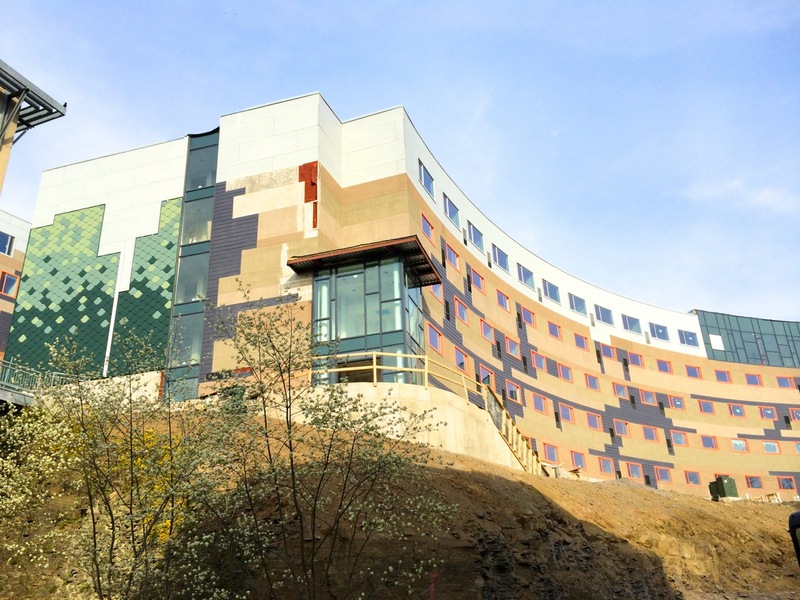 The project was designed by ikon.5 architects out of Princeton, New Jersey; the firm was judged as the 4th best design firm in the United States for 2013 by a panel from Architect Magazine (the AIA’s official publication, American Institute of Architects). 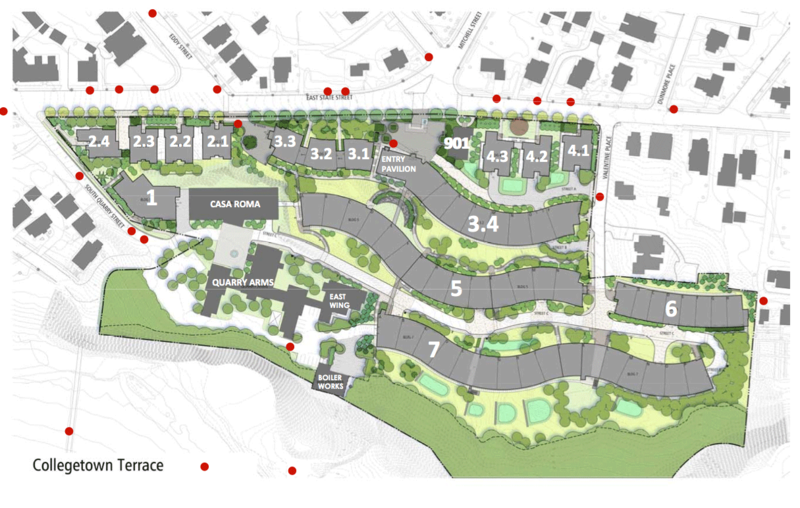 The plans for Building 7 require a zoning variance to build 247 units (up from 178 due to the desire to forego parking on the second level for dorm-style units), but I haven’t seen a final resolution or record of vote for the revision. 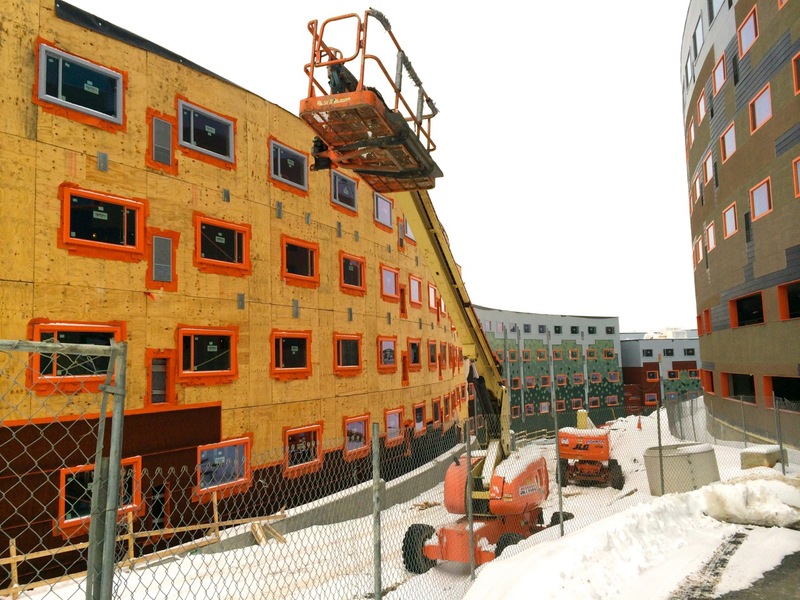 If approved, the net additional bed count for the whole project would go from 589 to 669 net additional bedrooms (the construction required the demolition of the former Valentine Apartment complexes). 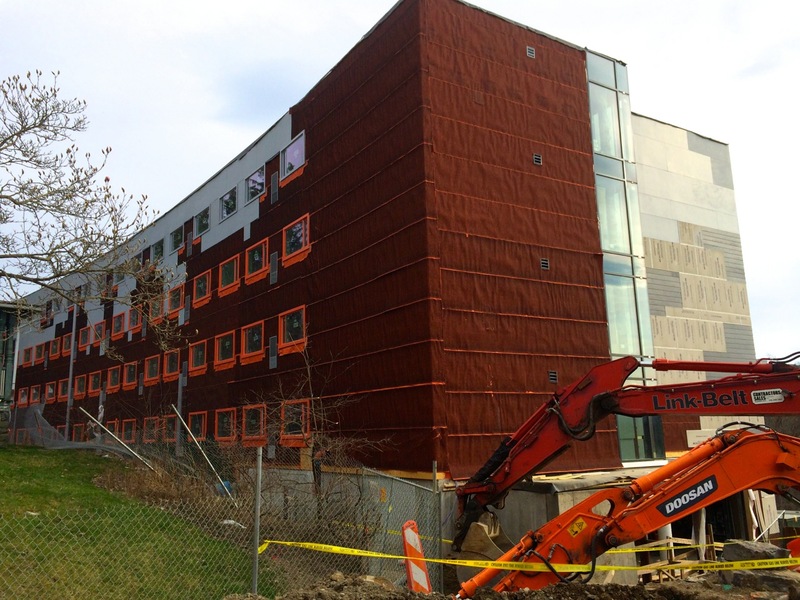 Novarr-Mackesey‘s 1,226 bed Collegetown Terrace project being constructed by Welliver is showing more progress as spring draws to a close in a few weeks, and the summer construction season gets into full swing: the retaining wall and sidewalk at the east end of Building 5 has been poured, further multicolored vinyl siding has been installed along the northern sides of Building 5 & 6, and the curbing, sidewalk, and drive lane gravel from the end of Quarry Street South (Casa Roma‘s entrance) to about the center of Building 5’s south side is set. 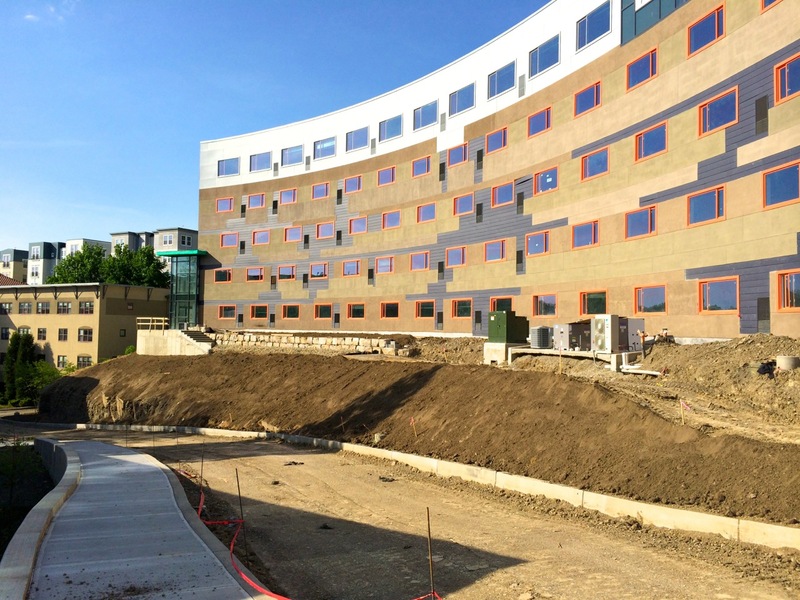 There’s also been a lot of landscaping work, giving a sense of what the grounds will look like once the project is complete. 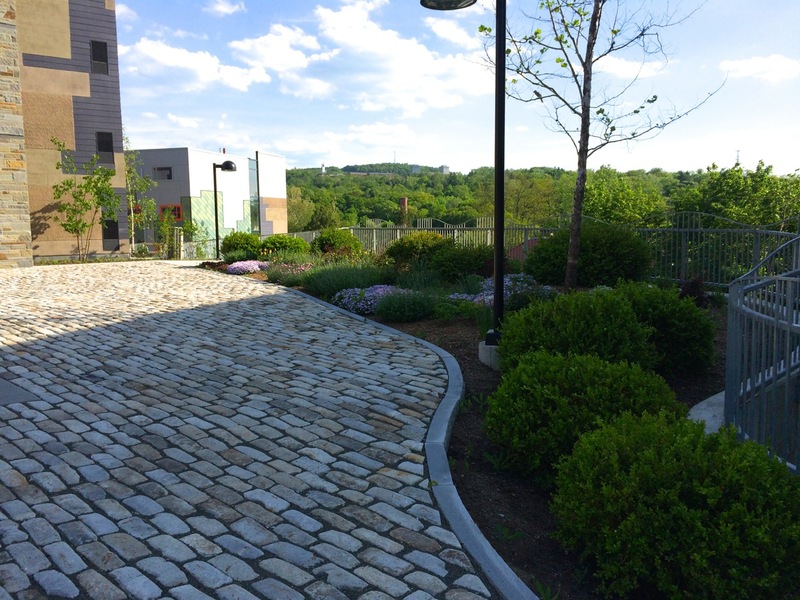 The planters have nice big stone retaining walls, and the tree and shrub combinations look balanced. 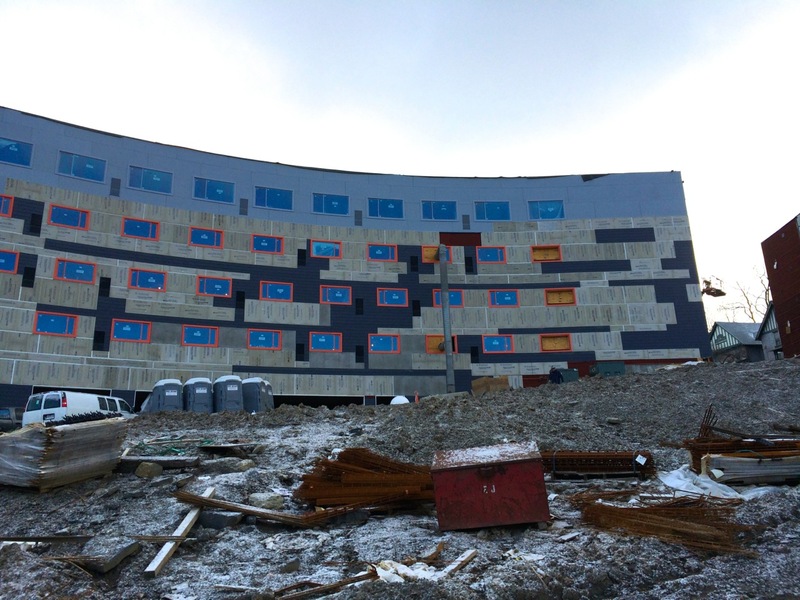 Many of the remaining sections of synthetic stucco have been coated to their final finish along the southern faces of Buildings 5 & 6 since about three weeks ago (hard to believe there was snow on the ground then), and along the roof lines, it looks like some of the metal coping has been installed over top the EPDM membrane edges. 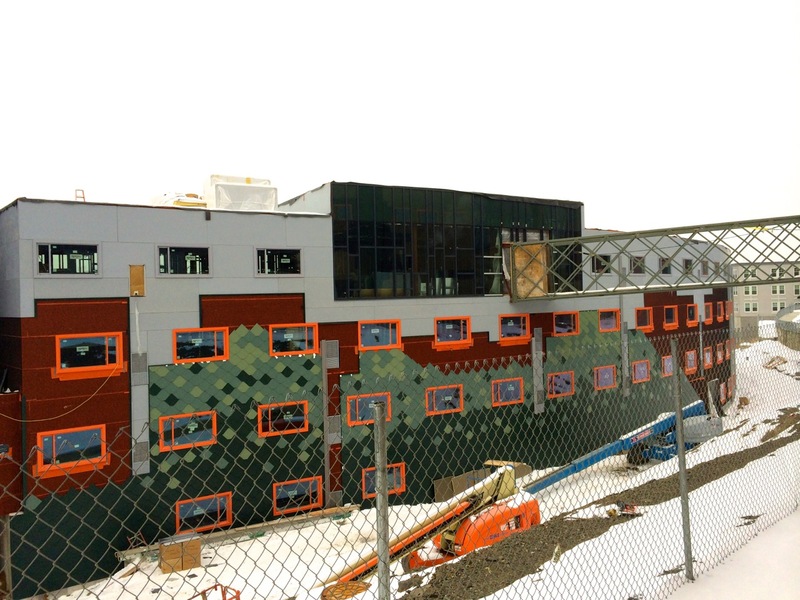 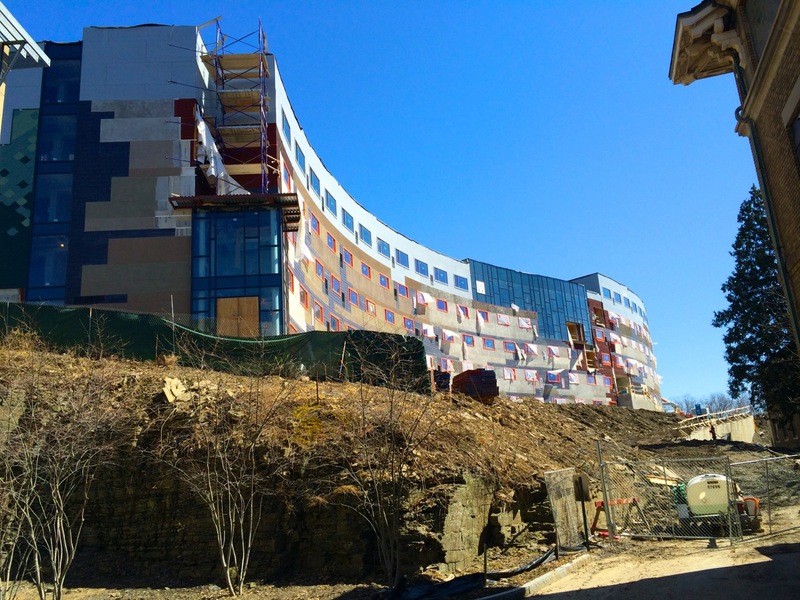 When I swung by, there was a crew on the northern side of Building 5 installing the scale-like facade, which has also progressed on Building 6’s northern side. 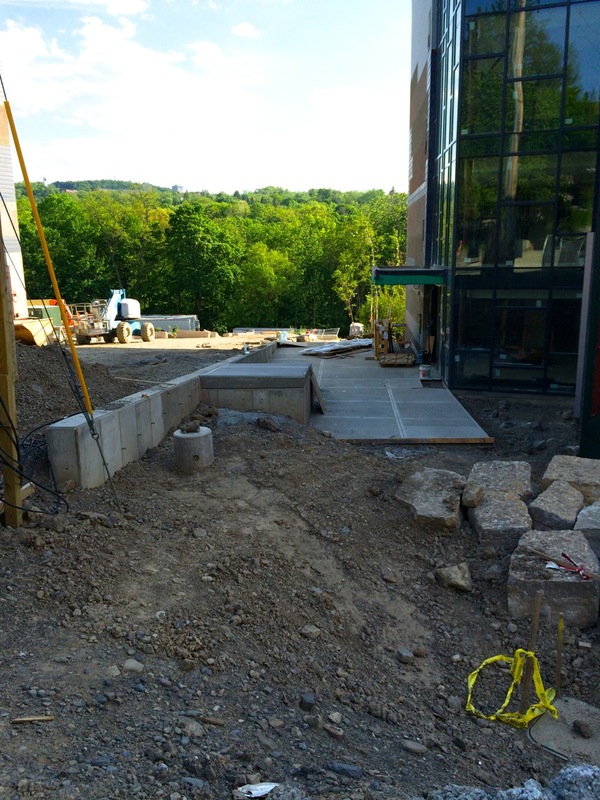 At the entrance between Buildings 5 & 6, there’s also a set of forms for pouring a new retaining wall along Building 5. 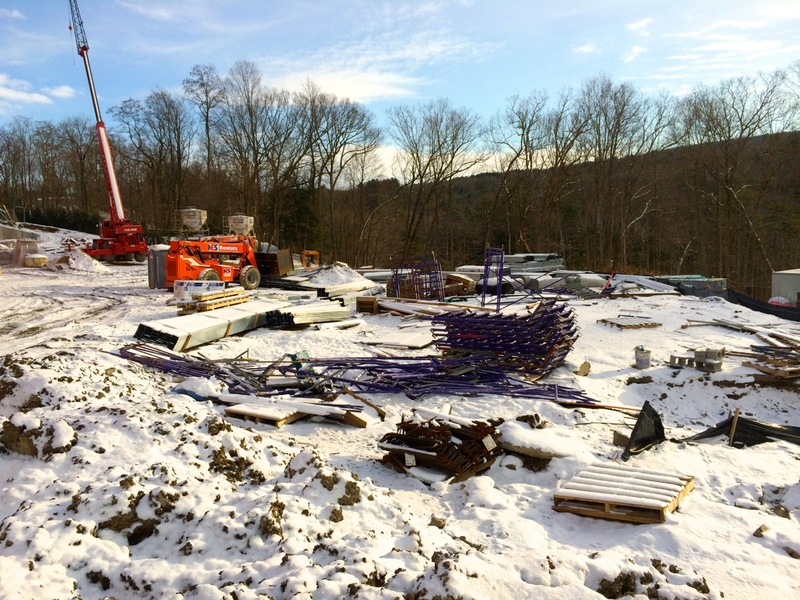 I haven’t seen the interiors, but there’s no doubt they’re far along, as the extended cold winter provided ample time for focusing on interiors at many project sites in the area. 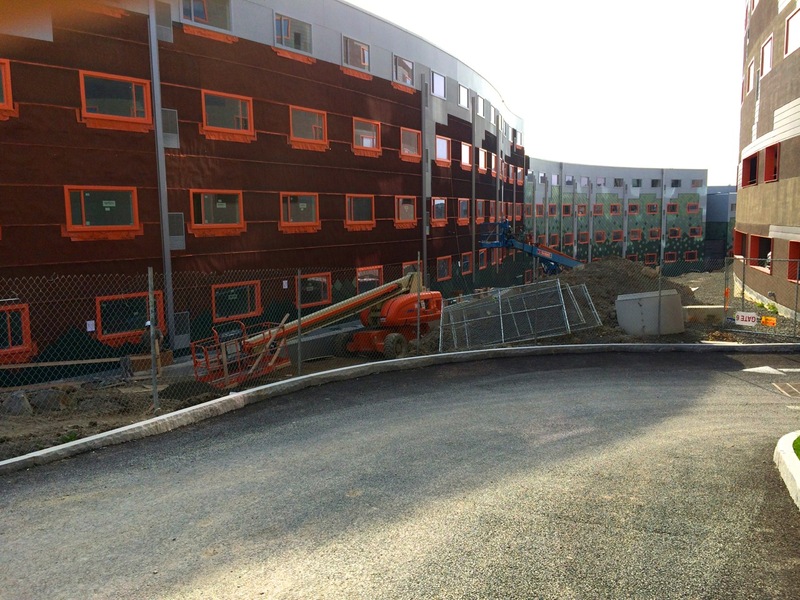 Amenities for the Building 5 units listed here.. granite counters, limestone tile, fully furnished- sounds nice. 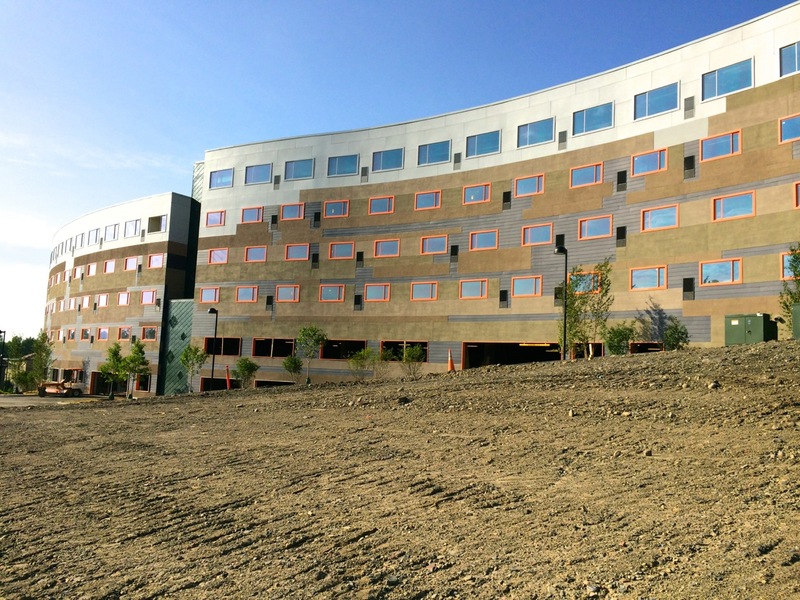 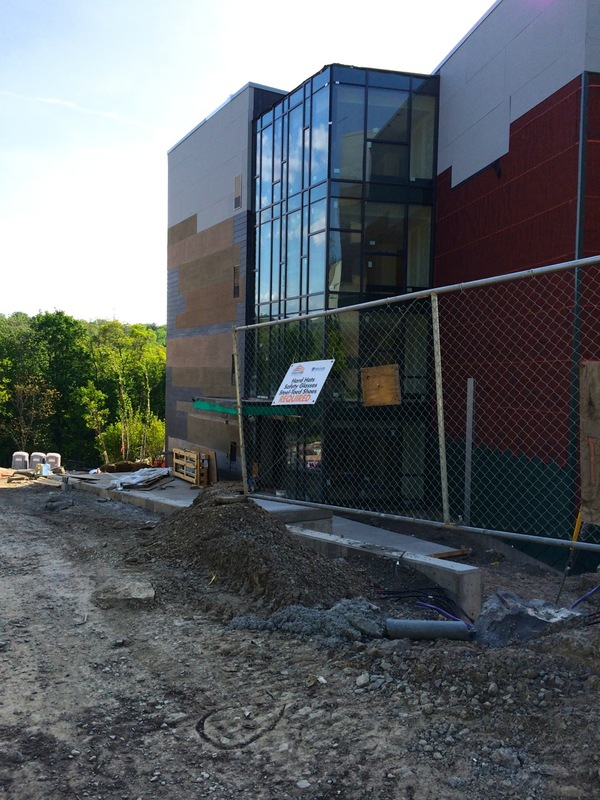 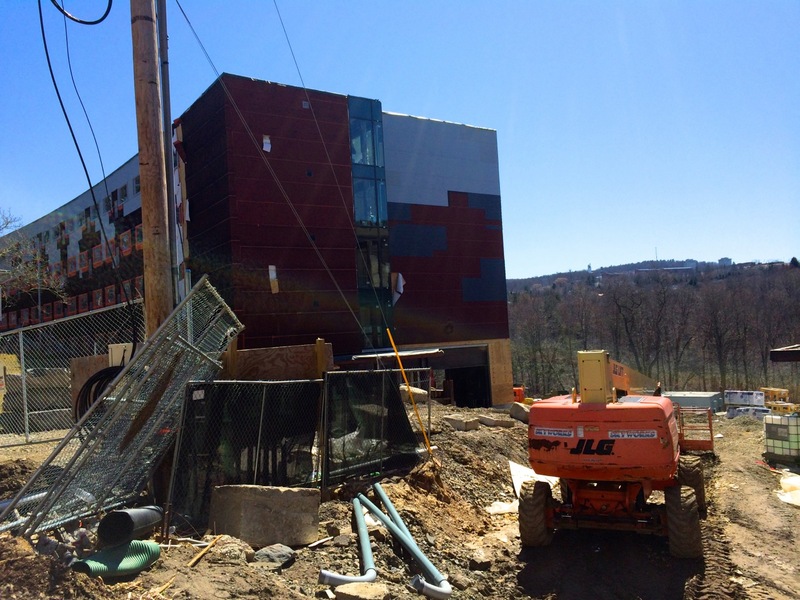 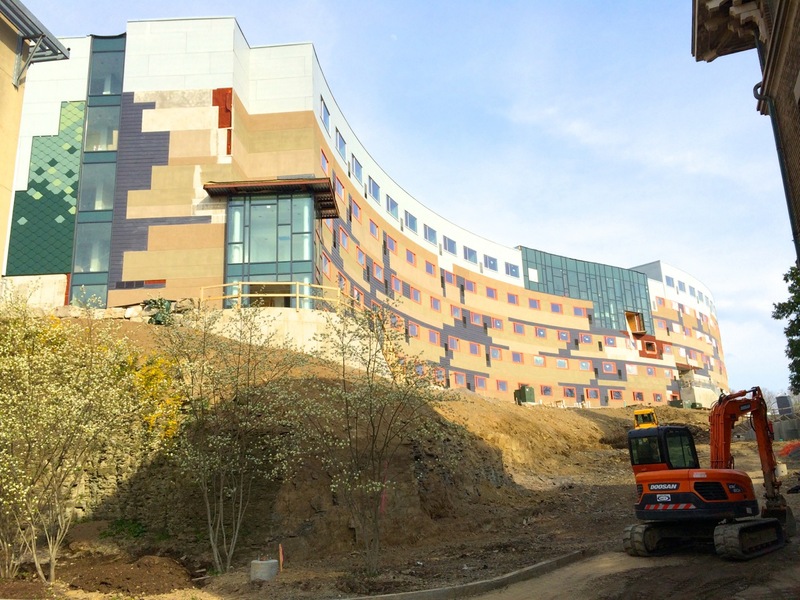 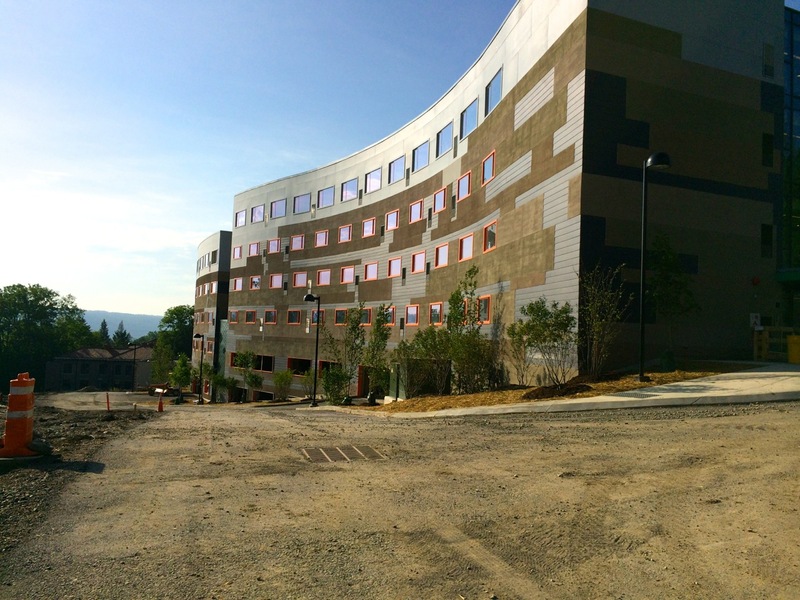 These two buildings will be done by the end of summer, in time for the Fall semester. 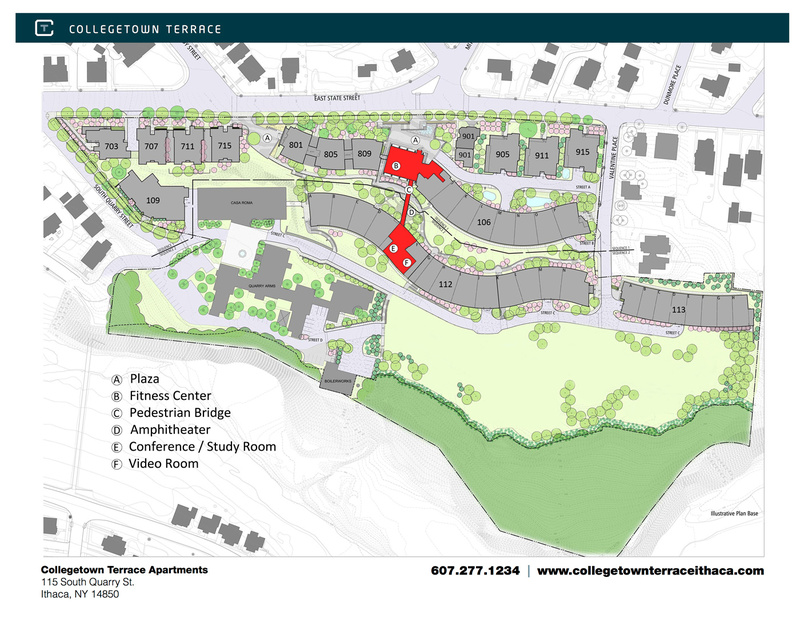 The developer/management company, Novarr-Mackesey has posted a new site map of the project online (embedded below, minus the future Building 7), and the General Contractor, Welliver has also been busy over at Cornell’s Klarman Hall project, which should start foundation work later this summer. 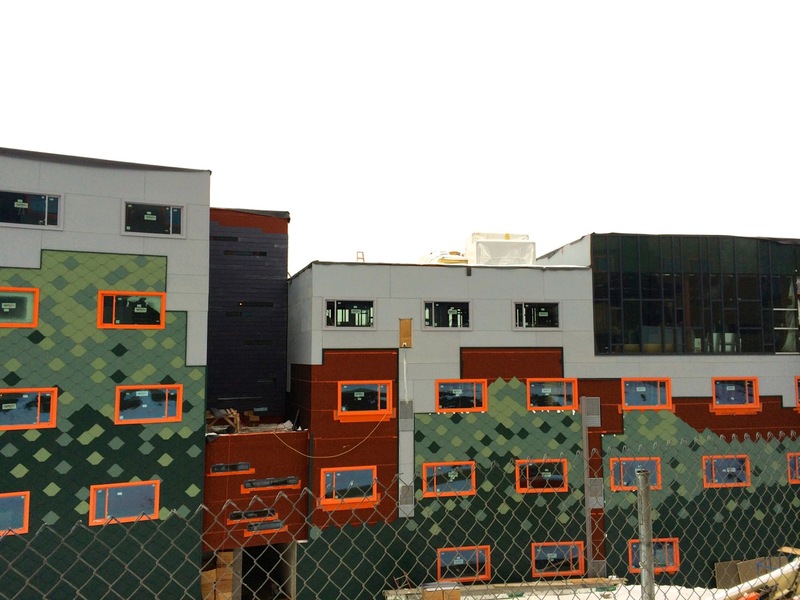 I was invited to take photos on the Collegetown Terrace site last week through Welliver the General Contractor, so here’s a selection of photos from the south side of the site, and a few taken from the north on the 21st. 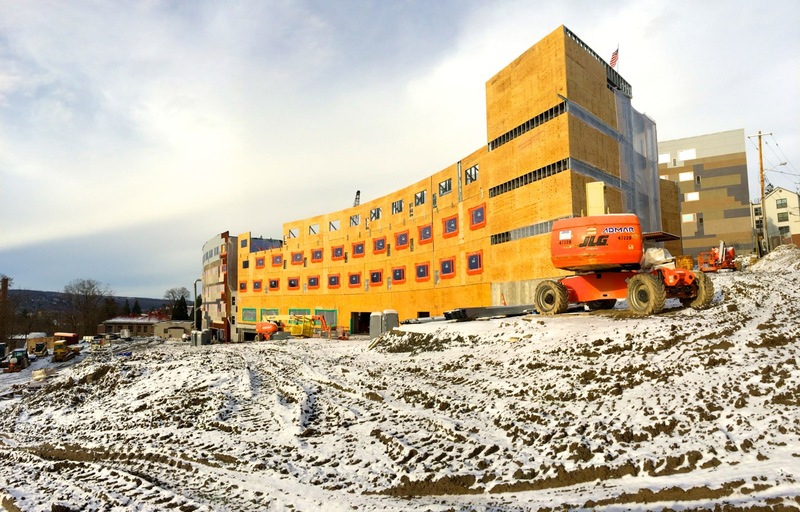 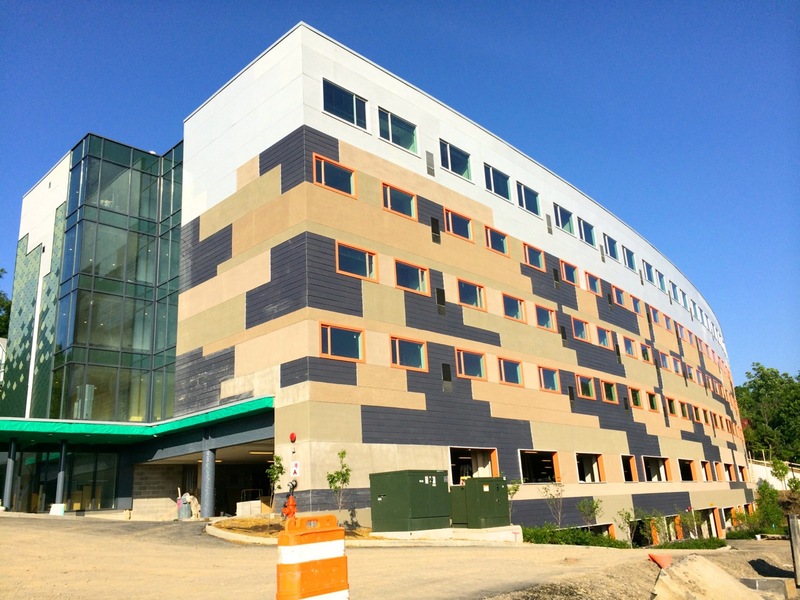 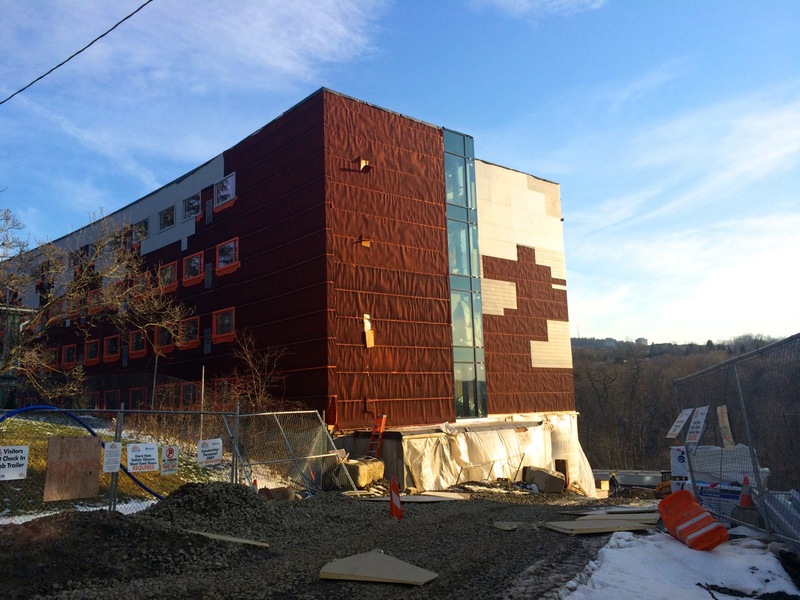 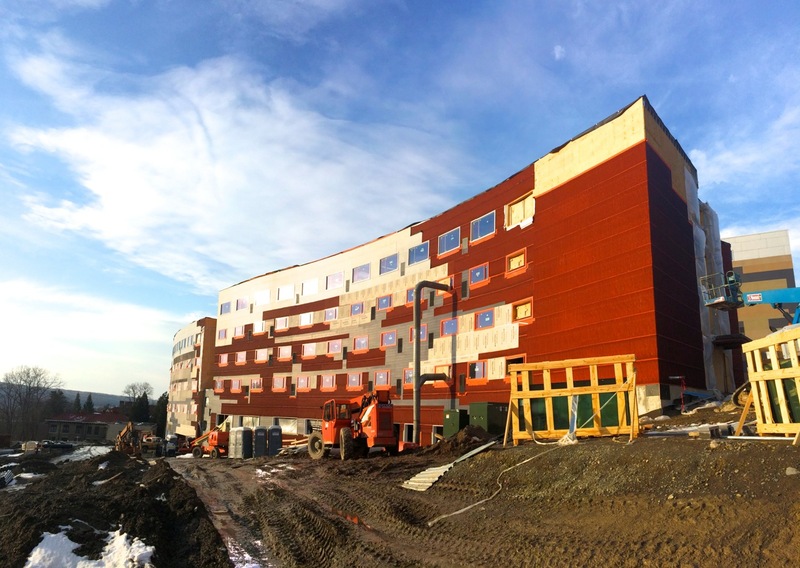 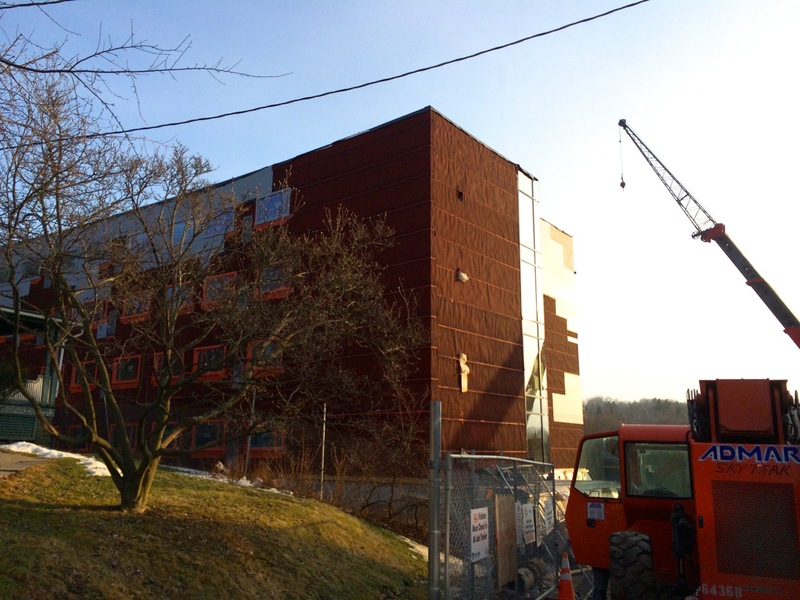 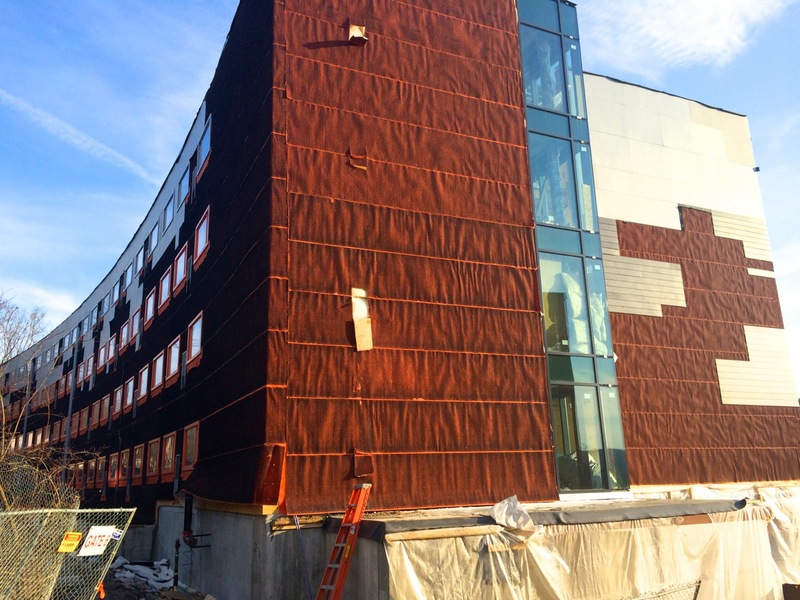 Building 5 and 6 still have sections of fiber cement panels to install (mostly along the north sides), but the southern facades seem complete minus the areas for synthetic stucco, which are applied with a grey base layer, then a tan-colored finish coat. 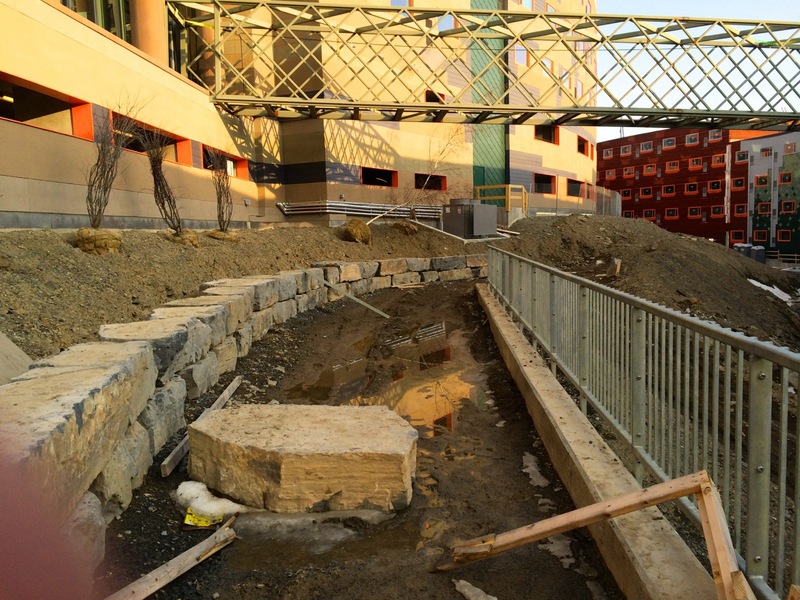 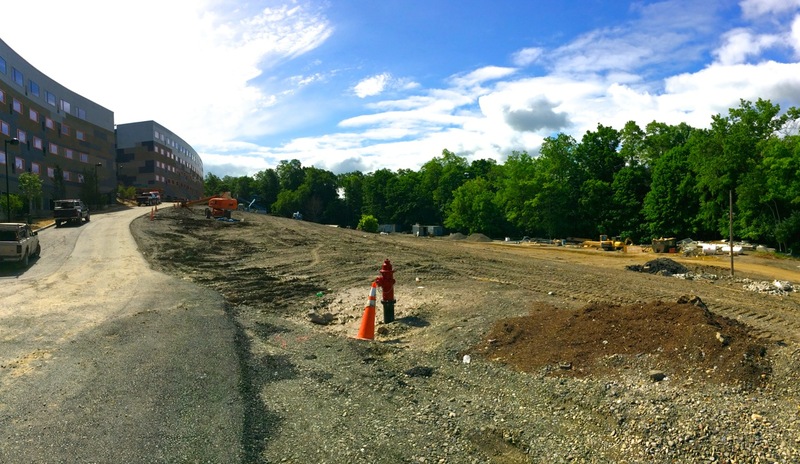 Concrete forms and rebar rods have been set for the outside stair section at the west end of Building 5, and very large landscaping boulders are being assembled along the hillside just south of the workout facility. 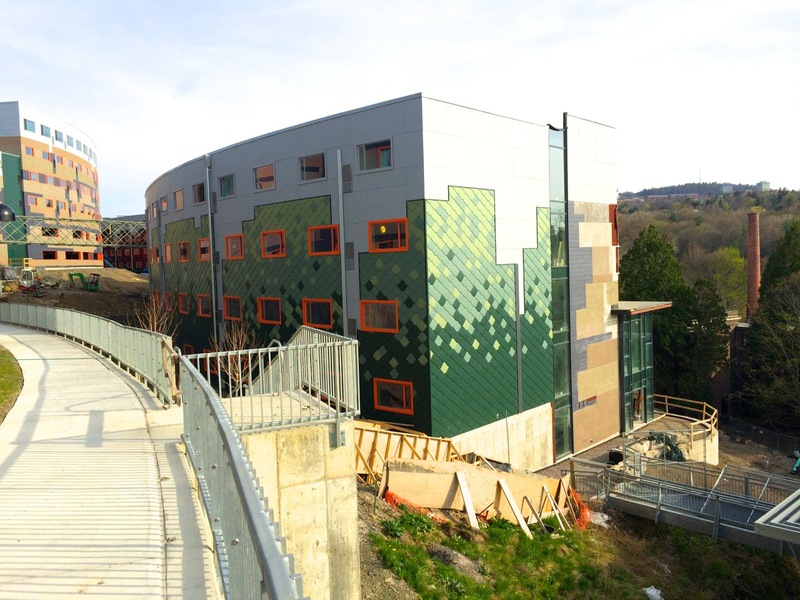 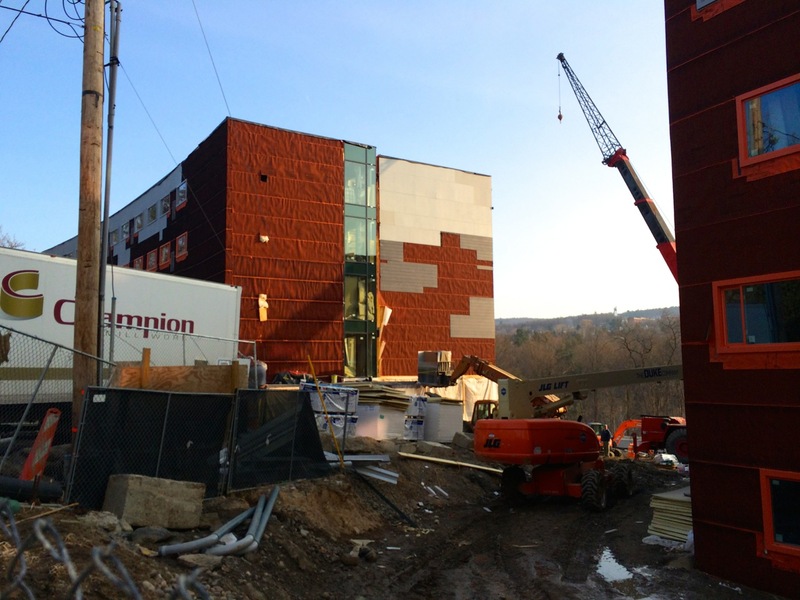 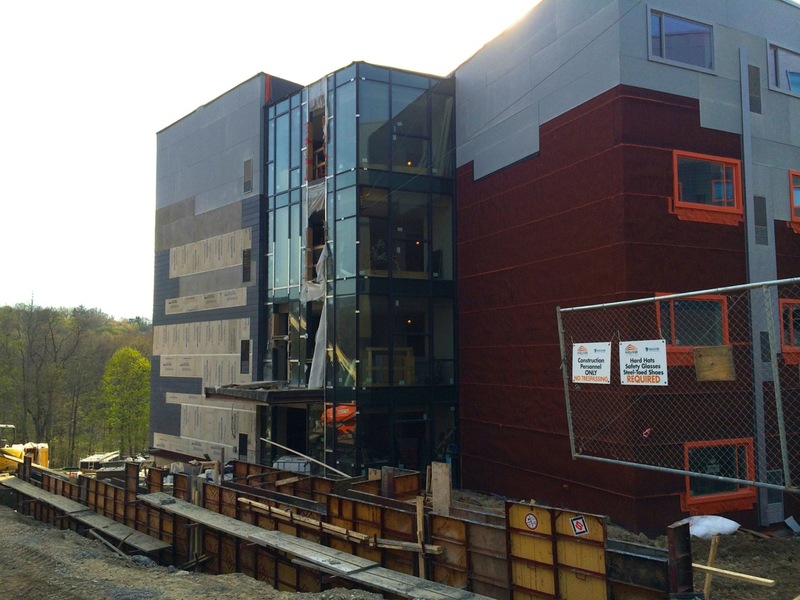 Building 5’s eastern stairwell has also been fully-clad in glass panelling. 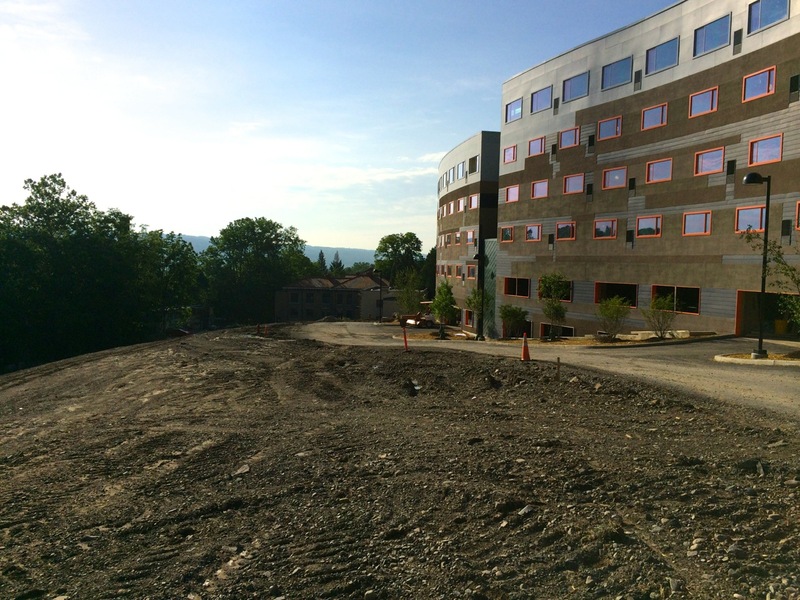 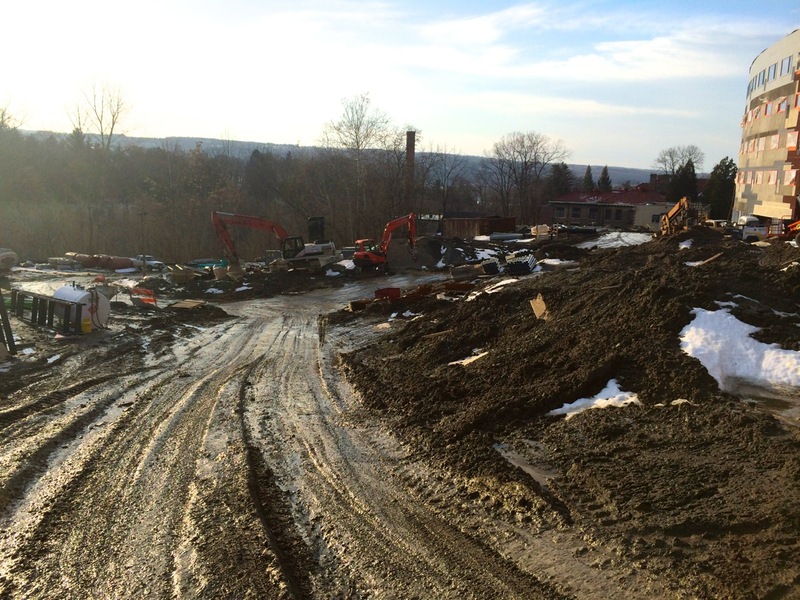 I was mistaken in earlier posts about the timing for Building 7: due to the appeal to reduce planned parking and increase housing units before the City of Ithaca Board of Zoning Appeals, and the fact that the building is still in design phase, the timing for the project will probably fall into next year for starting excavation and sitework. 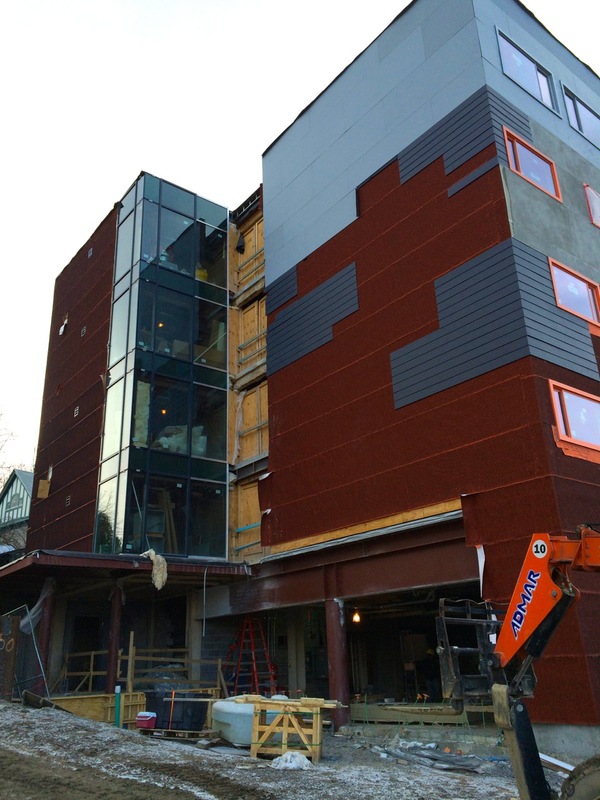 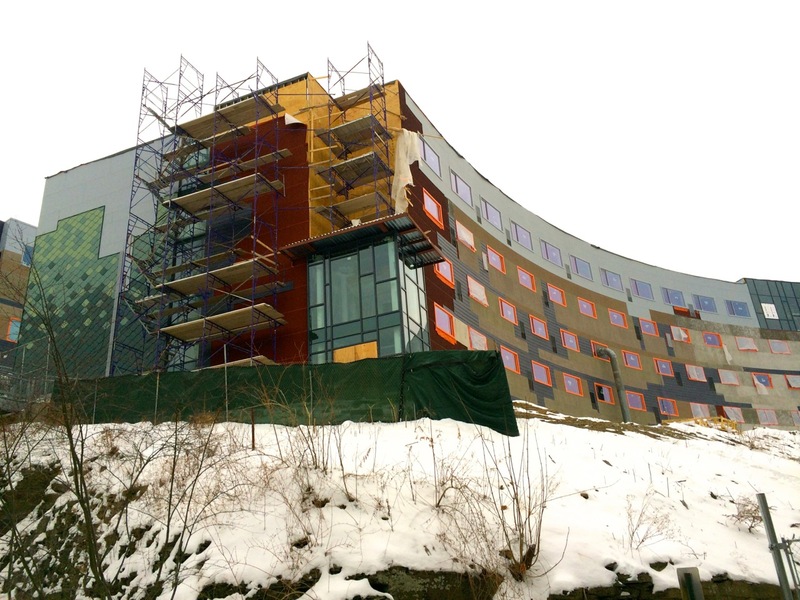 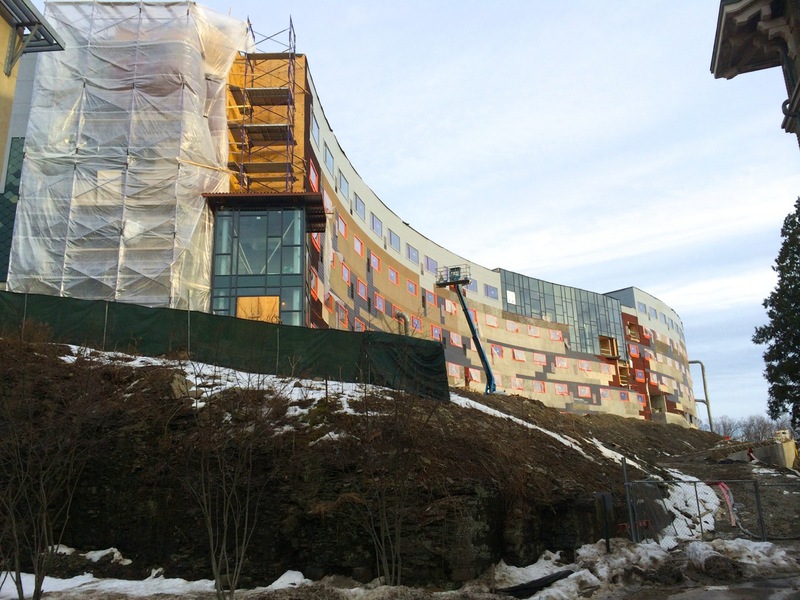 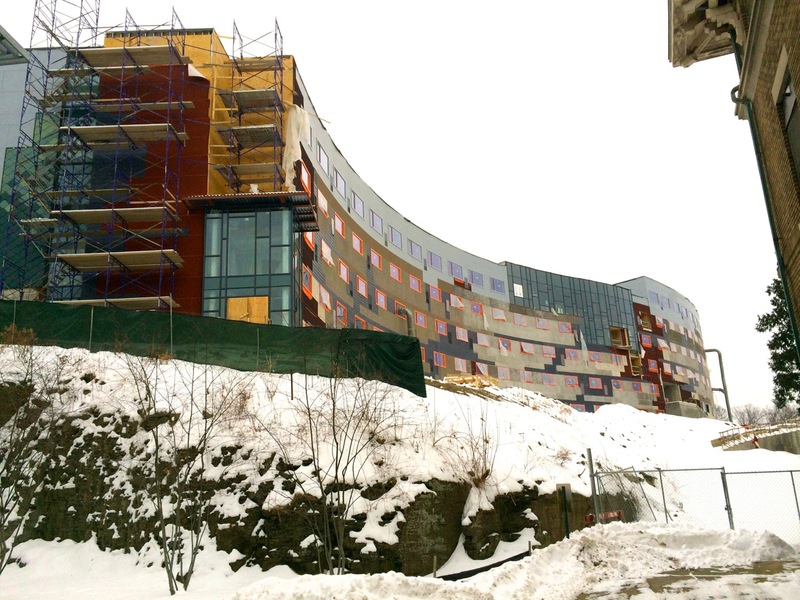 Some facade-panelling has progressed on Collegetown Terrace‘s Buildings 5 & 6 since mid-march, and Building 5’s eastern stairwell has its steel window wall framing installed, so glass should follow-up soon to match the installation currently on Building 6’s western end. 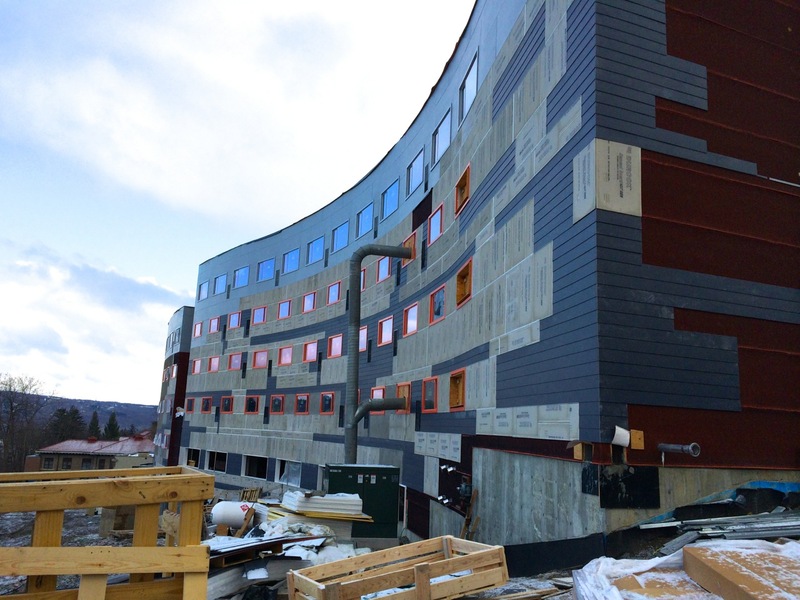 The stairwell ends were used for loading-in building materials, so the closing-up is probably a good sign that the interior is well on its way. 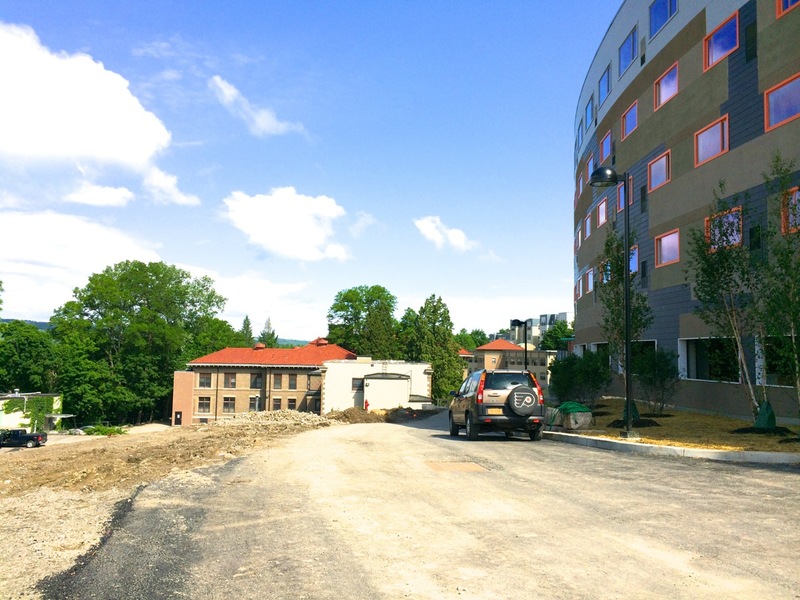 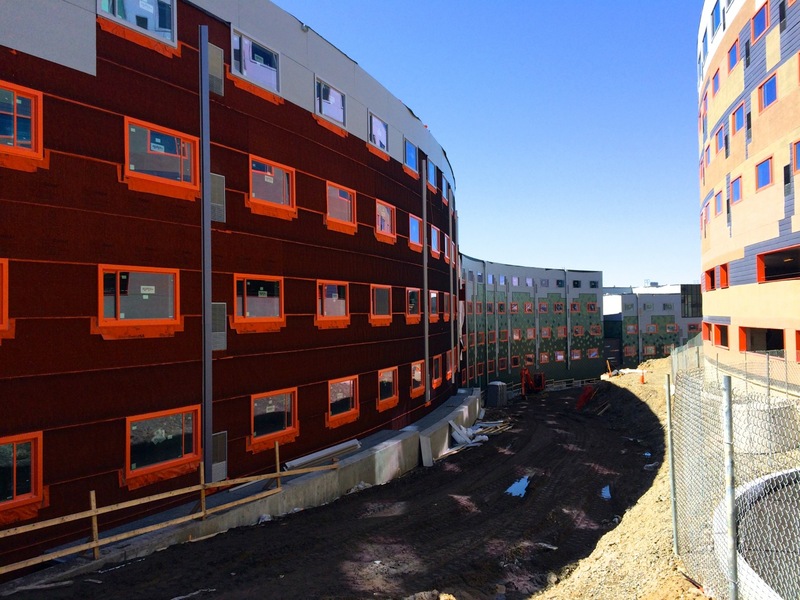 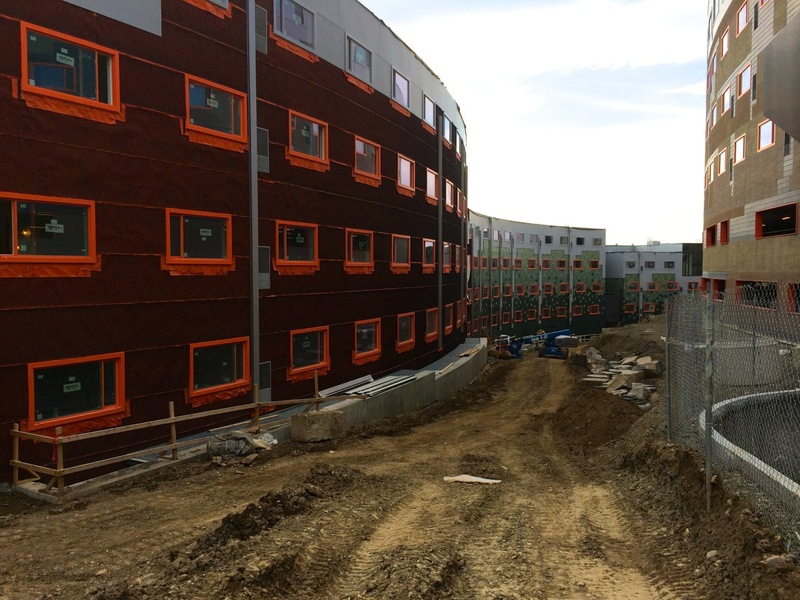 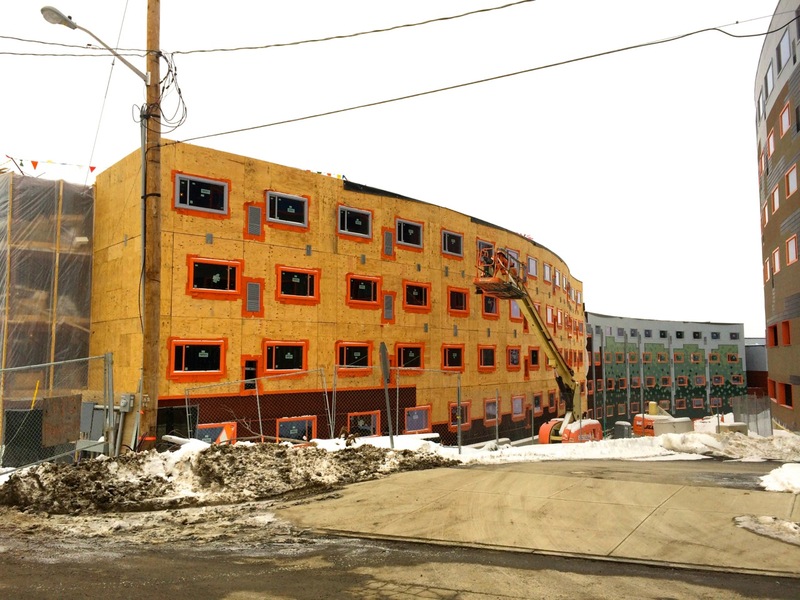 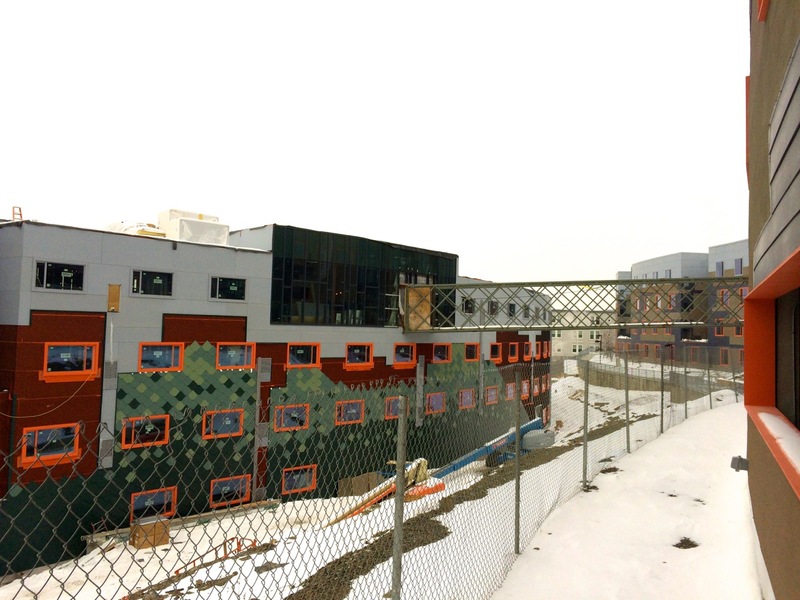 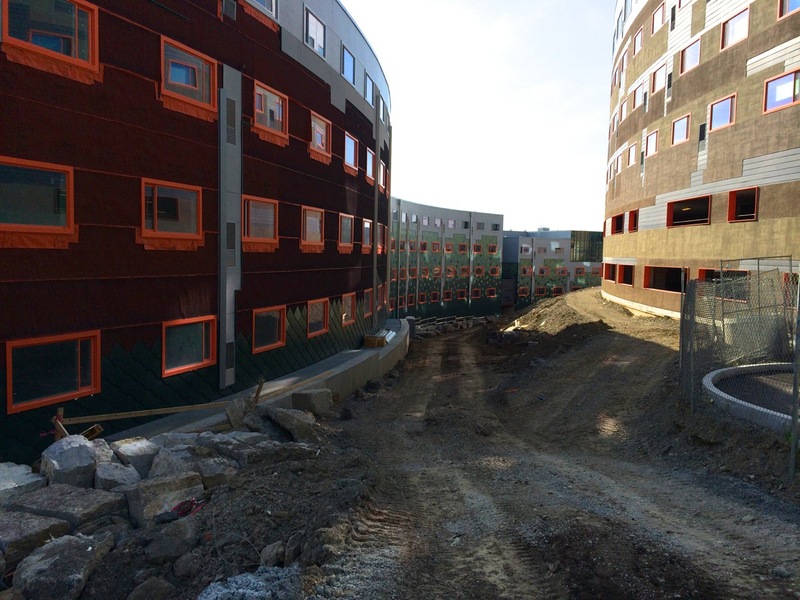 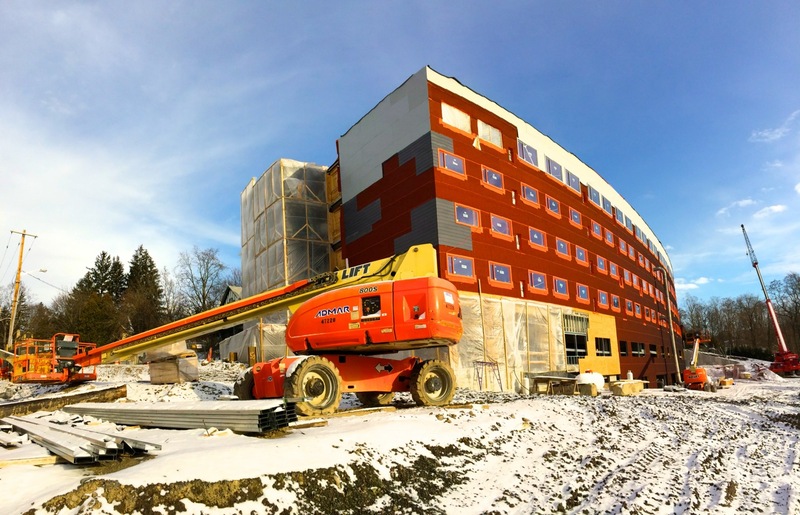 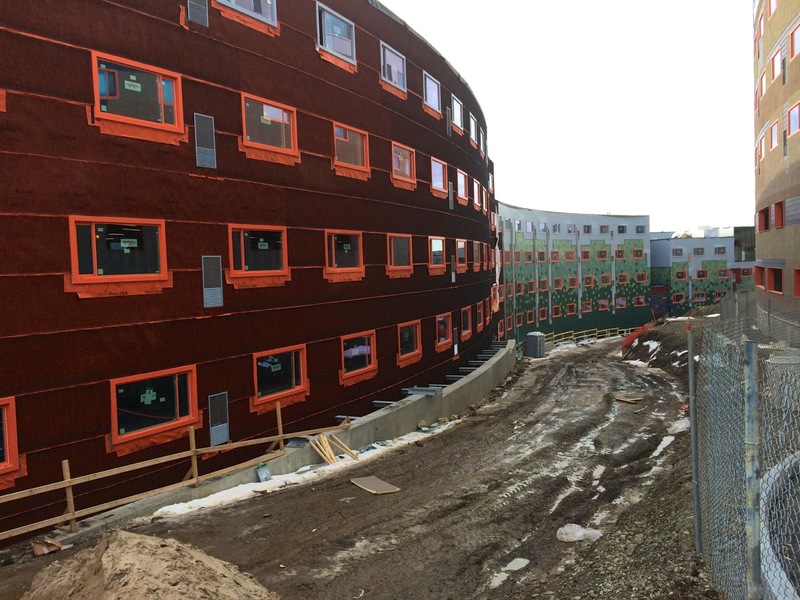 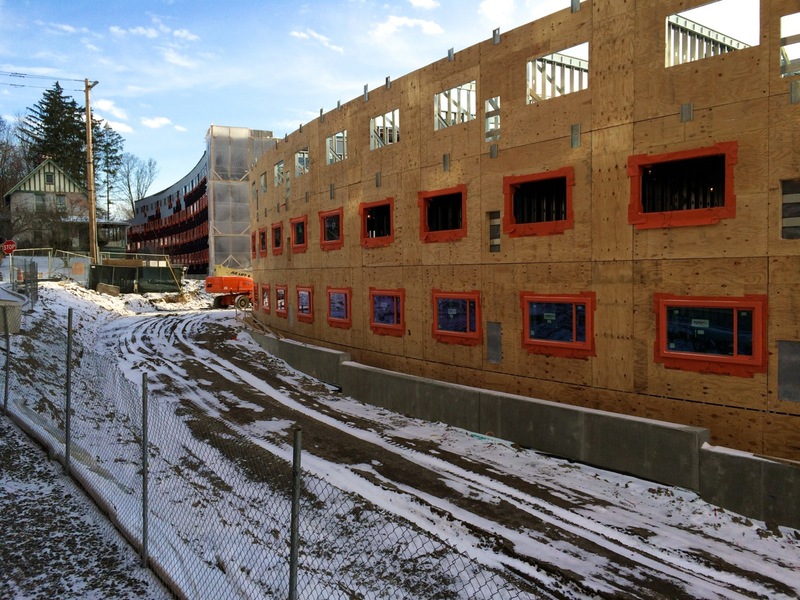 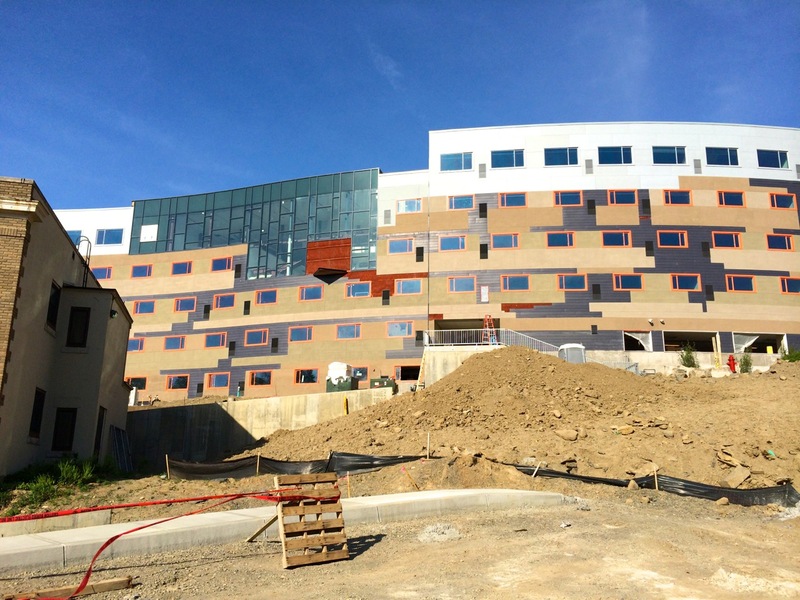 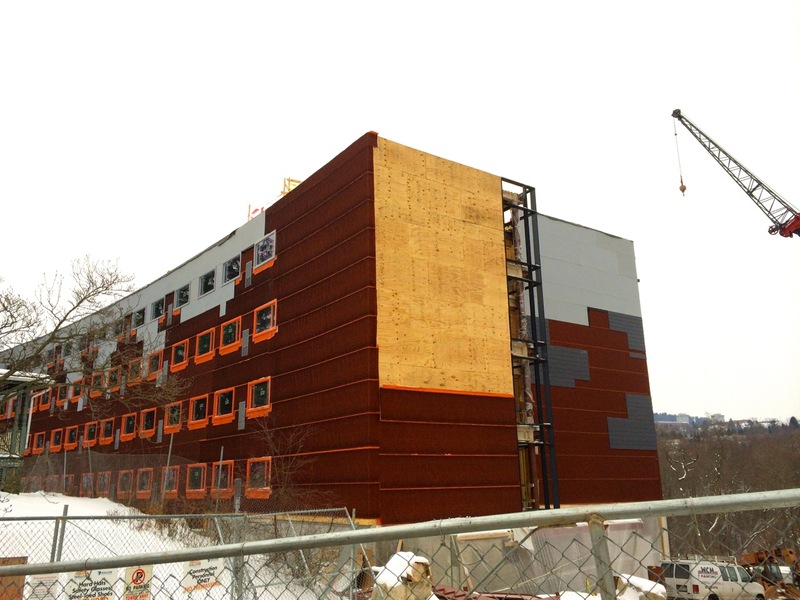 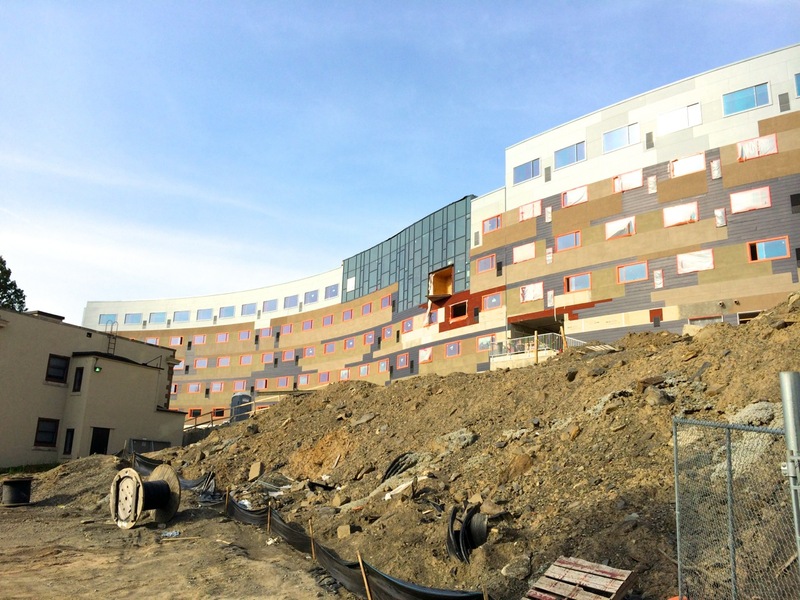 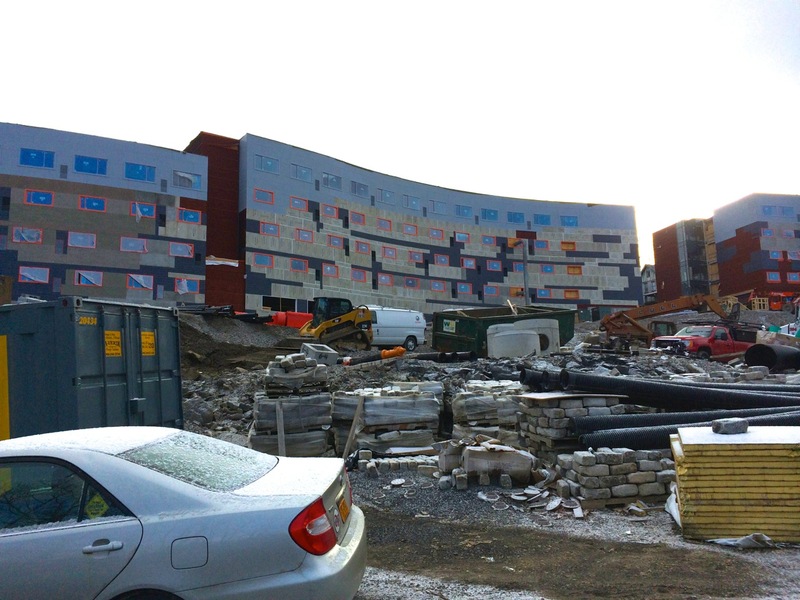 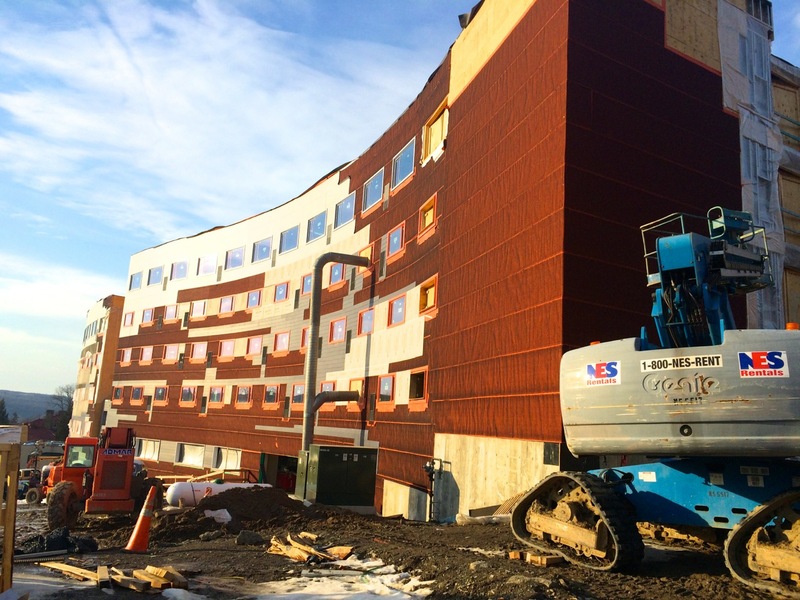 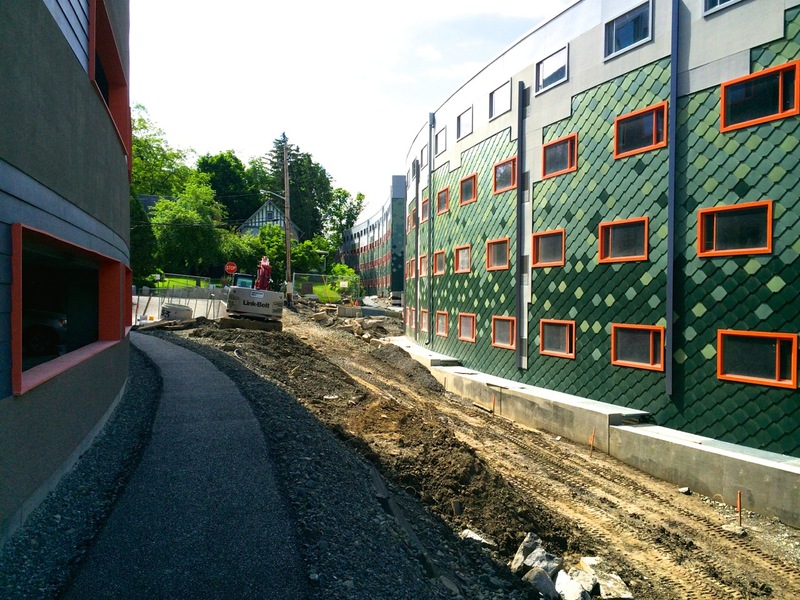 Now in March 2014, we’re coming-up on both Buildings 5 & 6 ready for leasing for the start of Fall semester, which, as noted in Ithacating, means an addition of 167 units (Building 5) and 71 units (Building 6), for a total of 238 units. 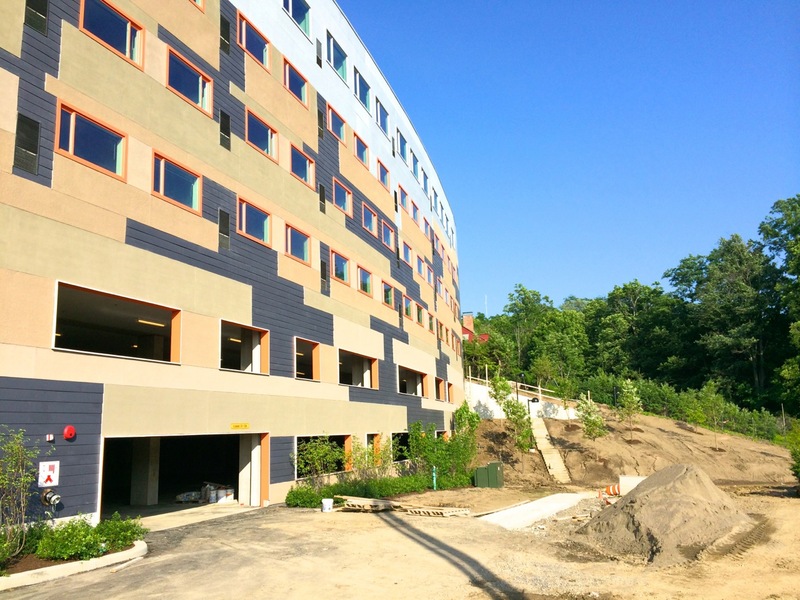 Building 7 is now planning for 247 units (up from 178), with the appeal before the Board of Zoning Appeals to convert the second parking level to dorm-style units, which will be leased at more affordable rates. 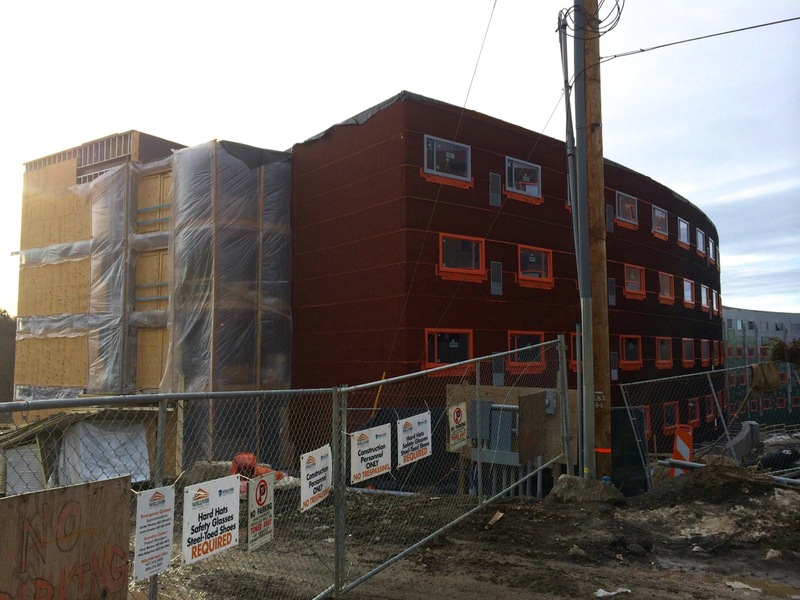 The appeal must be sought due to zoning for minimum parking requirements and minimum lot area per number of housing units. 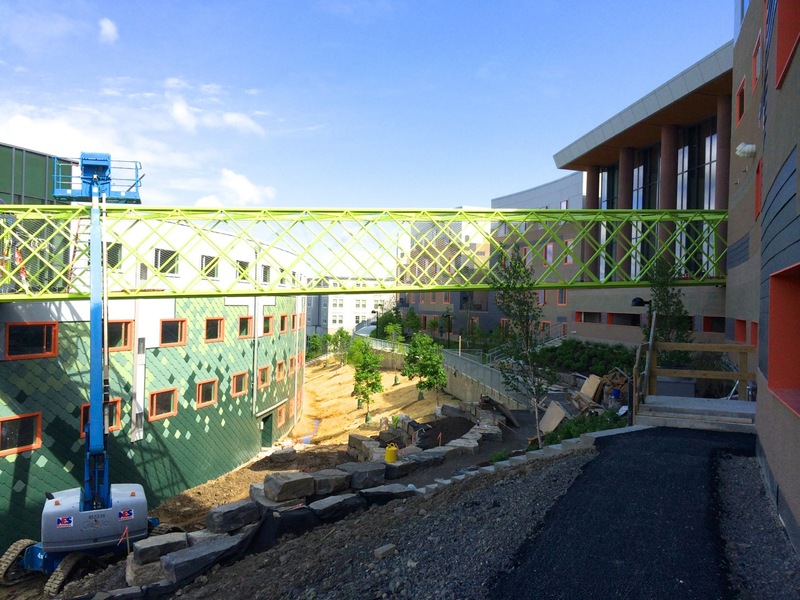 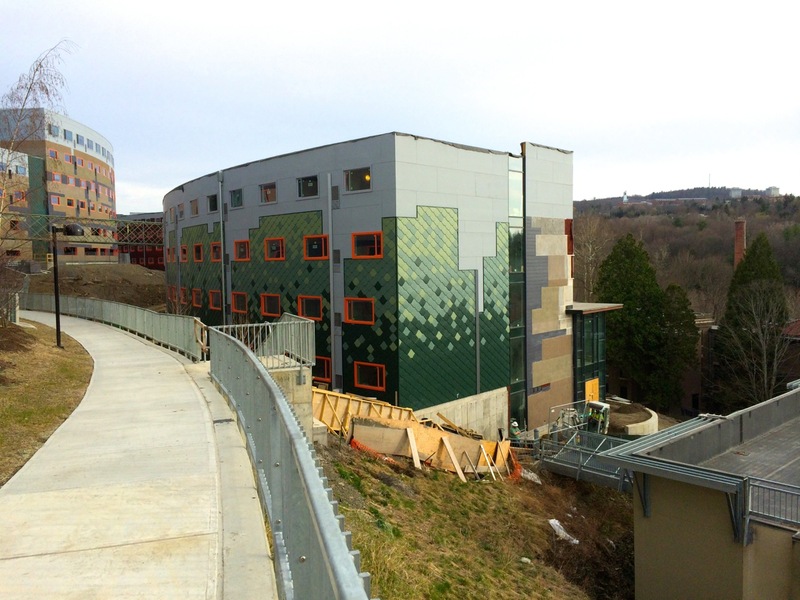 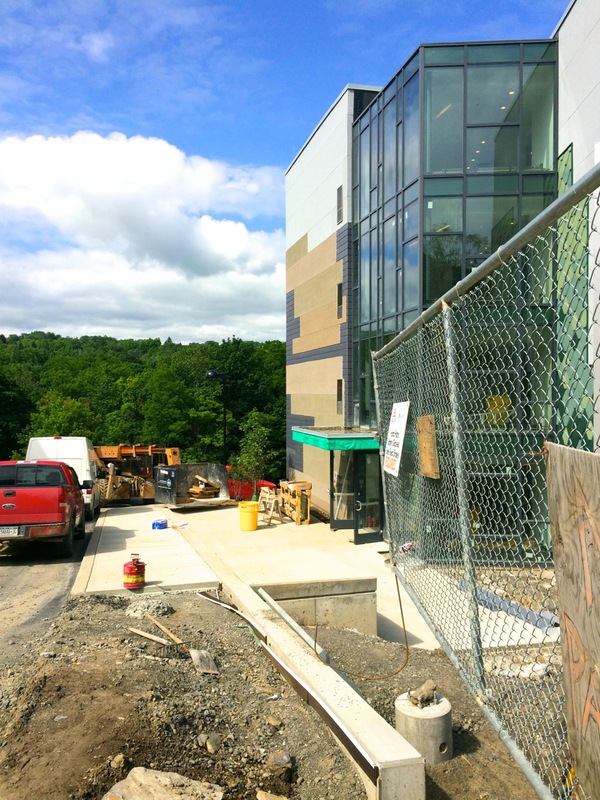 The gates were closed, so I didn’t manage any good north-facing shots of Building 6, but here’s a quick photo update for the Collegetown Terrace project. 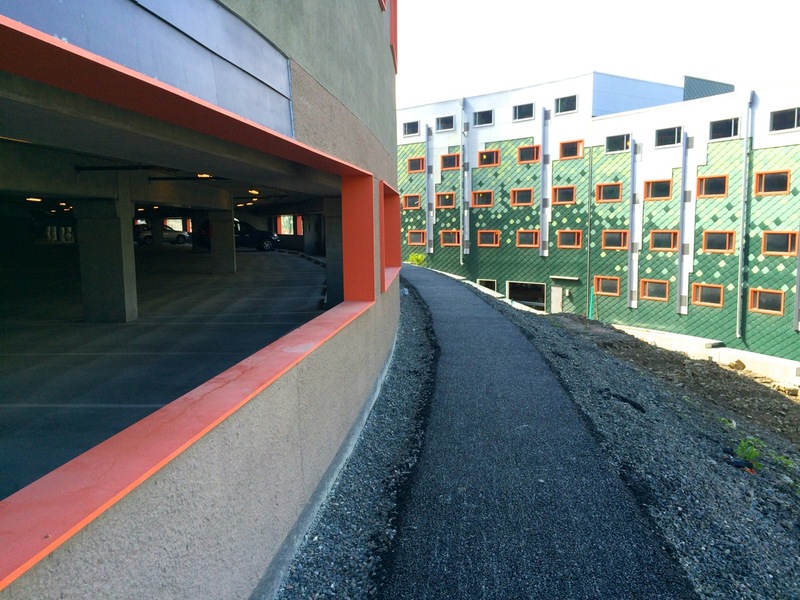 As Ithacating’s Article noted, Building 7 (Phase 3) will be starting shortly (the whopper $70 million bridge loan was approved last August), and Novar-Mackesey has put forward a proposal to the Board of Zoning Appeals to swap-out a parking floor on Building 7 for more apartments, due to the under-utilization of current parking spaces. 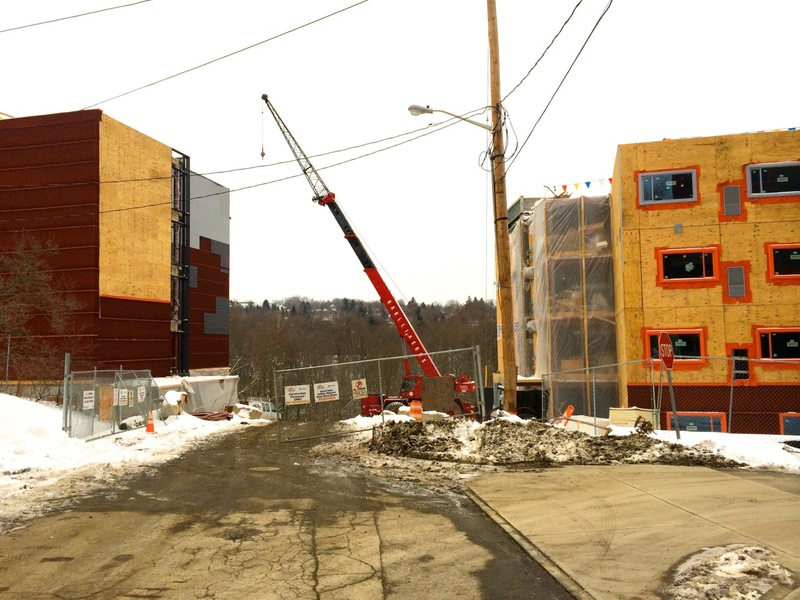 I’ll admit from visiting the site quite often, there are many spaces always open, and I can’t call myself a fan of zoning regulations requiring minimum parking amounts per housing units built, since it’s generally not an optimal or equitable policy. 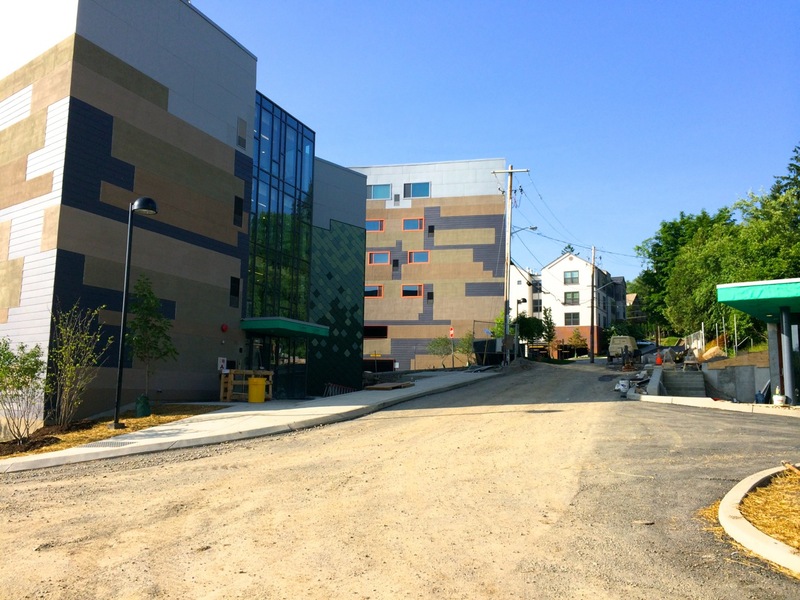 Since the project already has so many spaces, it would make sense to tailor the remainder of the project to fit the proven absorption, and good news for those walking: the State & Mitchell Intersection was completed back in mid-January, so crossing the street is now much easier. 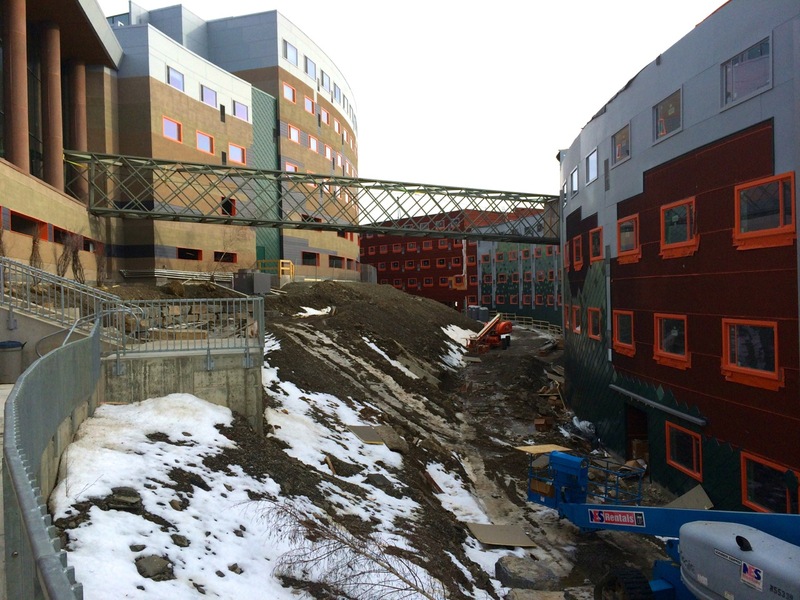 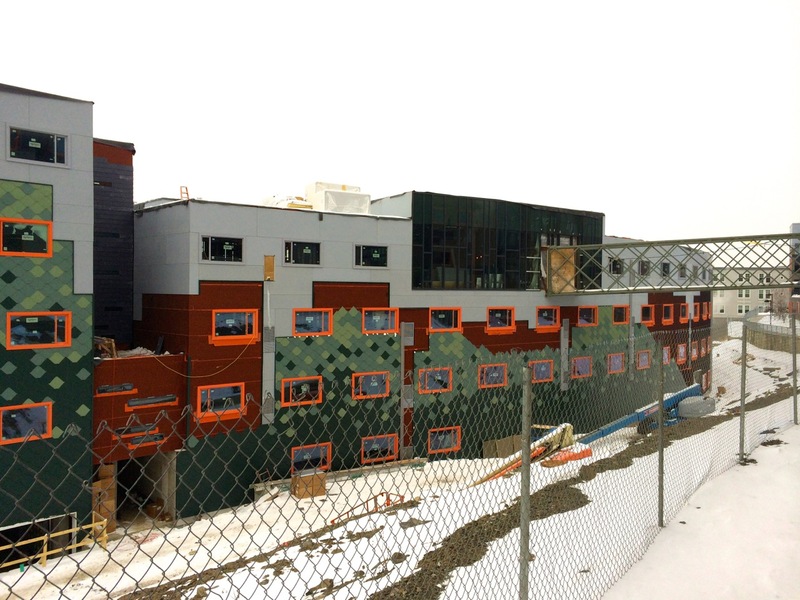 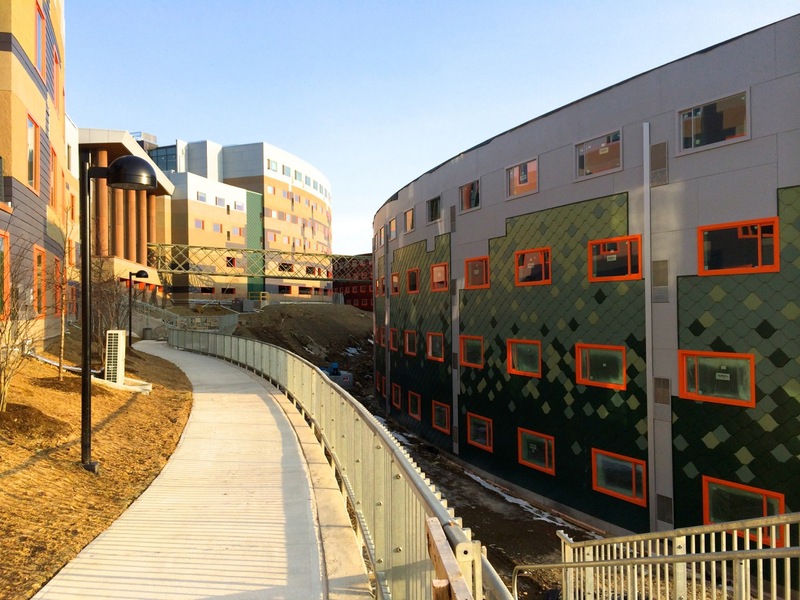 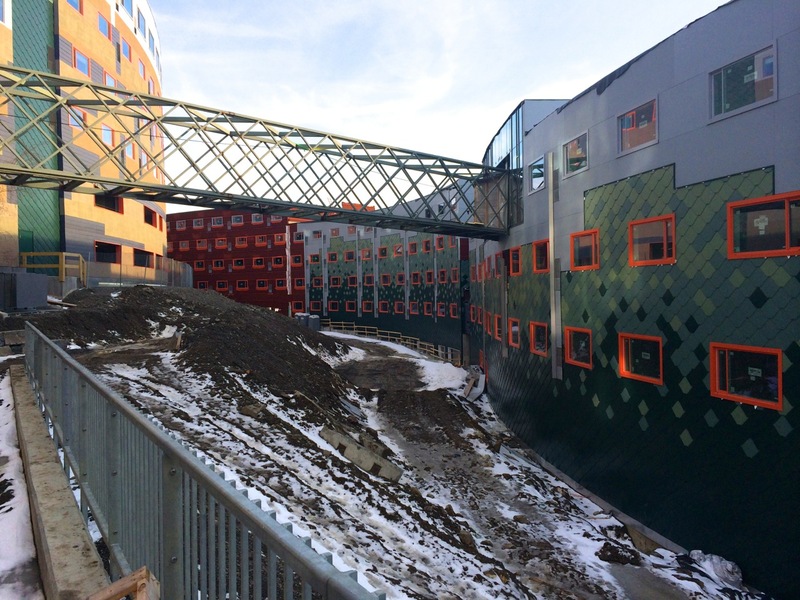 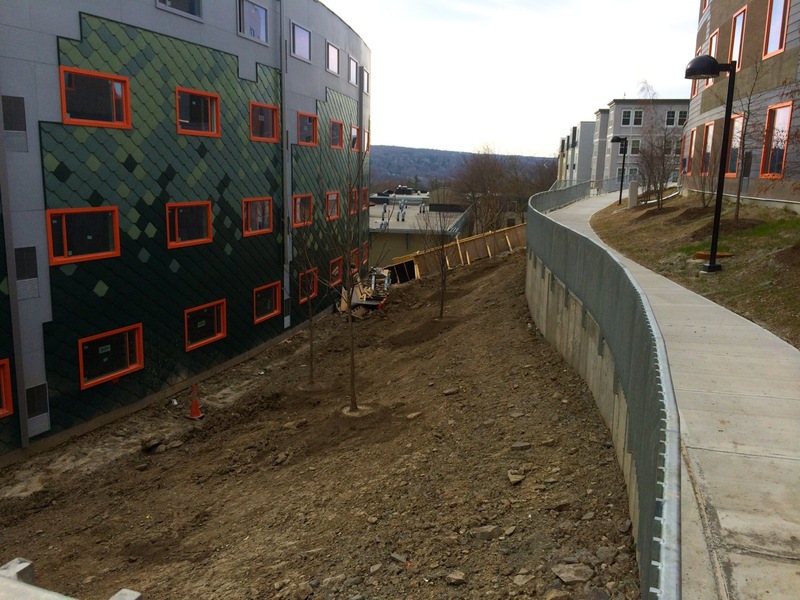 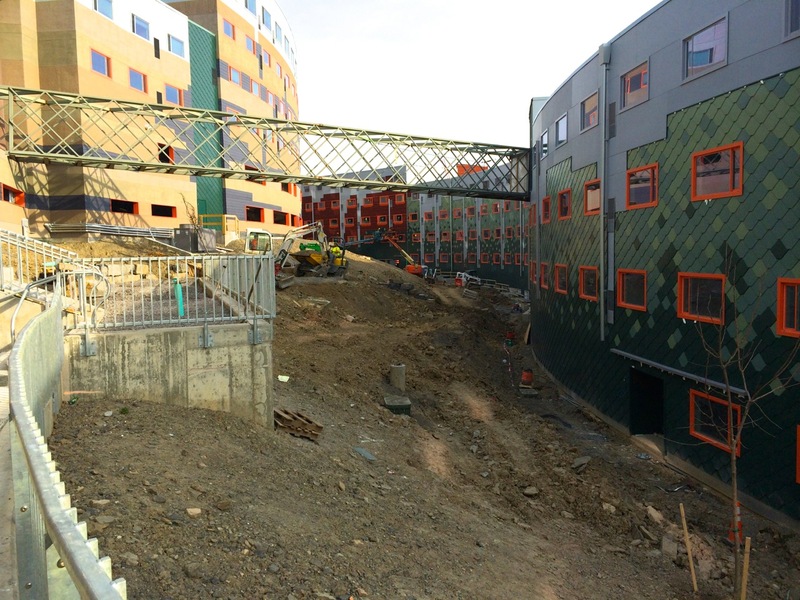 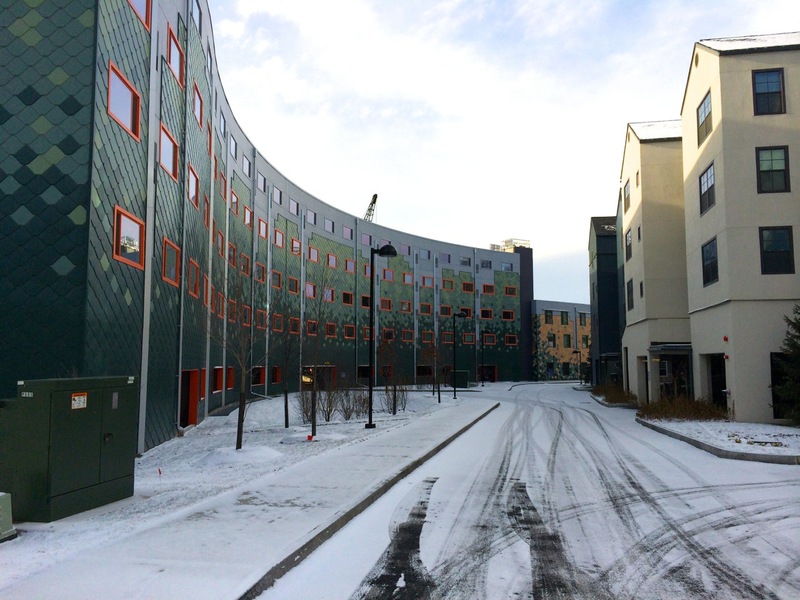 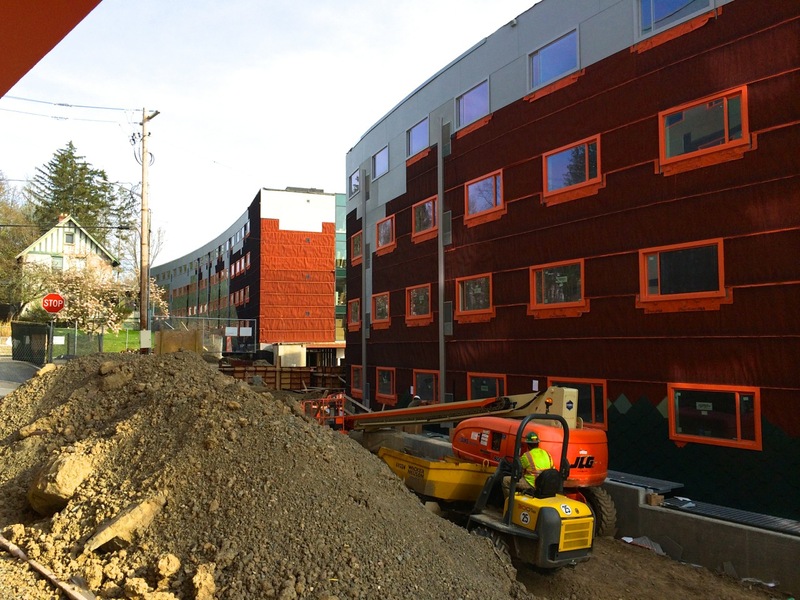 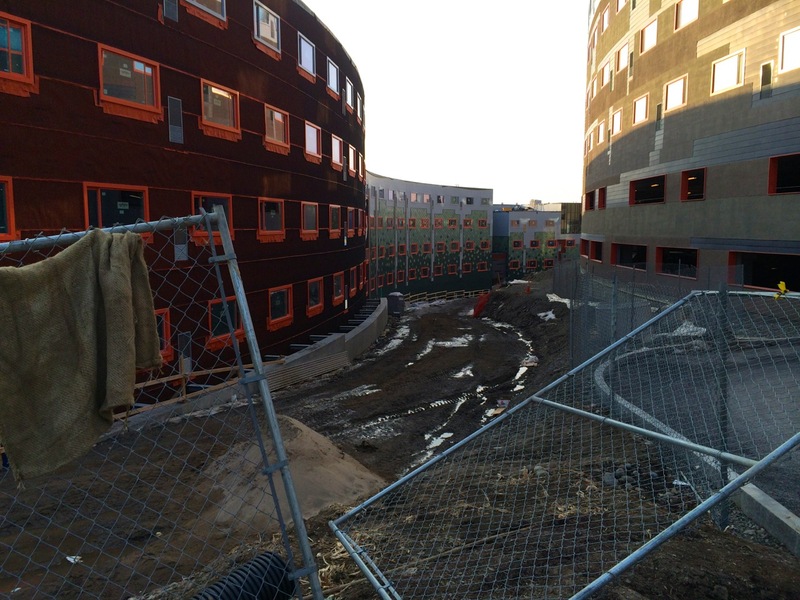 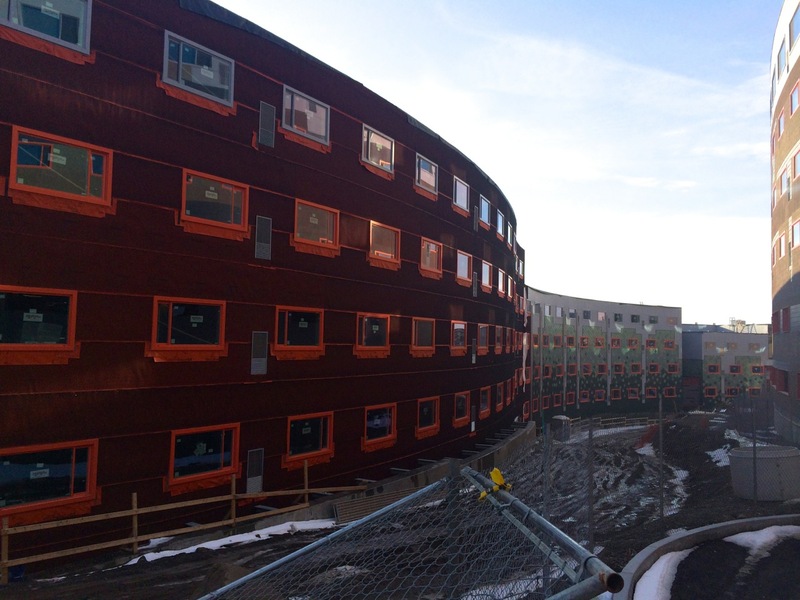 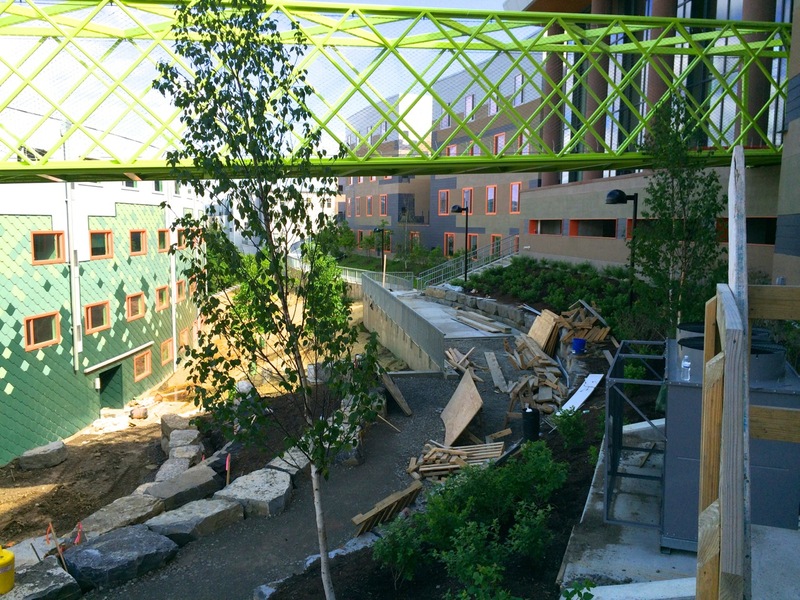 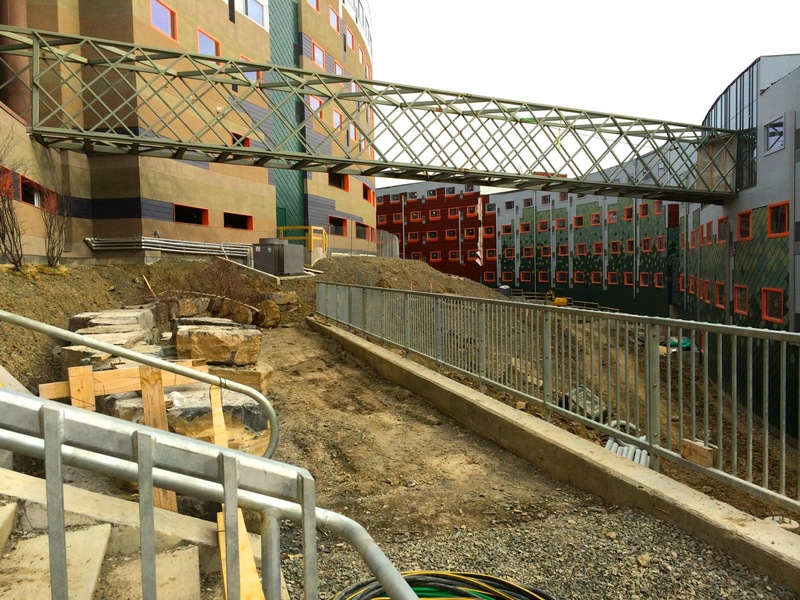 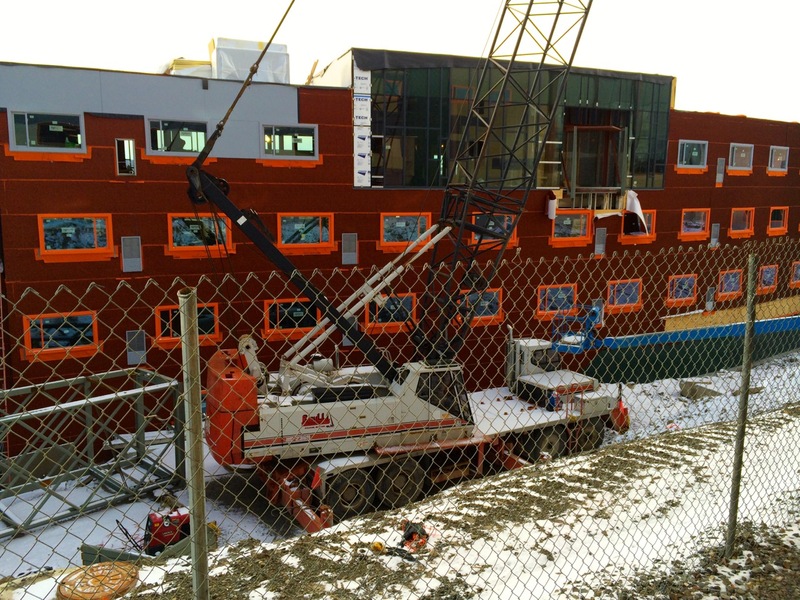 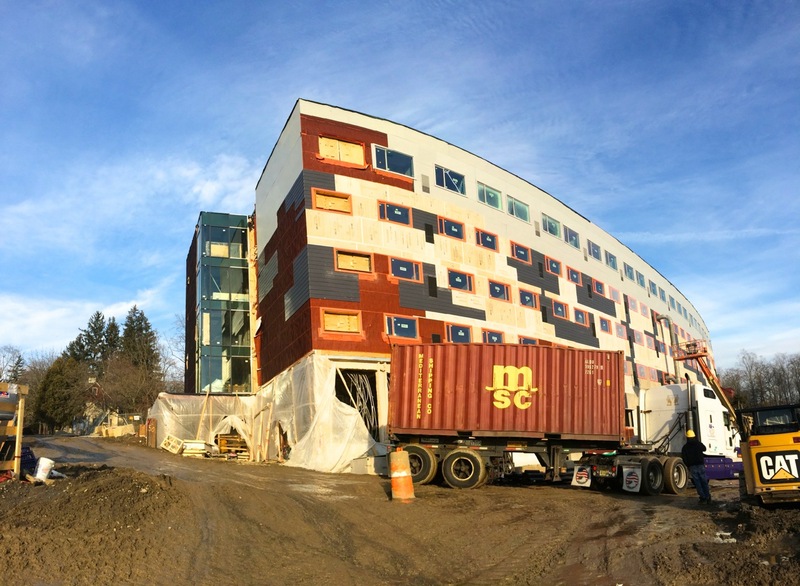 Here are some shots of the Novarr-Mackesey Collegetown Terrace Project taken this past Sunday- I last visited in late December. 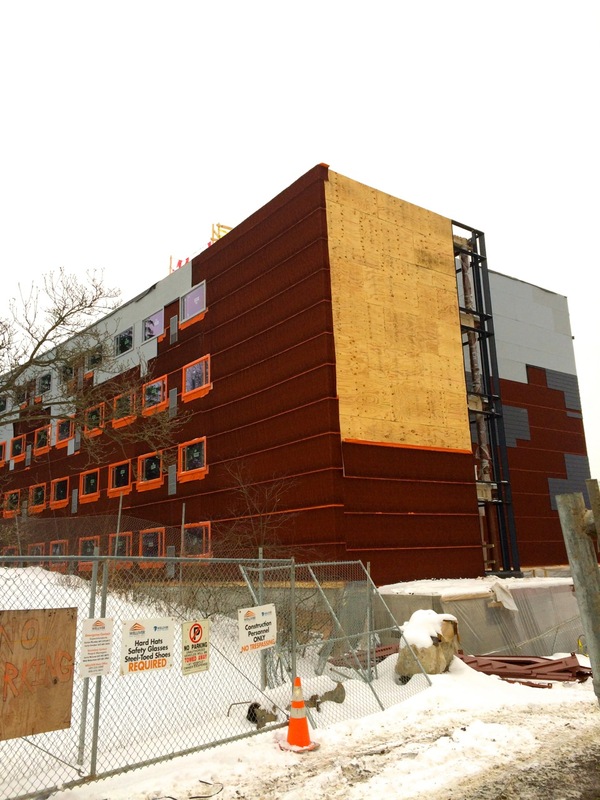 Building 5 has been fully framed, sheathed, and windows have been installed up to the final fifth level, with just a bit more sheathing work to be done on the western end and also the stair tower on the eastern end (which is used for loading-in materials anyway). 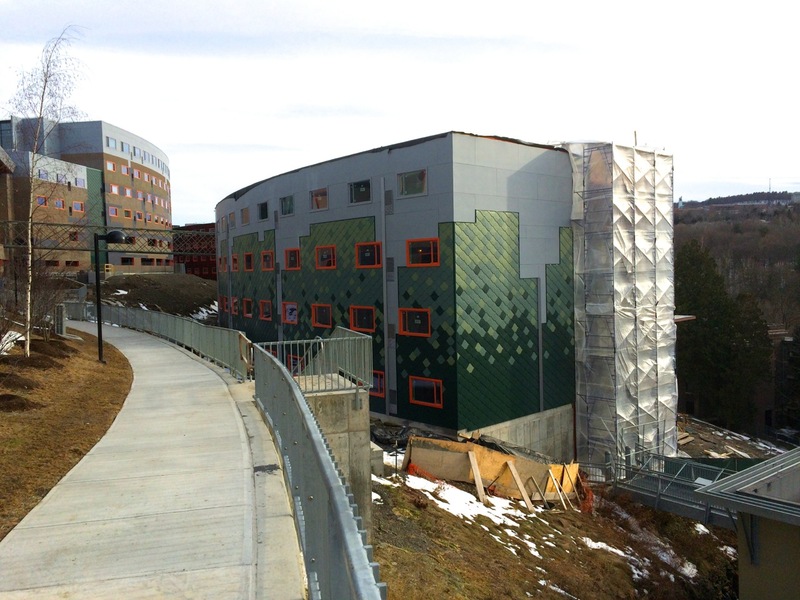 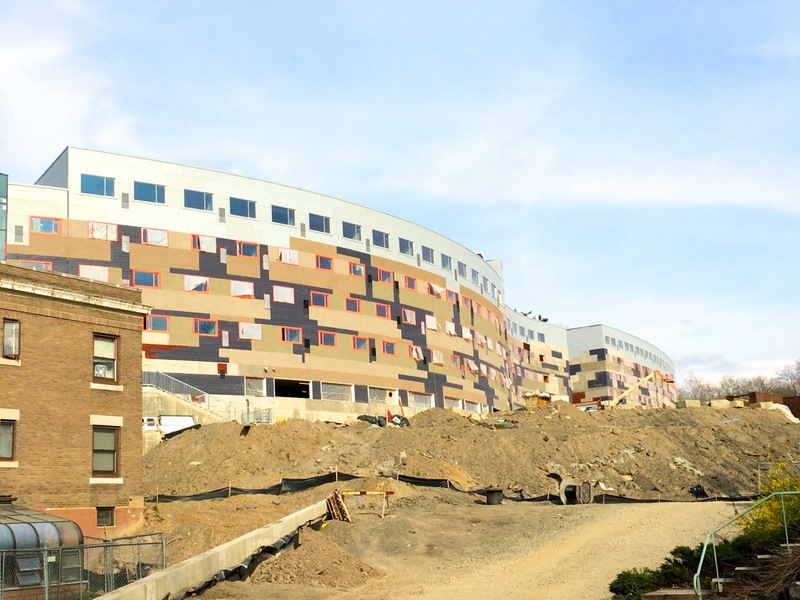 Building 6 has nearly completed weather wrap installation, and the facade panels are coming along, which began at the top level. 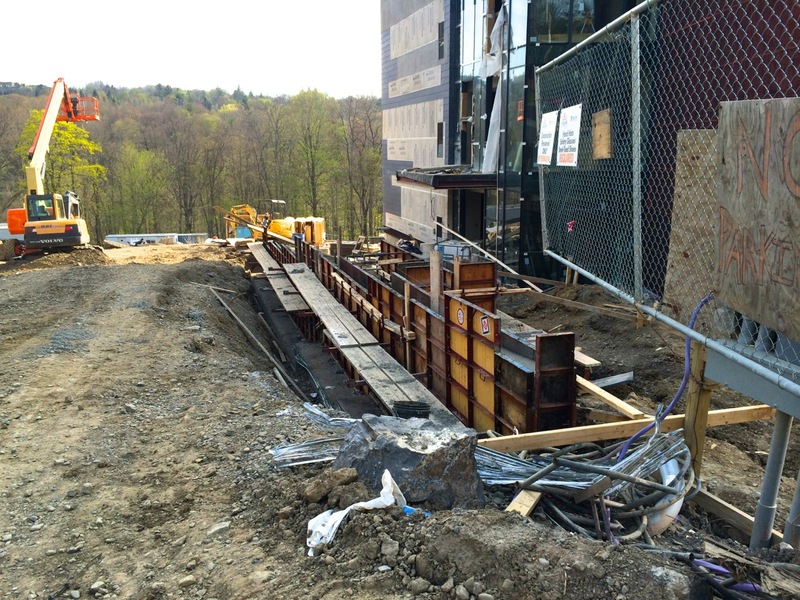 The pre-fabricated rectangular steel piece for the elevated walkway towards the center of Building 5’s northern face (the glass-covered common area) has been lifted and secured into place, providing a path from Building 5 to Building 3.4, at the south side of the entry pavilion. 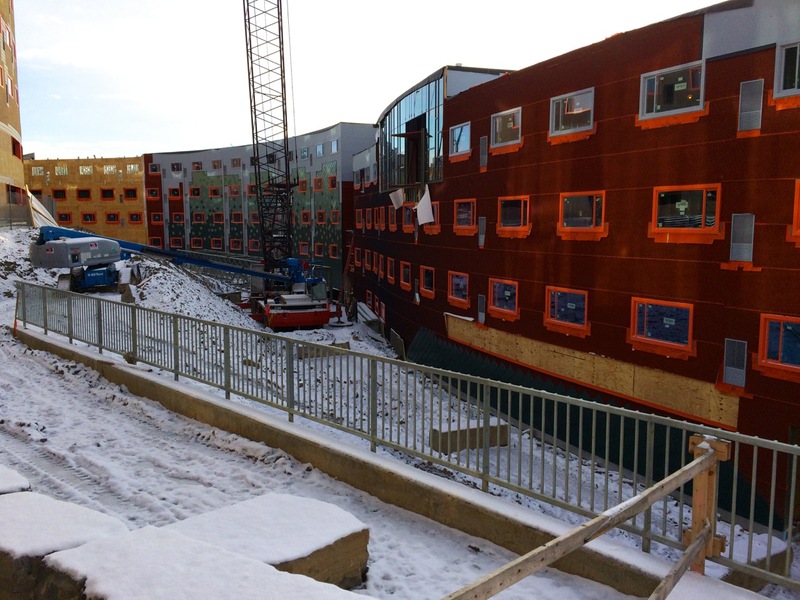 From what I can see on the outside through the glass, the work within the units themselves has been progressing well, and even in this cold, the amount of exterior work in the past month is impressive. 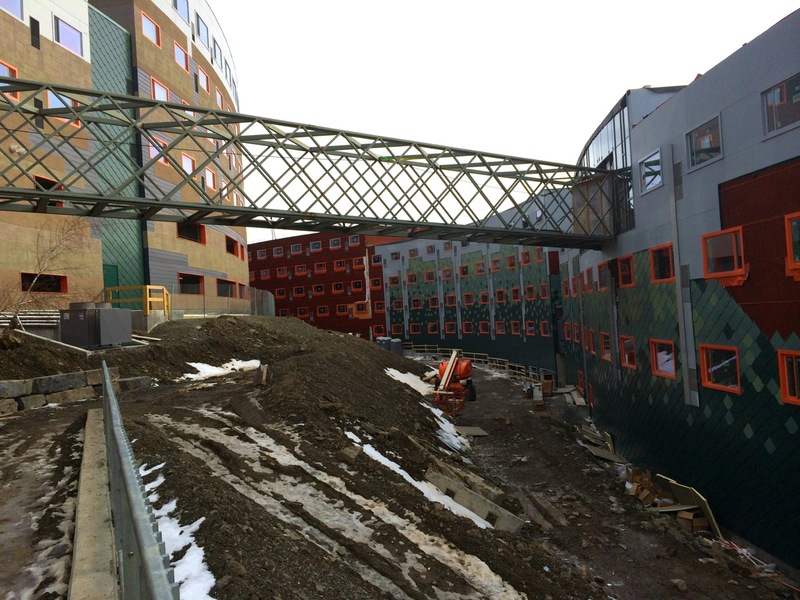 From the shot of Building 5’s southern face, you can also see the opening for the future elevated walkway from Building 5 to Building 7, which will be the last, largest, and longest building in the project (and it looks as if the retaining wall has already been poured). 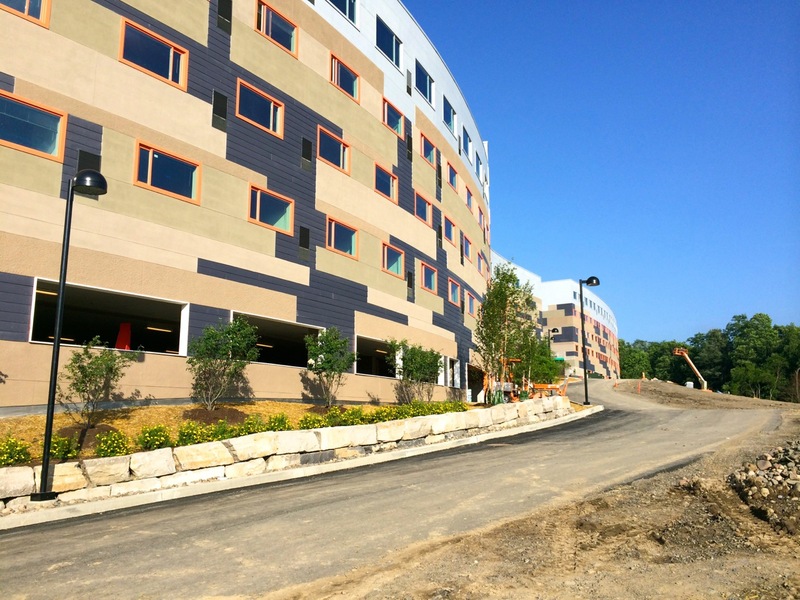 The apartment development has a cool new website you can check out, with a bunch of new photos, and floor plans images for each individual floor layout. 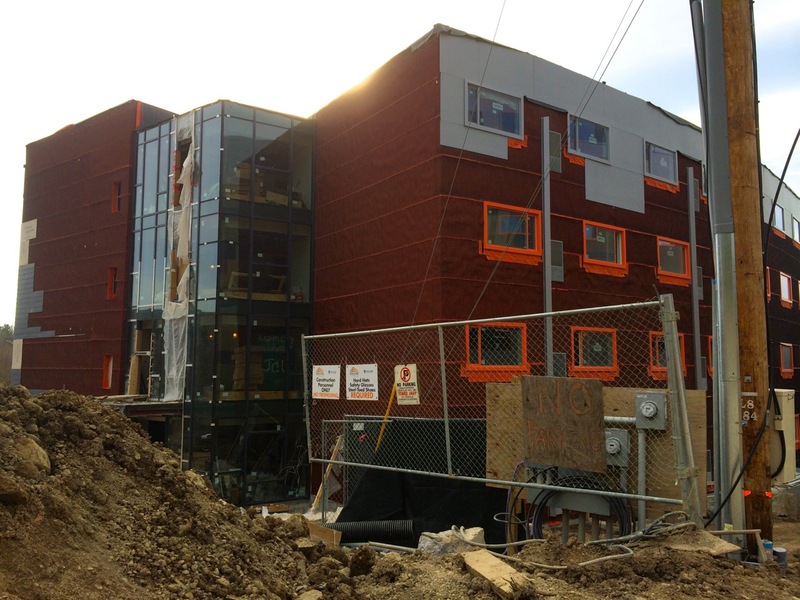 Novarr-Mackesey‘s Collegetown Terrace project has made some great progress in the past month with Building 5’s eastern section framed-up an additional three levels and the stair tower to its full height. 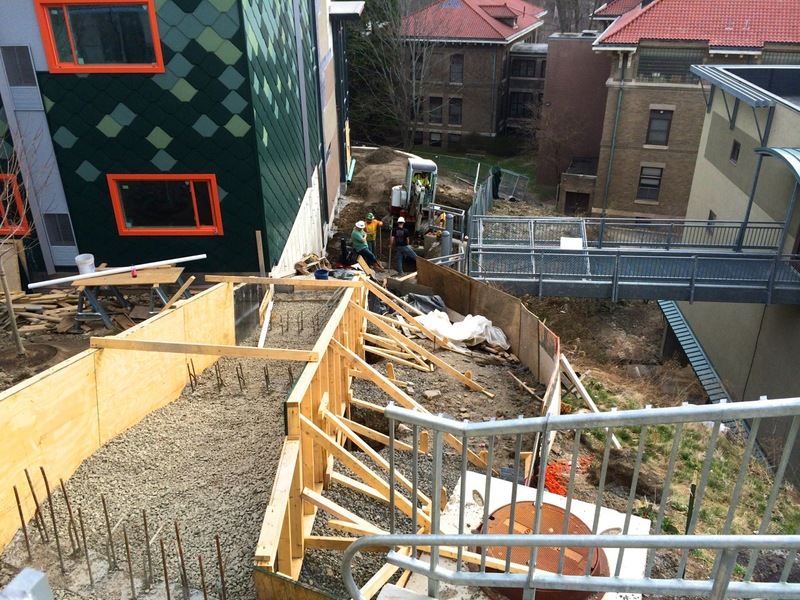 As noted before, Welliver has now taken the reigns for construction. 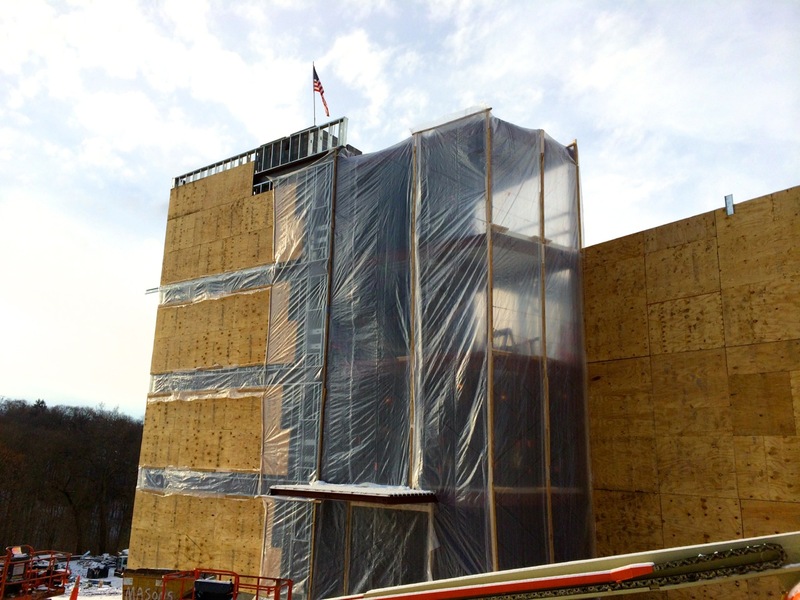 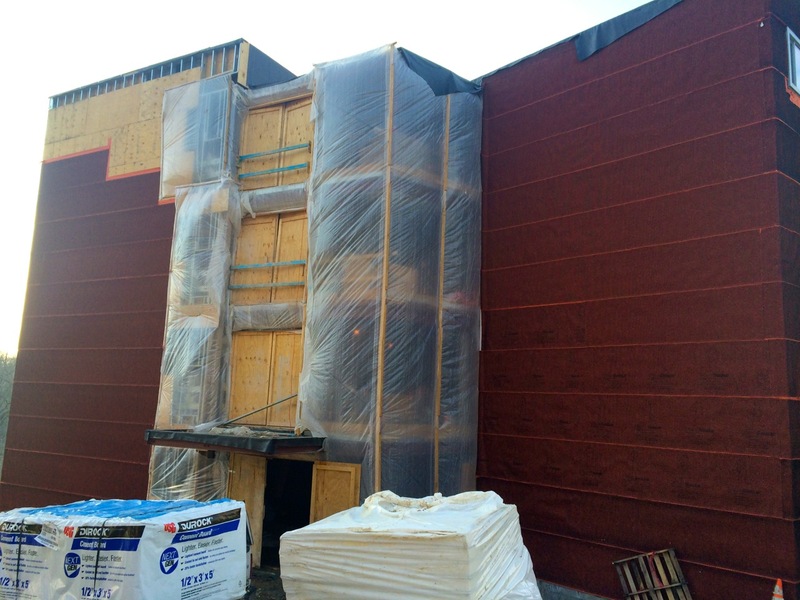 Building 6 looks fully-framed, and besides a few sections of sheathing to go in, the moisture barrier wrap has made its way around and facade panels have been installed on the top level and western side. 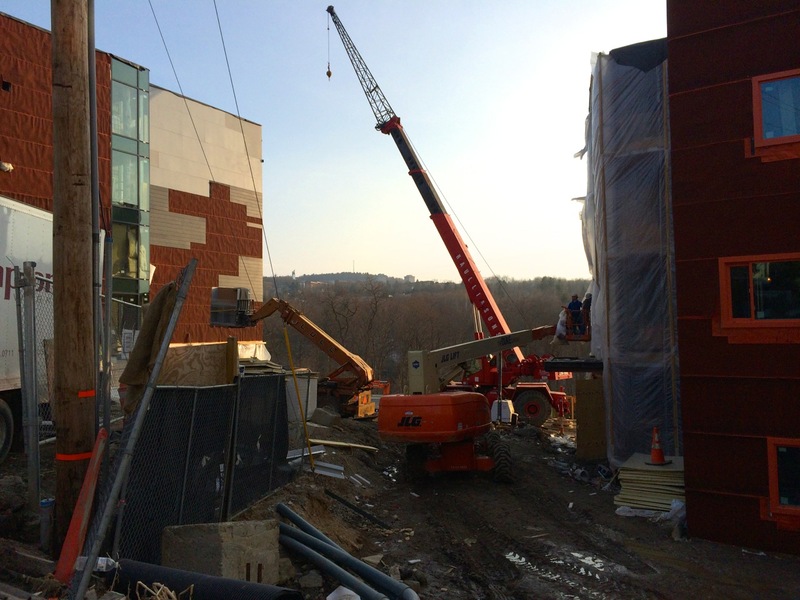 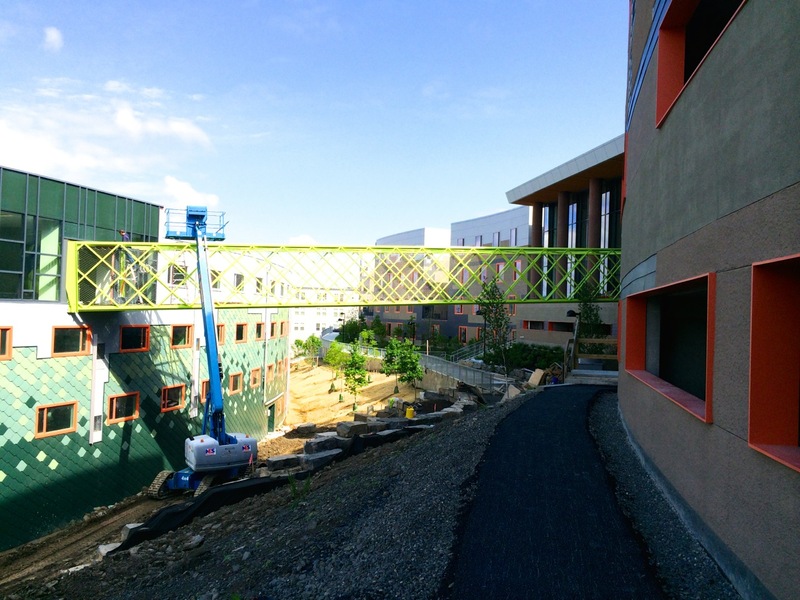 On the north side of Building 5 there’s a crane in place and a large pre-fabricated rectangular steel structure sitting on the ground, probably for the elevated walkway off the glass-enclosed common area. 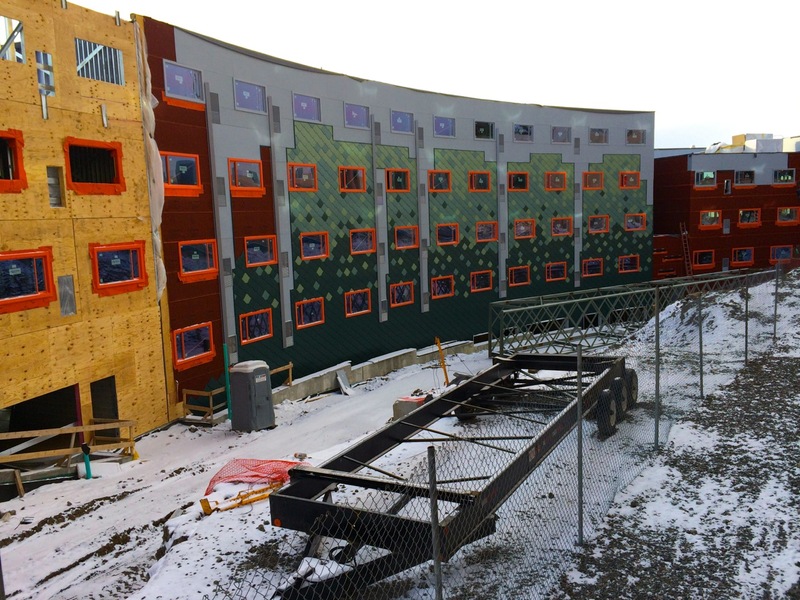 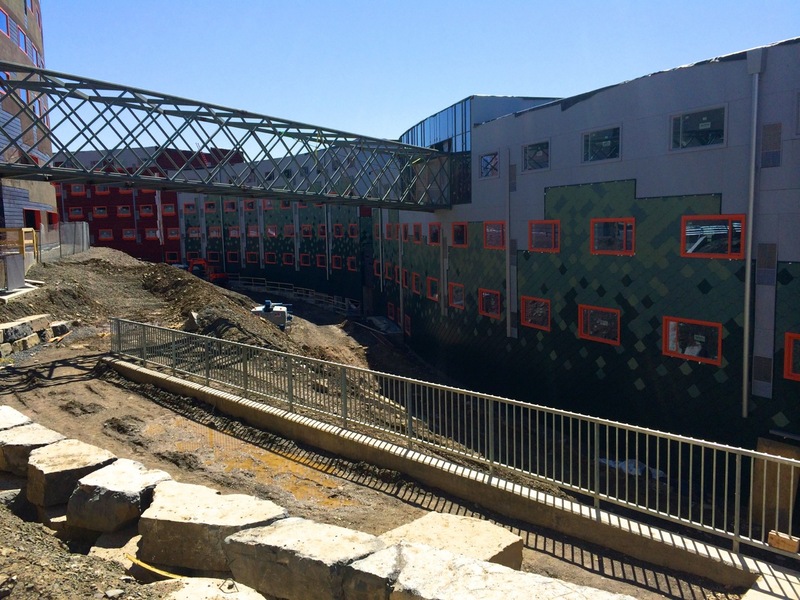 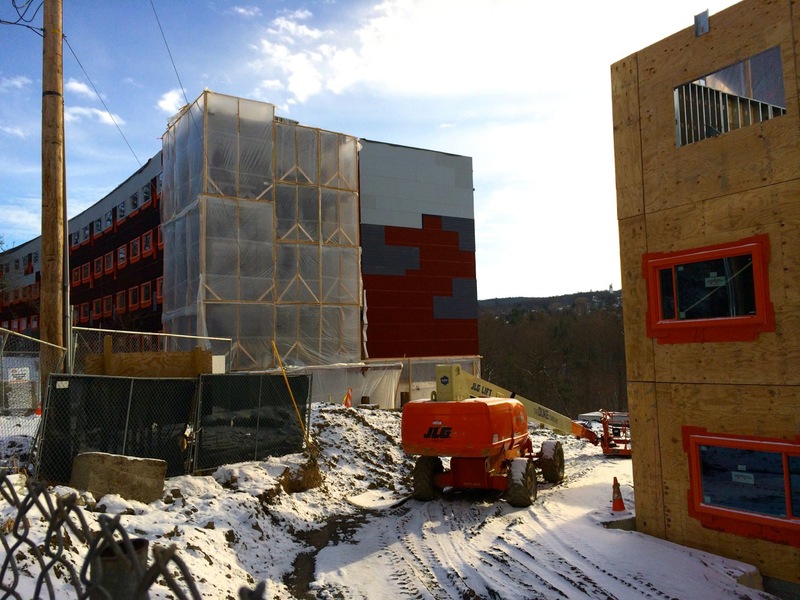 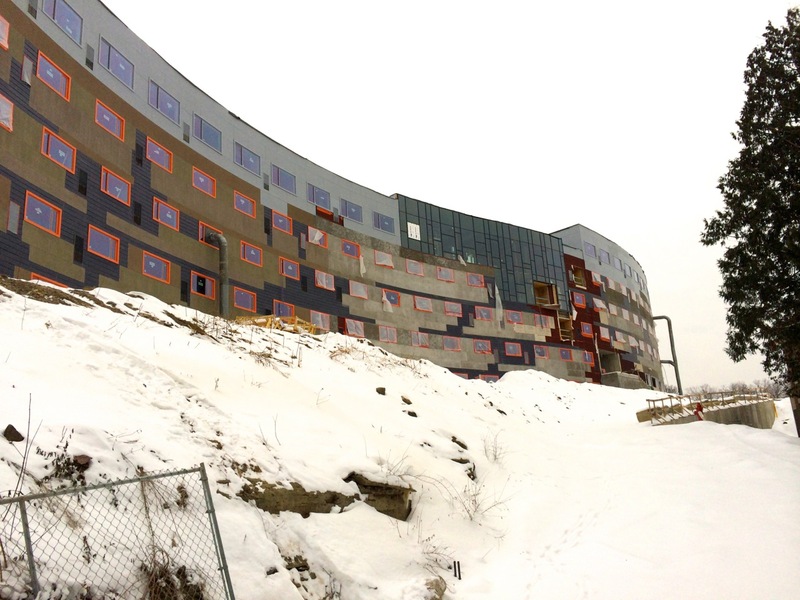 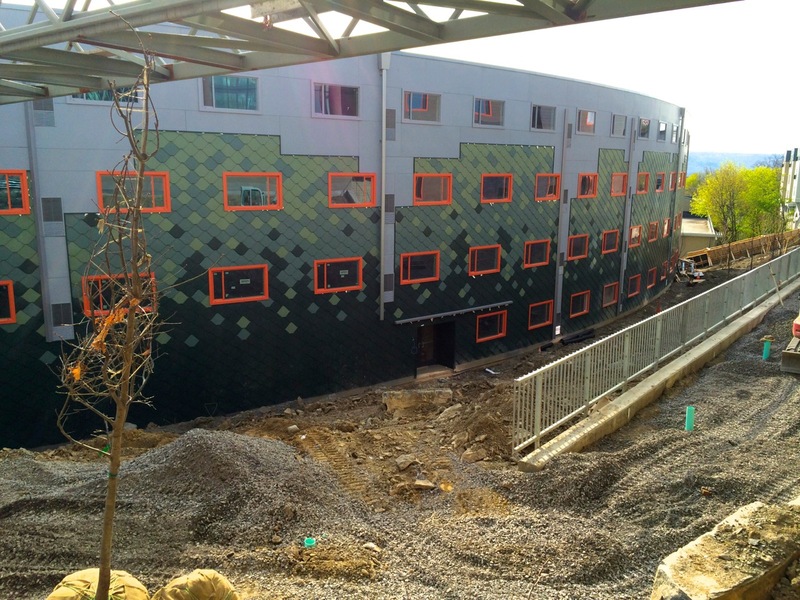 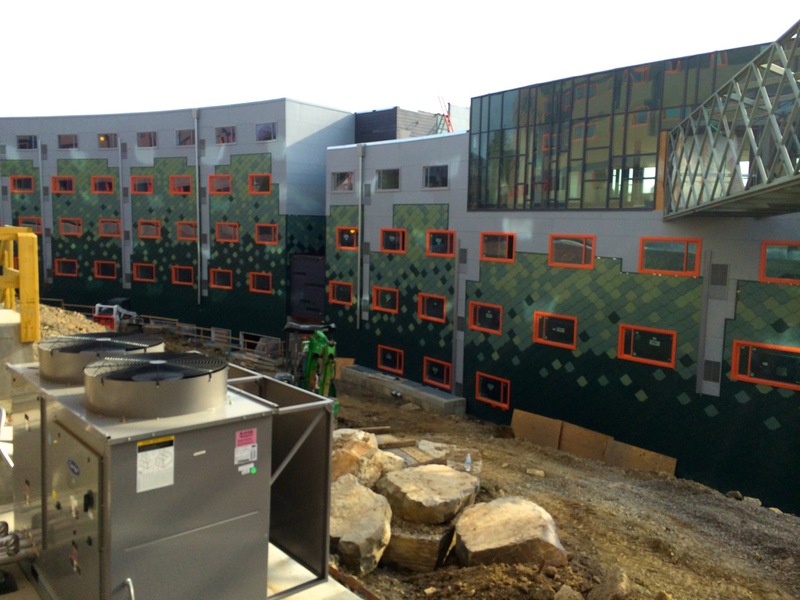 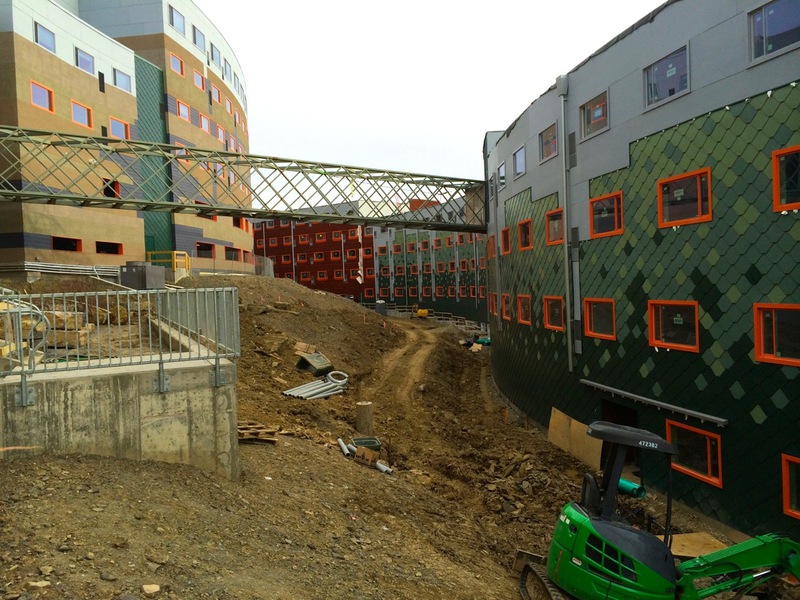 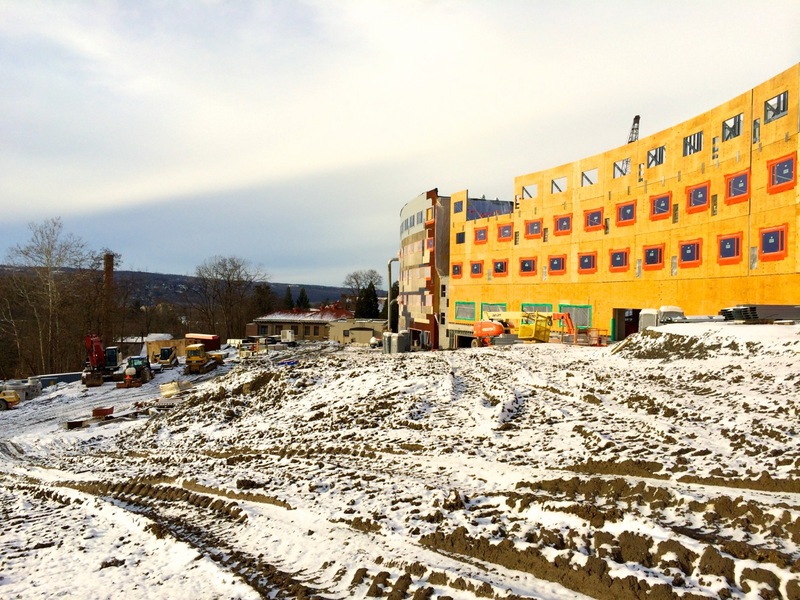 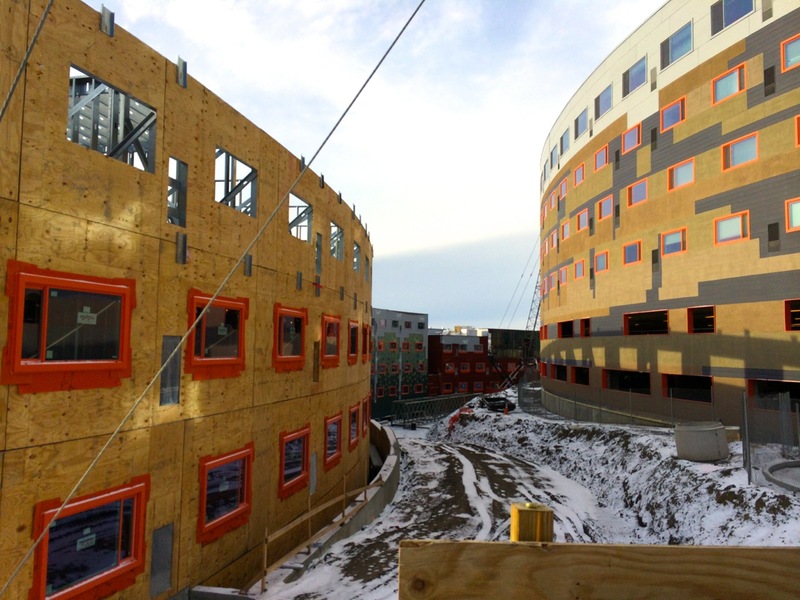 Both Building 5 and Building 6 have temporary heating units and ducts going inside, along with plastic wrap on exposed wall frames to keep the spaces above freezing.